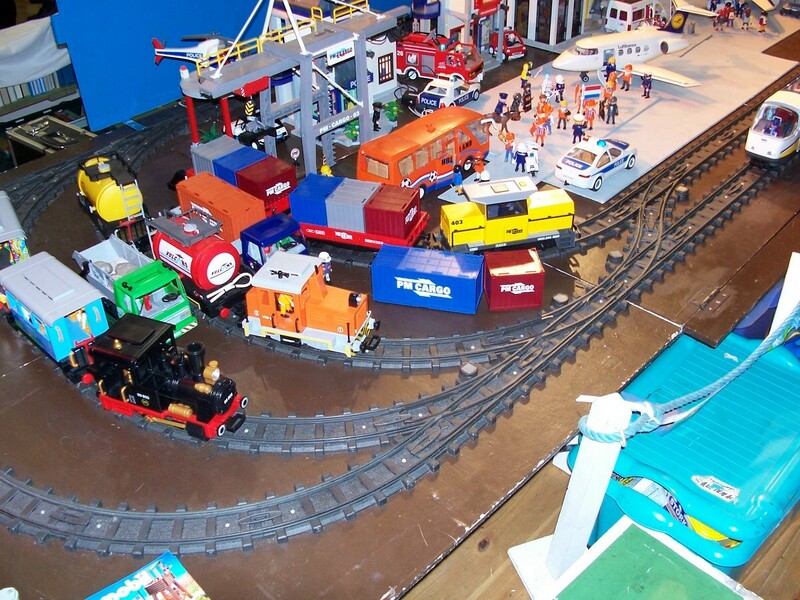 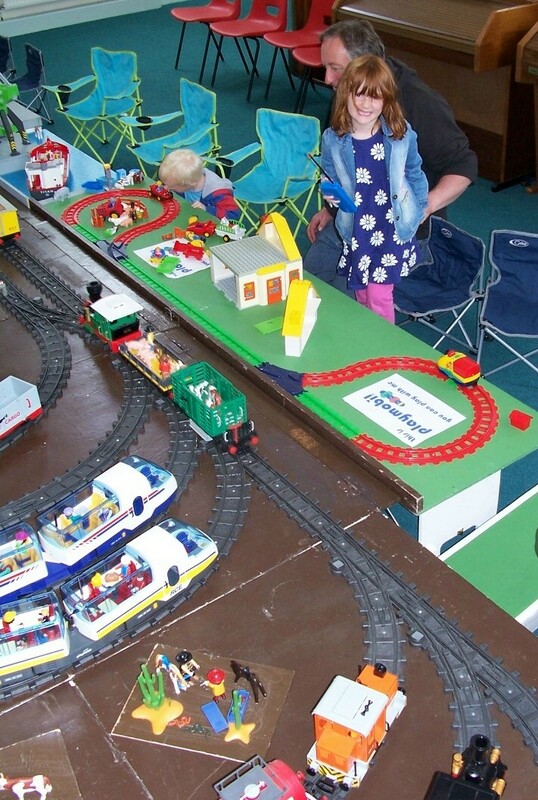 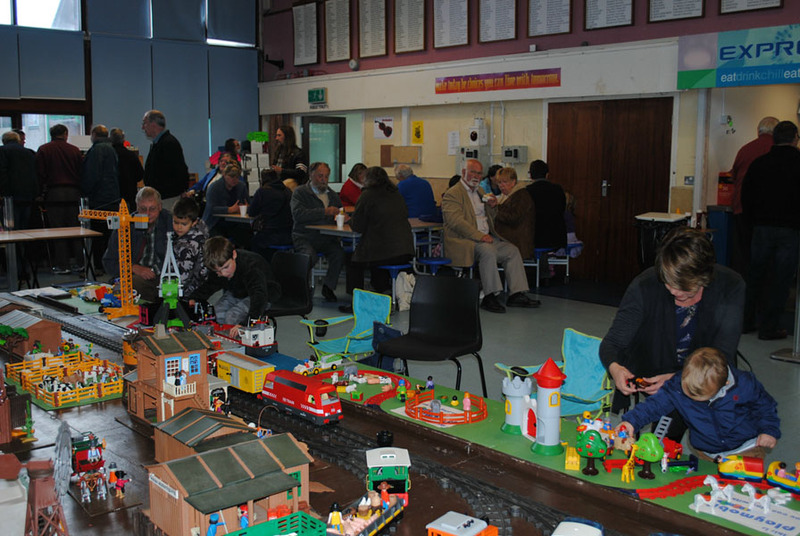 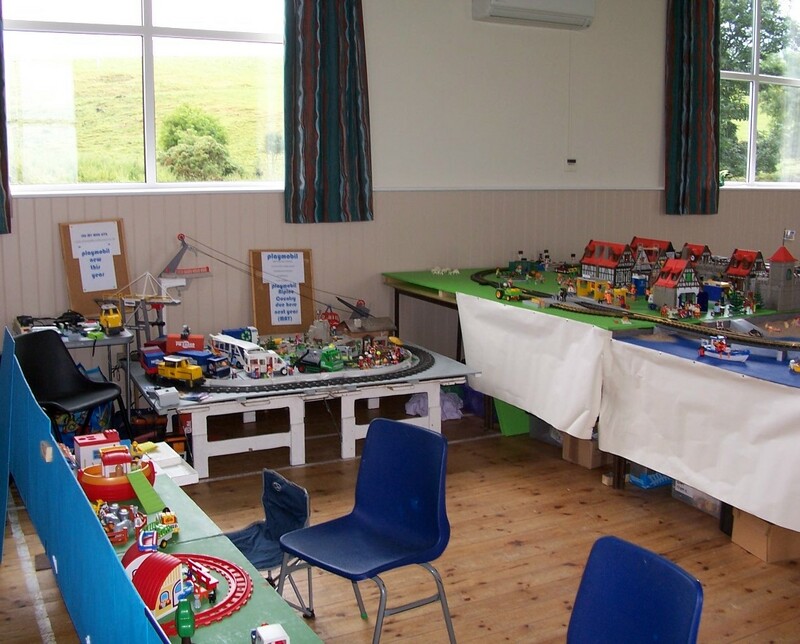 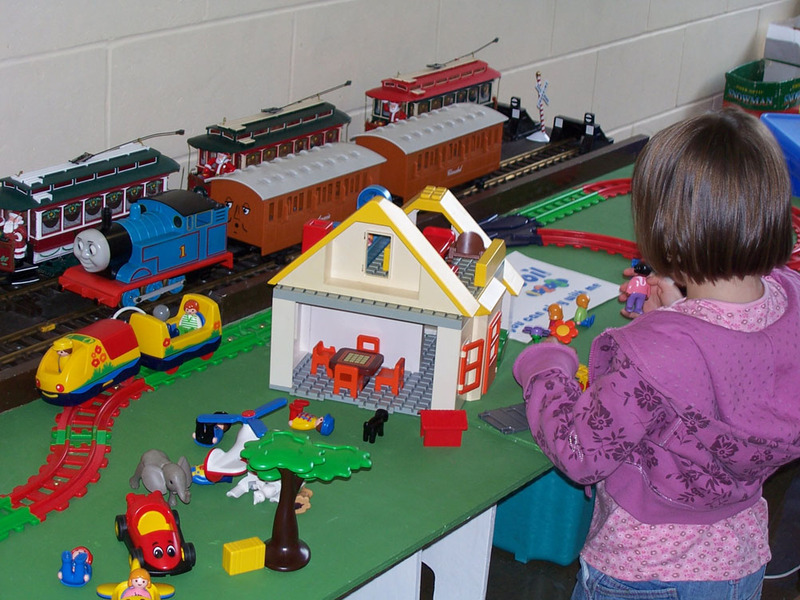 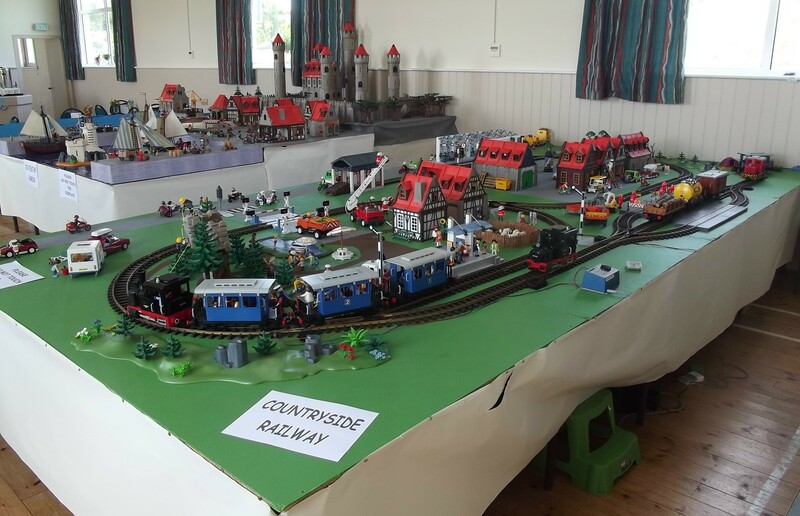 In 2005 it was noted that the boards of the old layout had started to warp, so I decided to build a new one. 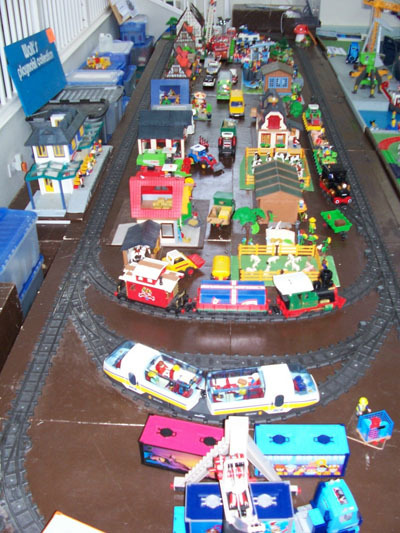 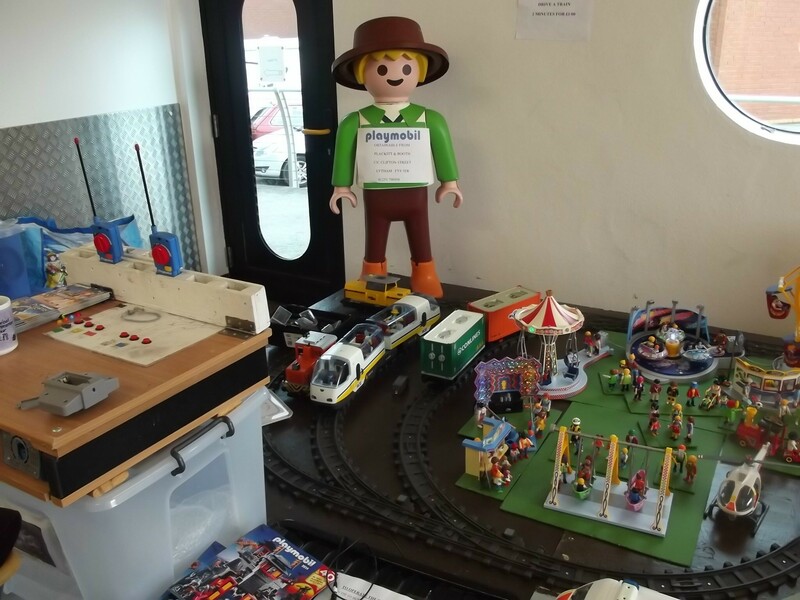 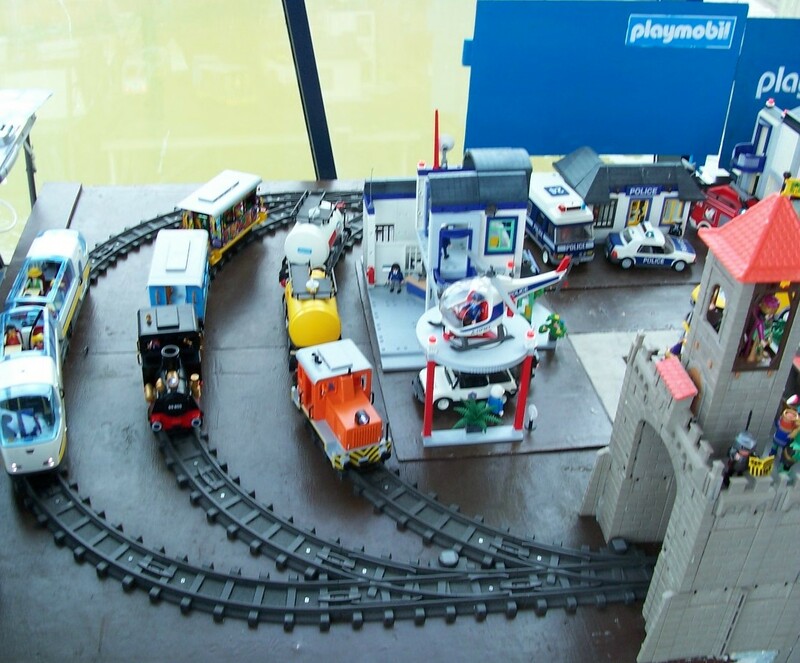 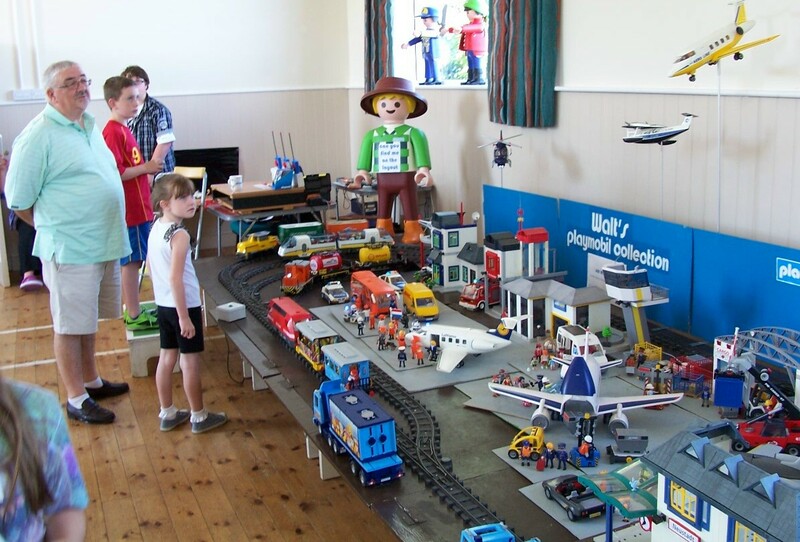 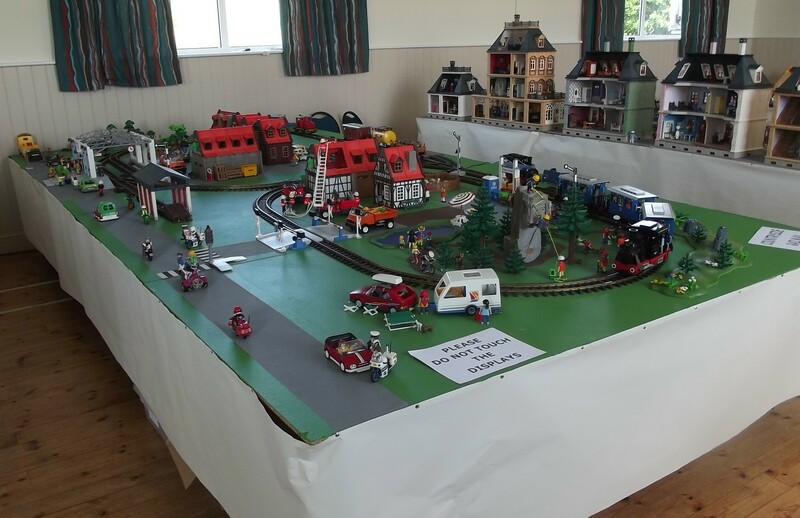 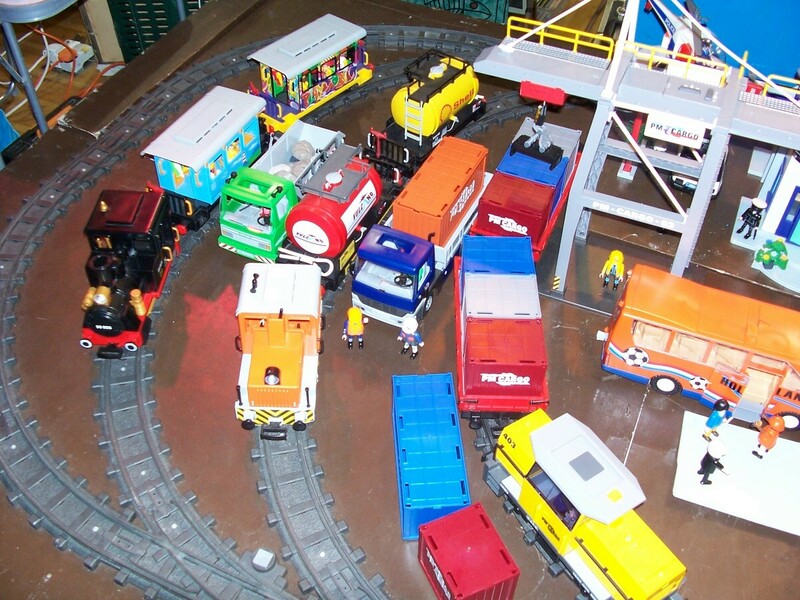 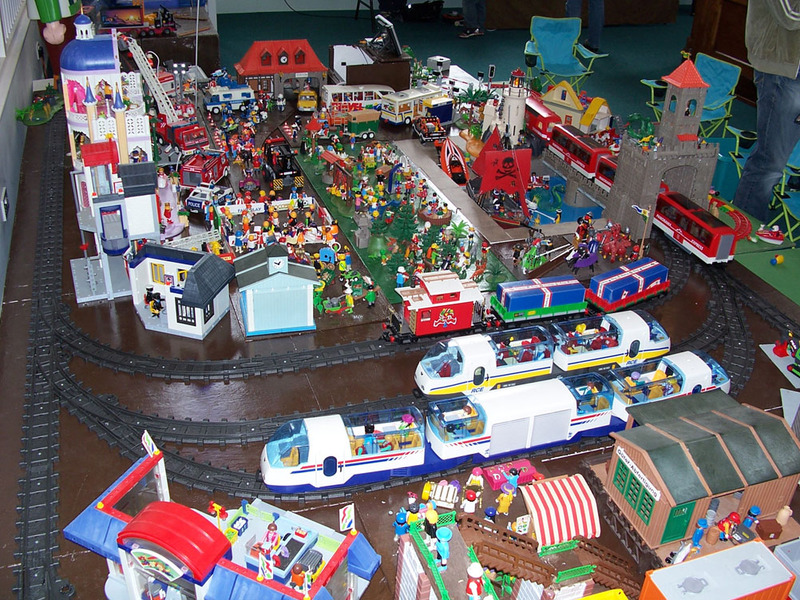 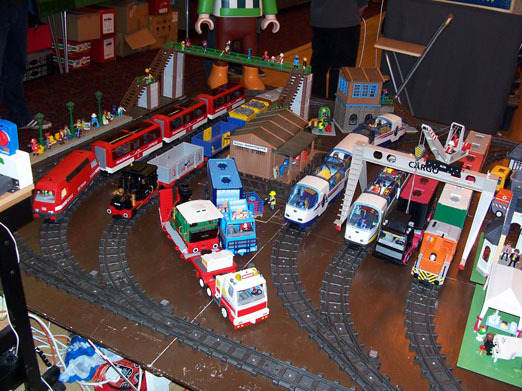 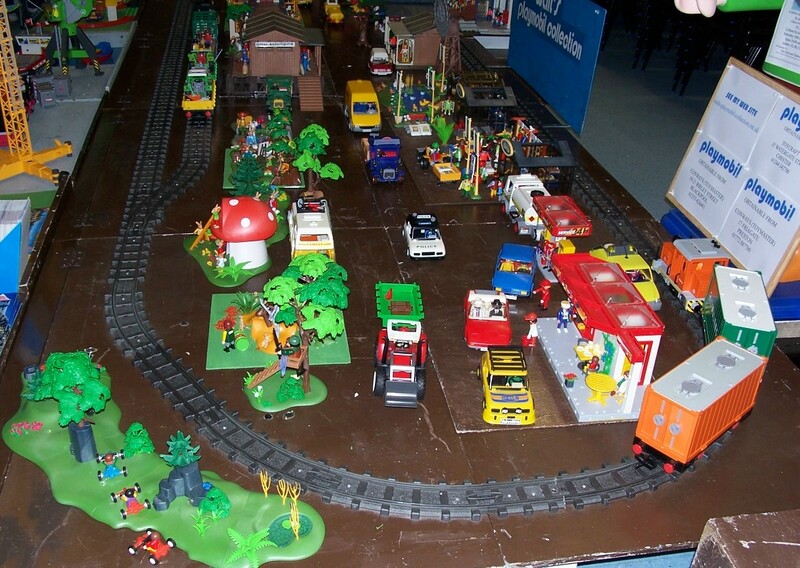 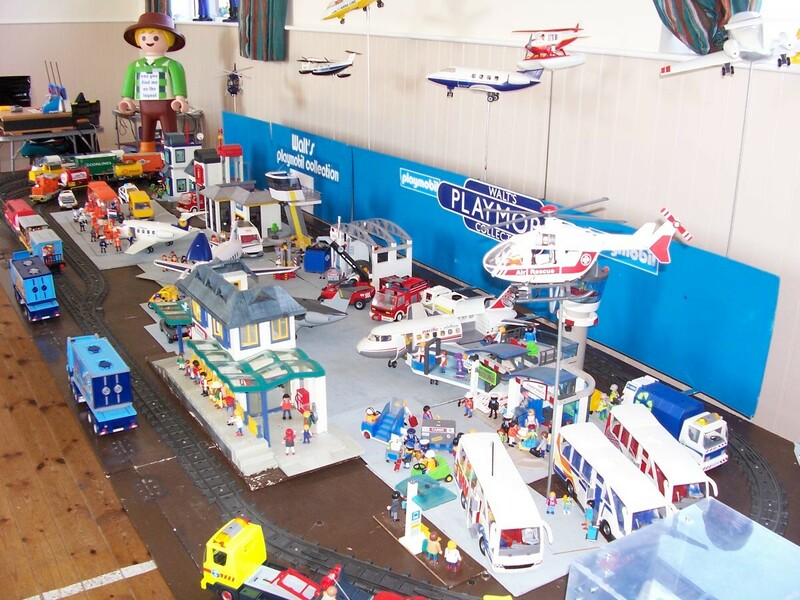 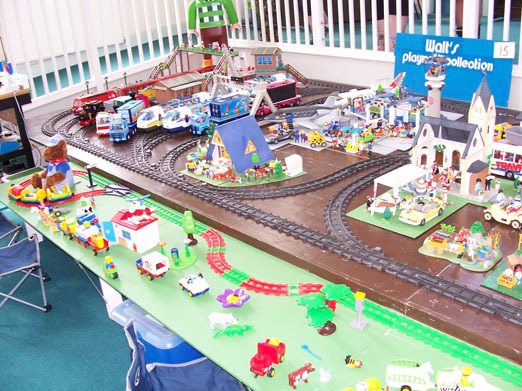 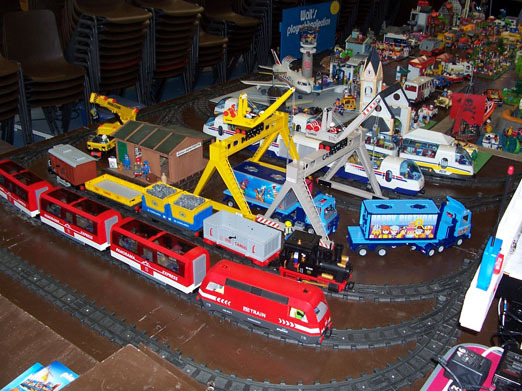 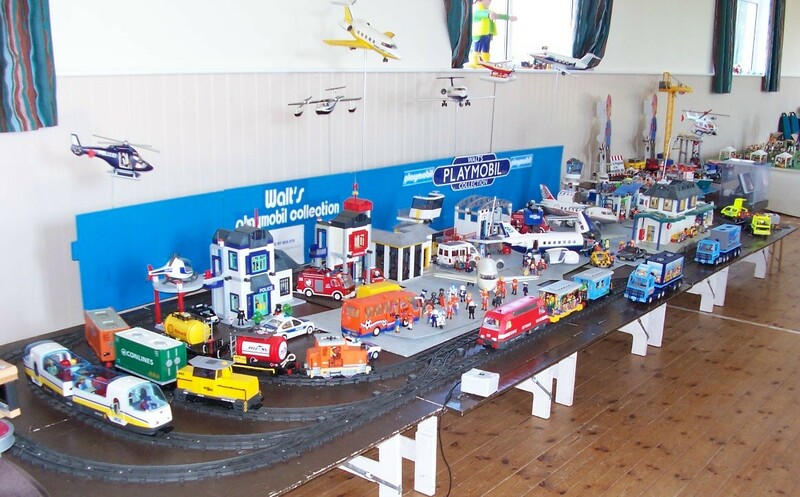 As Playmobil had now produced five radio controlled trains the new layout would be made so that it could accommodate all of them. 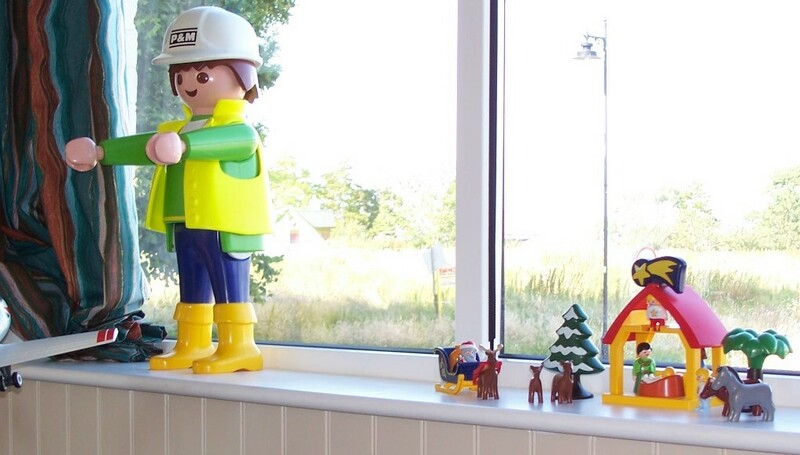 5 feet 4 inches (162cm). 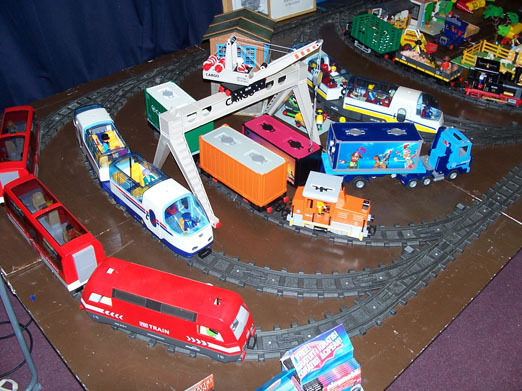 Using only the corner boards shown in red on the plan that are four feet (122cm) long so the minimum length would be eight feet (244cm), and would allow three trains to be run. 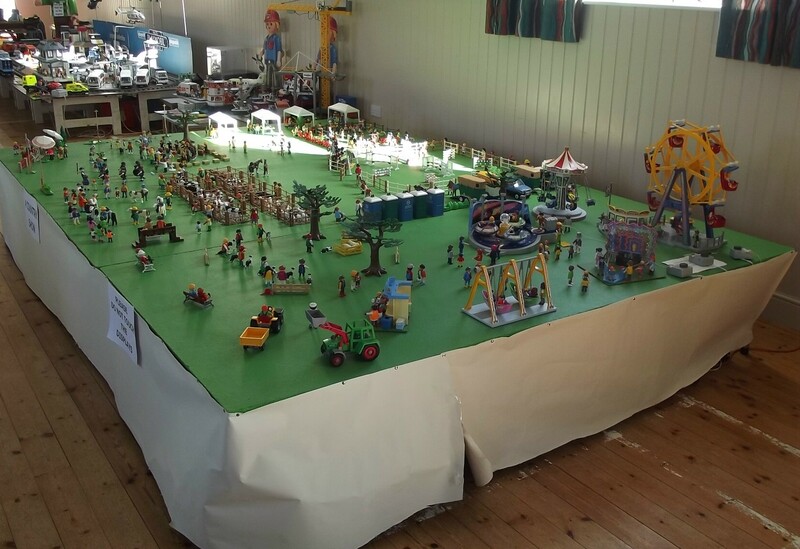 4 feet 2¼ inches (128cm). 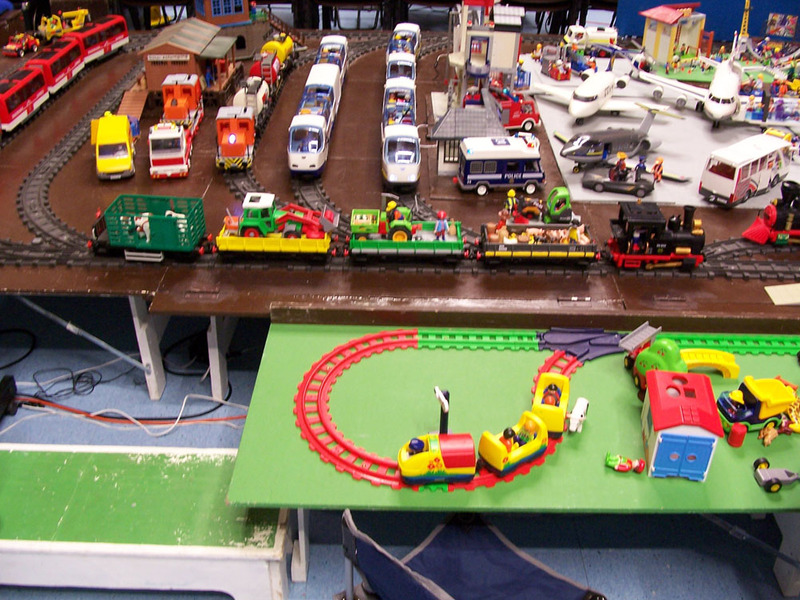 The longest length of the layout being 30 feet (922cm). 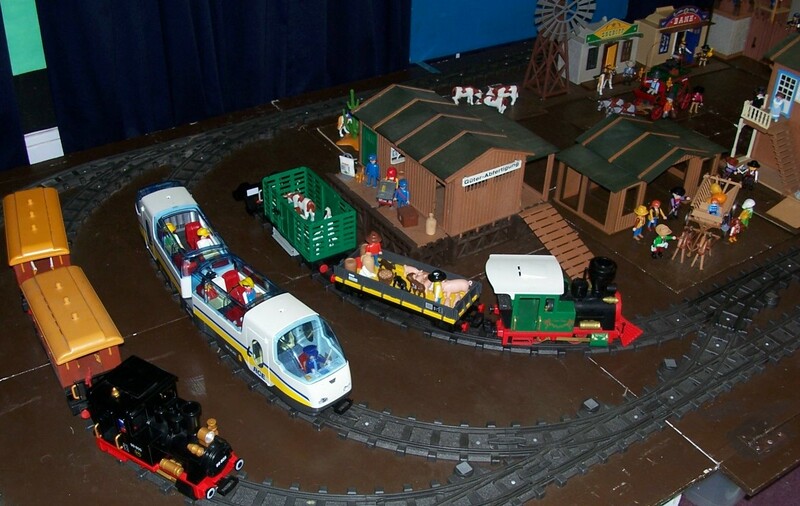 If the boards were used with the centre section removed then short trains would be run. 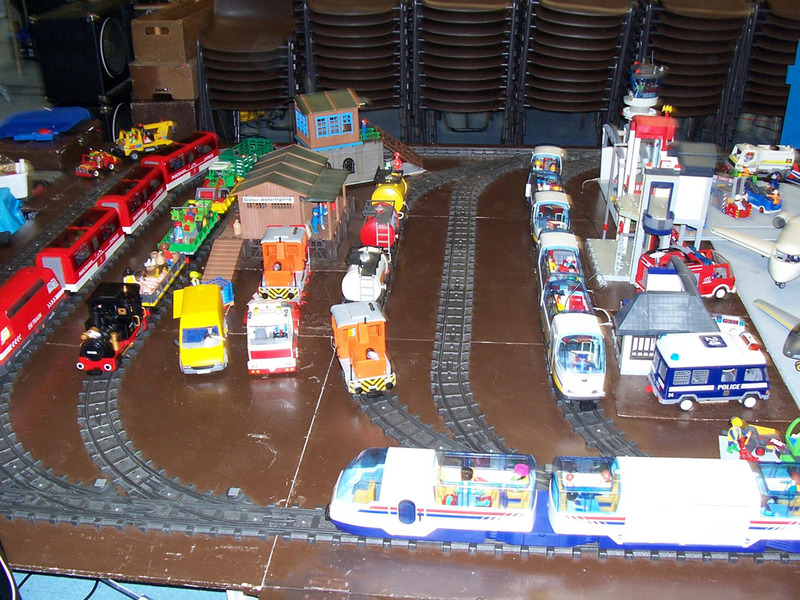 Depending on the length of the boards would depend how many trains I was able to run. 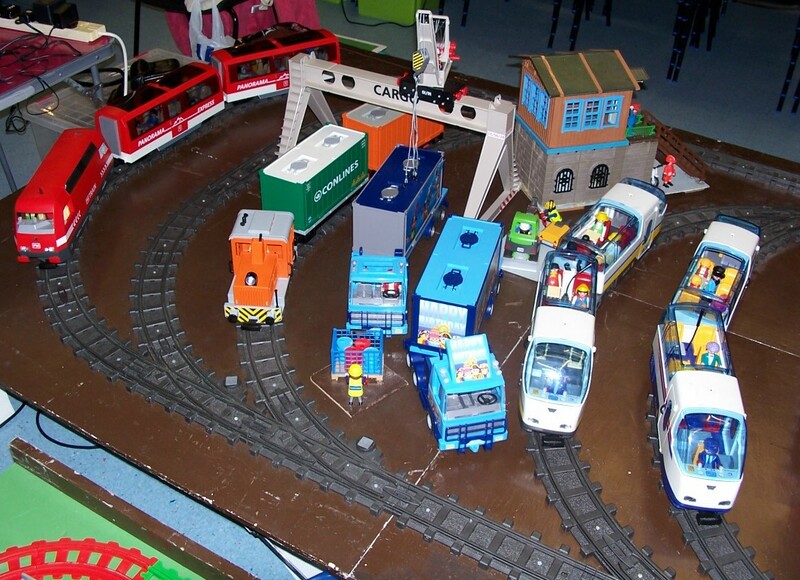 The points at the back of the layout had point motors fitted so that the trains could be directed into the correct siding after running. 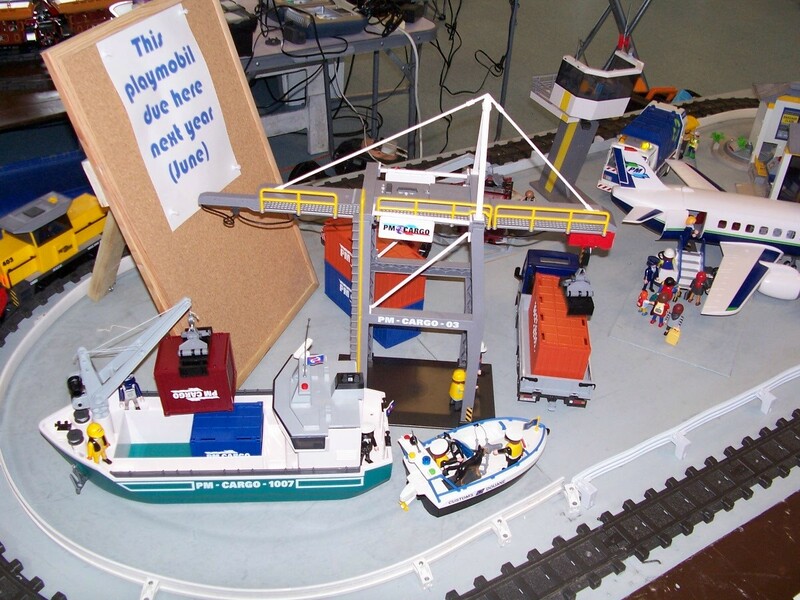 The first us of the full depth layout was in May 2007 and with the centre section removed in June 2007. 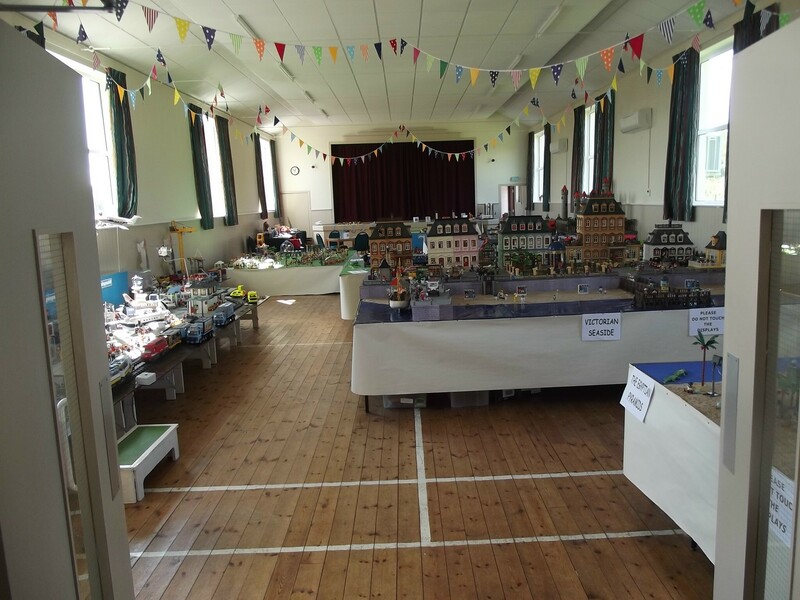 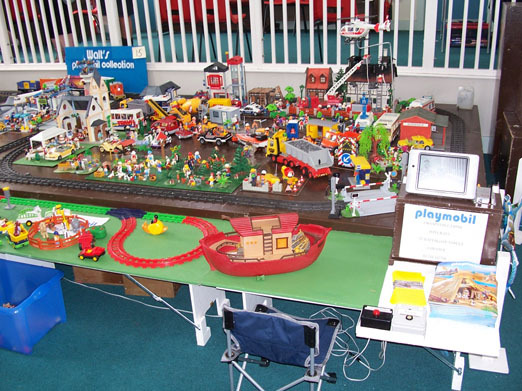 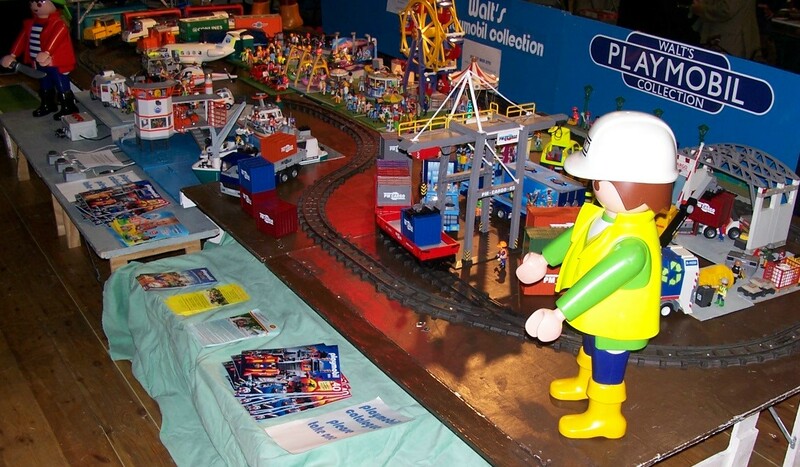 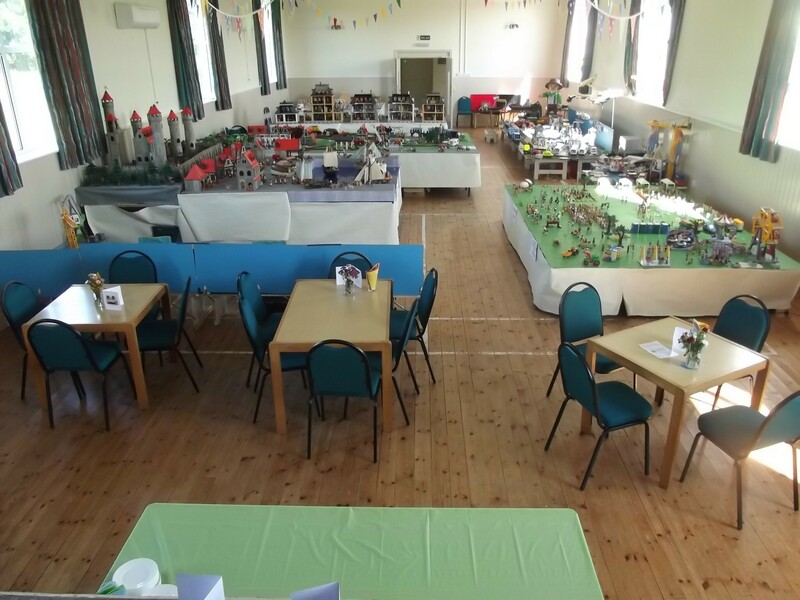 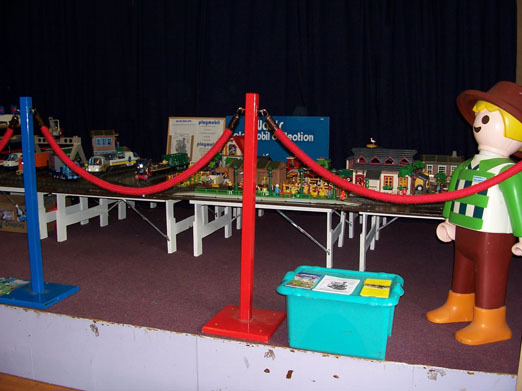 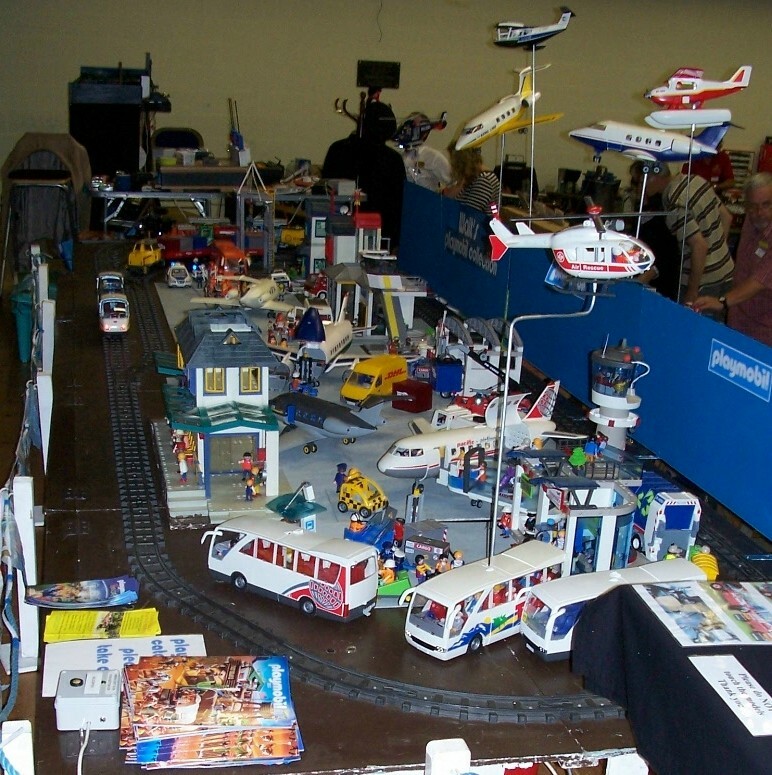 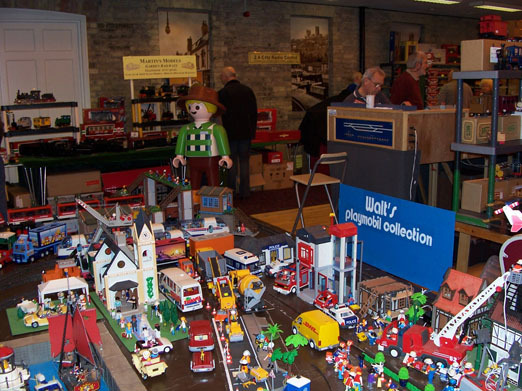 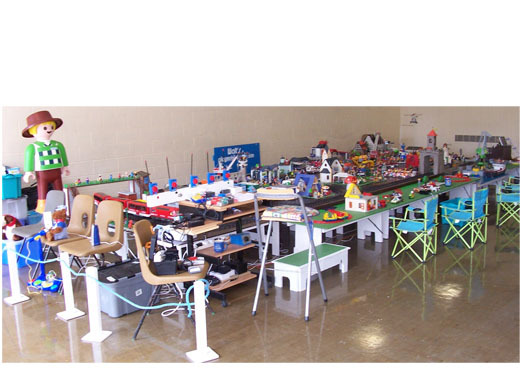 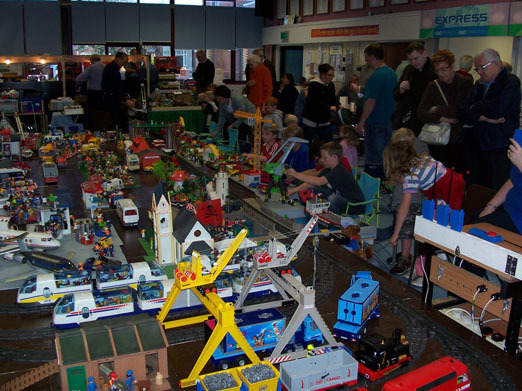 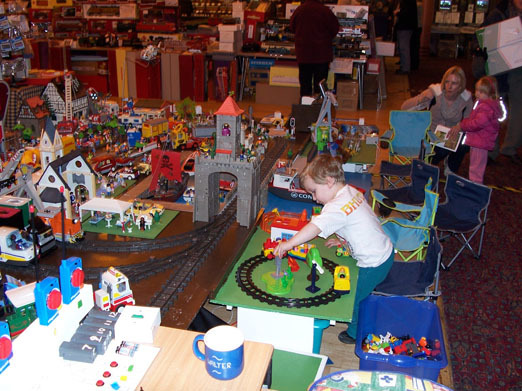 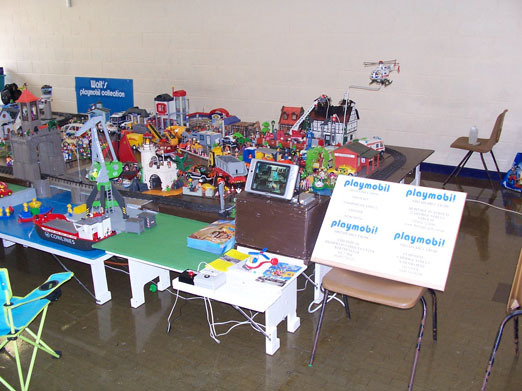 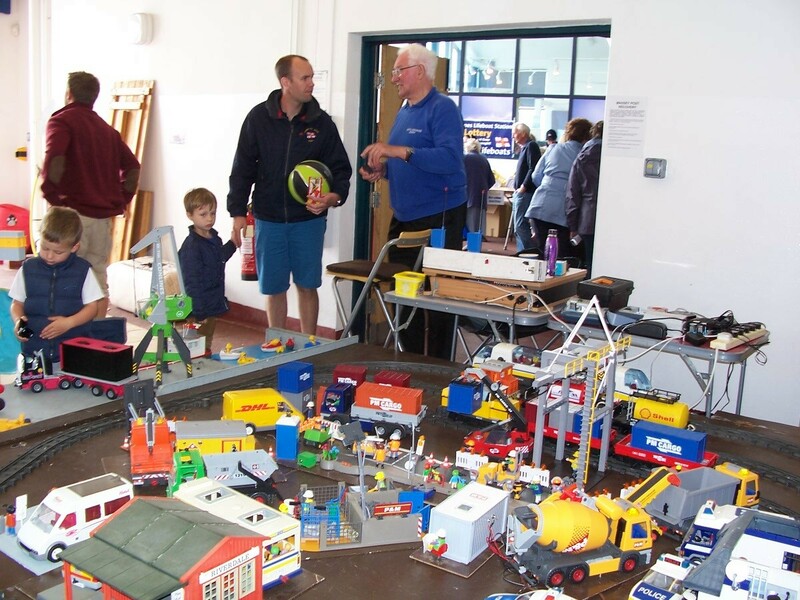 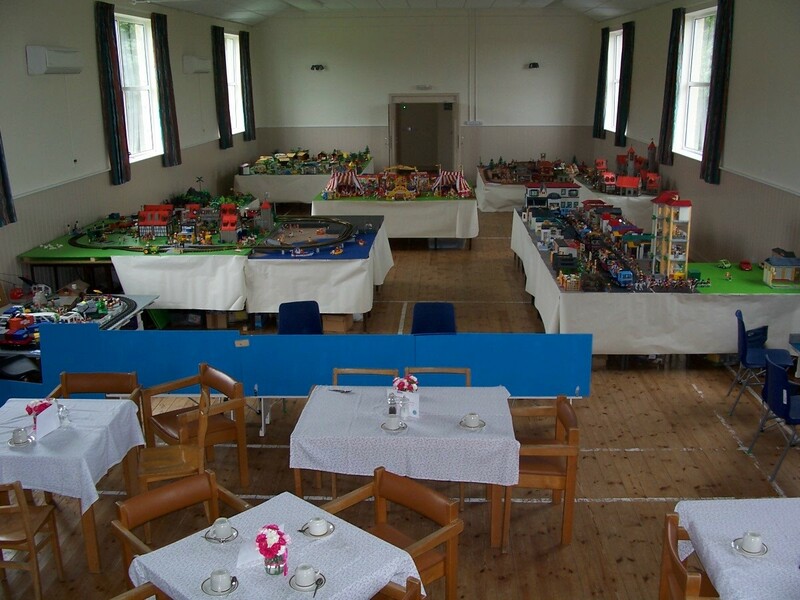 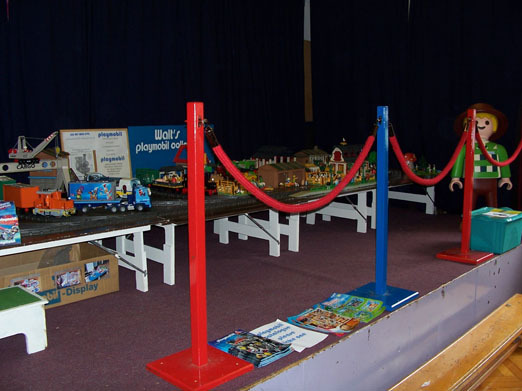 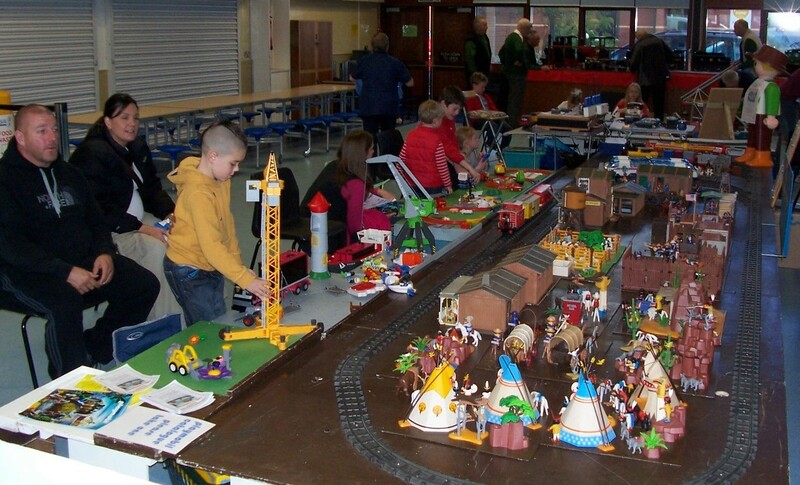 The full layout going to the exhibition Lytham in October 2007. 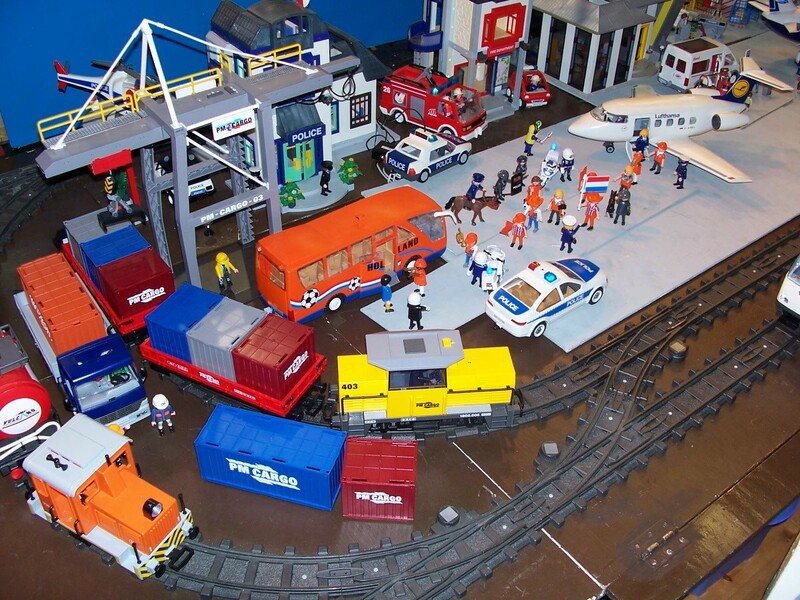 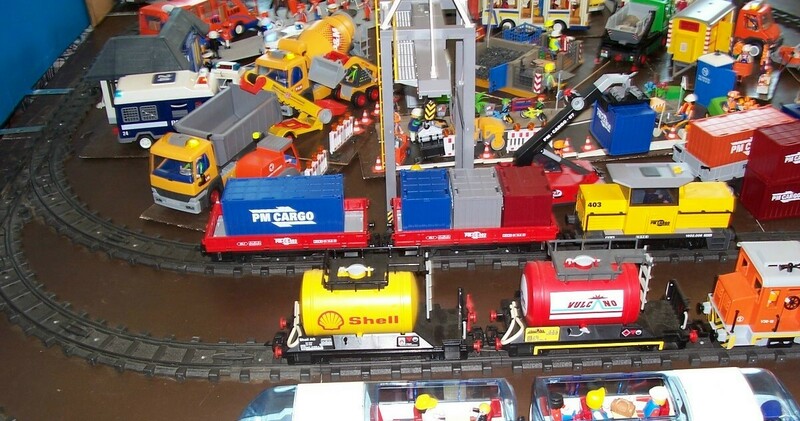 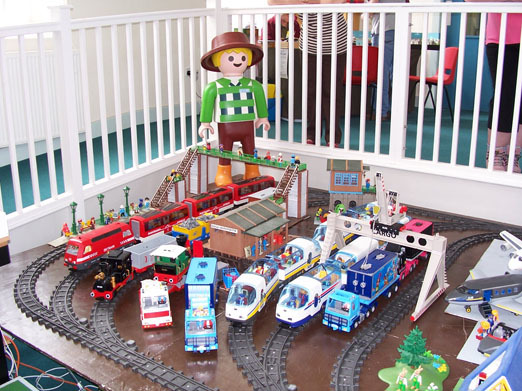 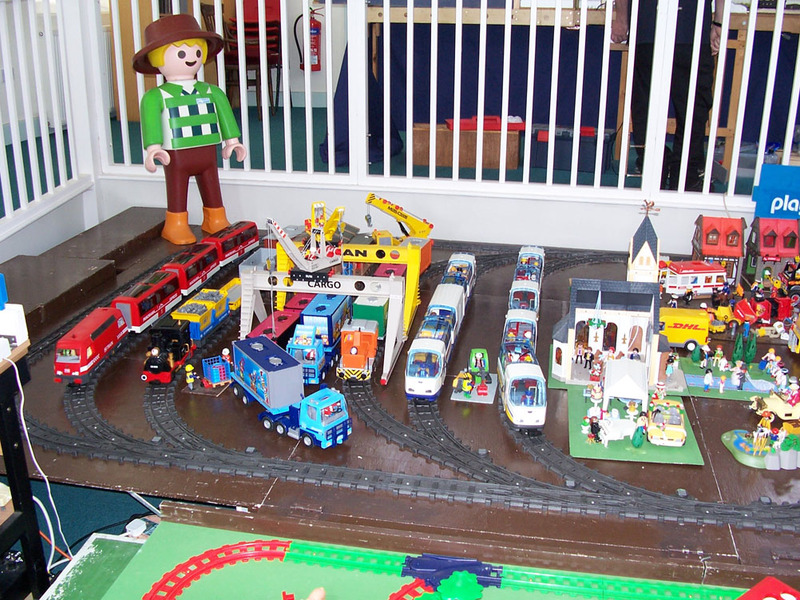 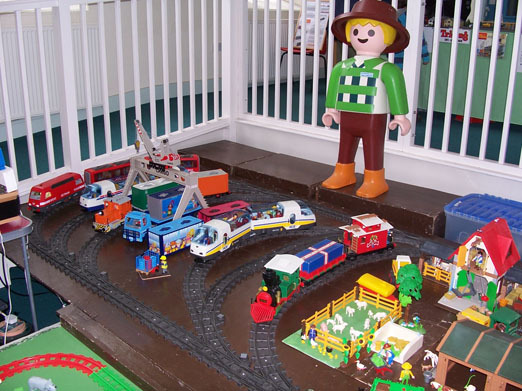 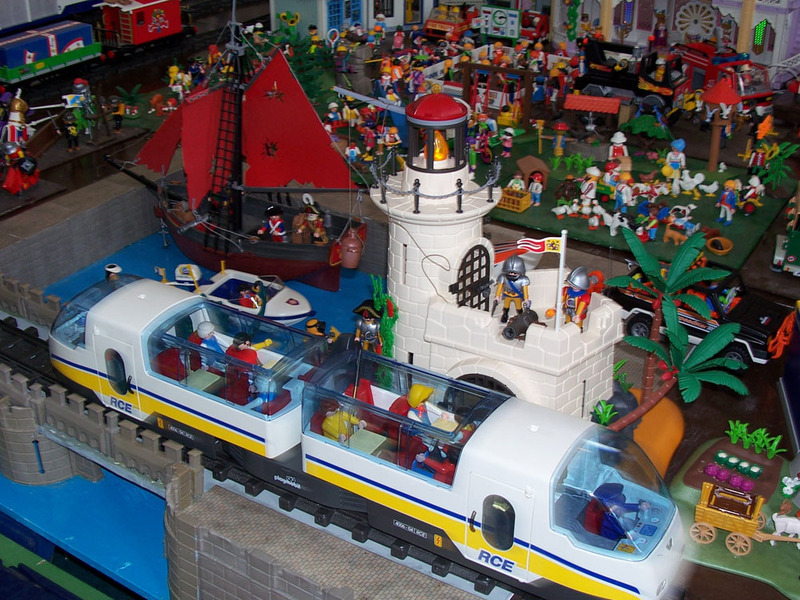 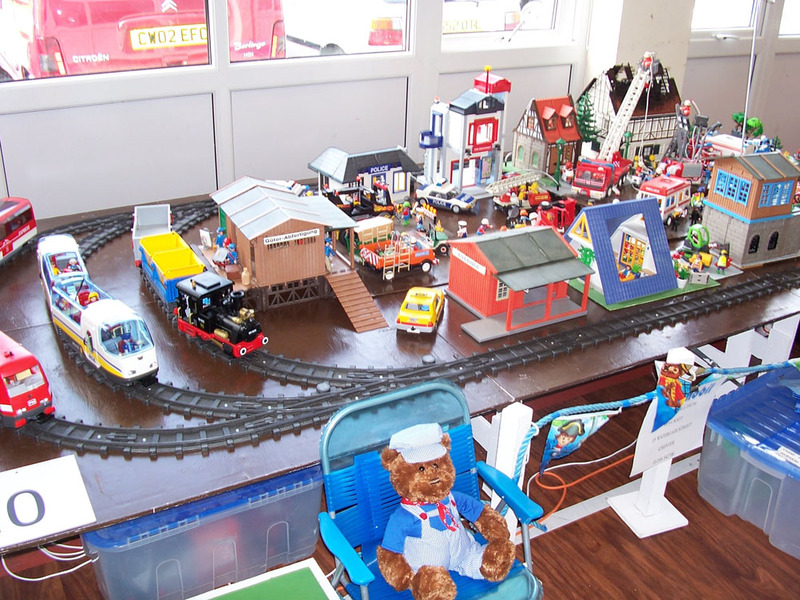 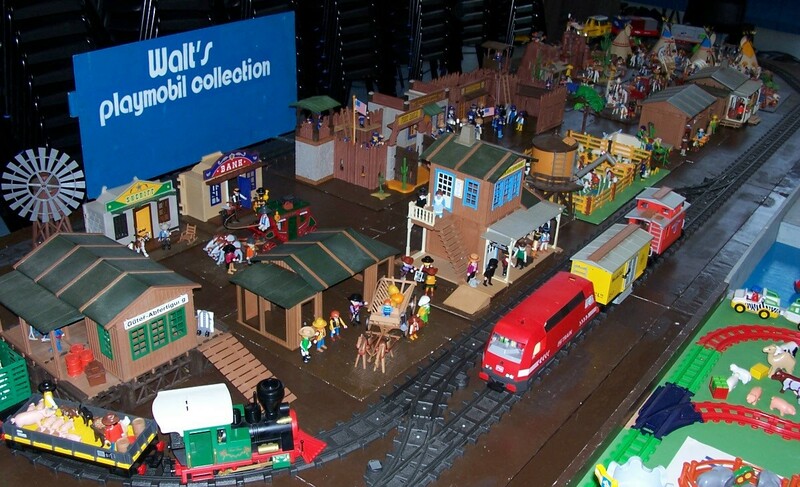 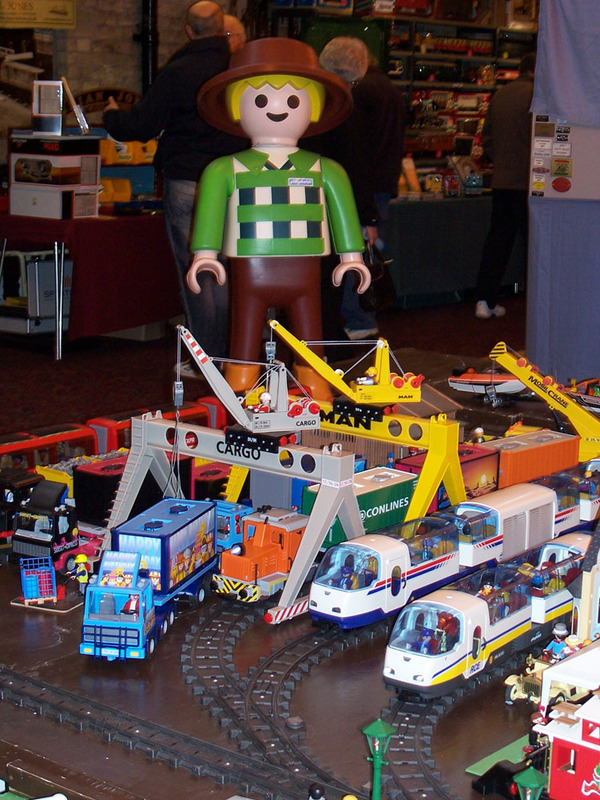 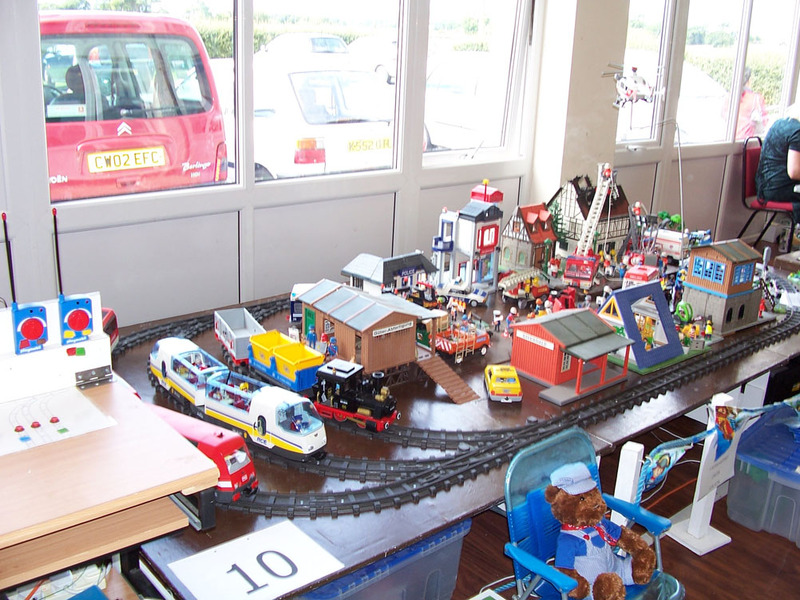 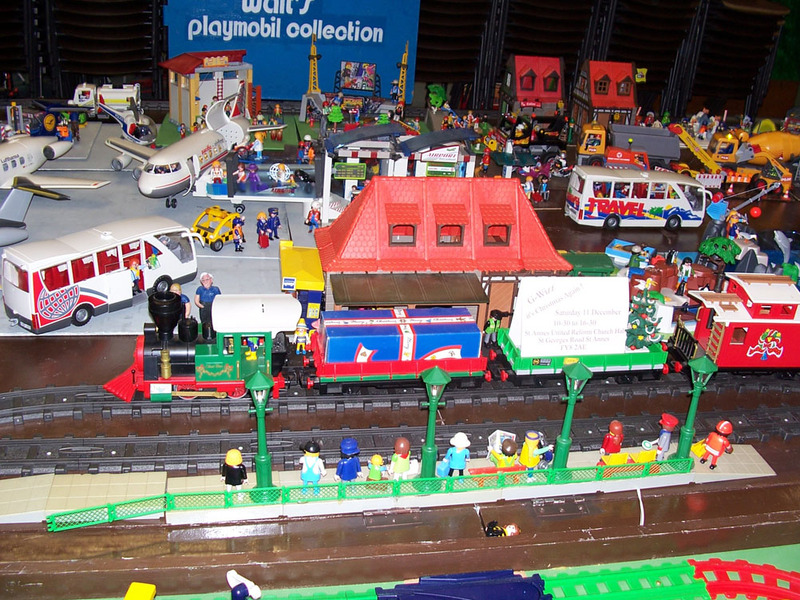 However in September Playmobil brought out a sixth radio controlled locomotive. 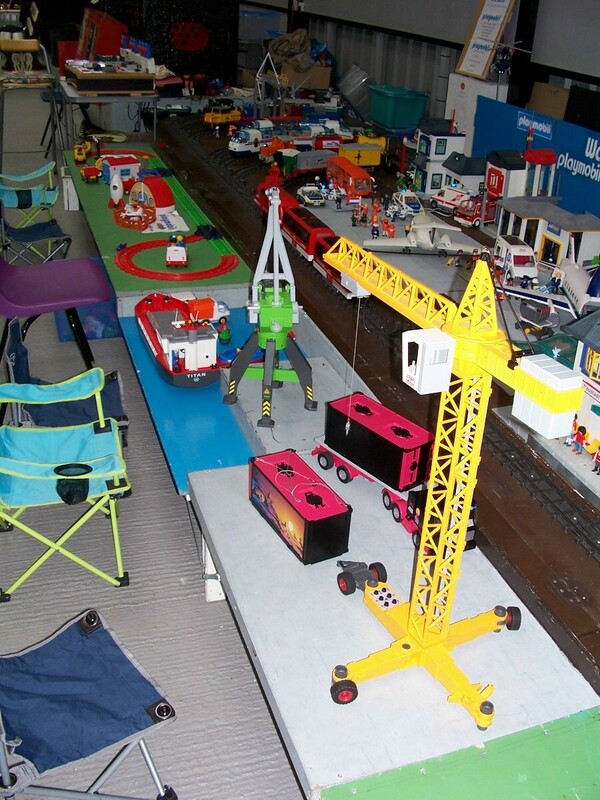 Alterations have since taken place so that this can be run when there in a layout of 19 feet or longer. 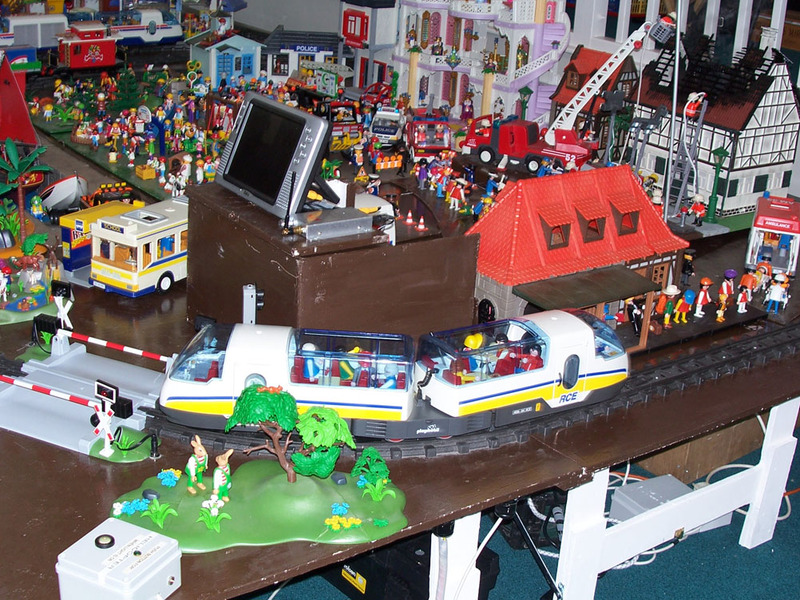 The control desk is put in front on the left hand side. 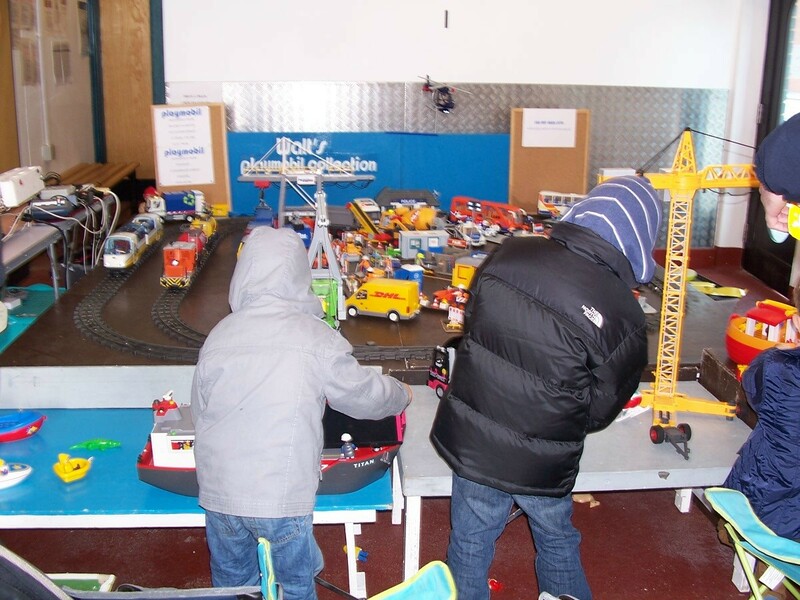 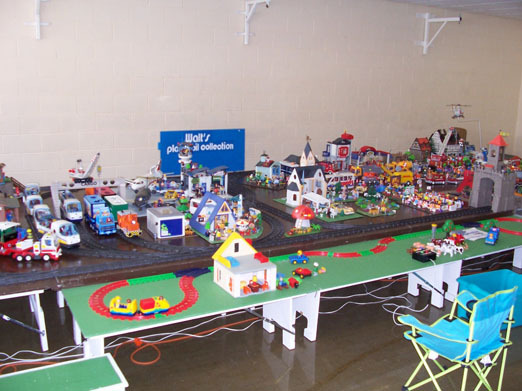 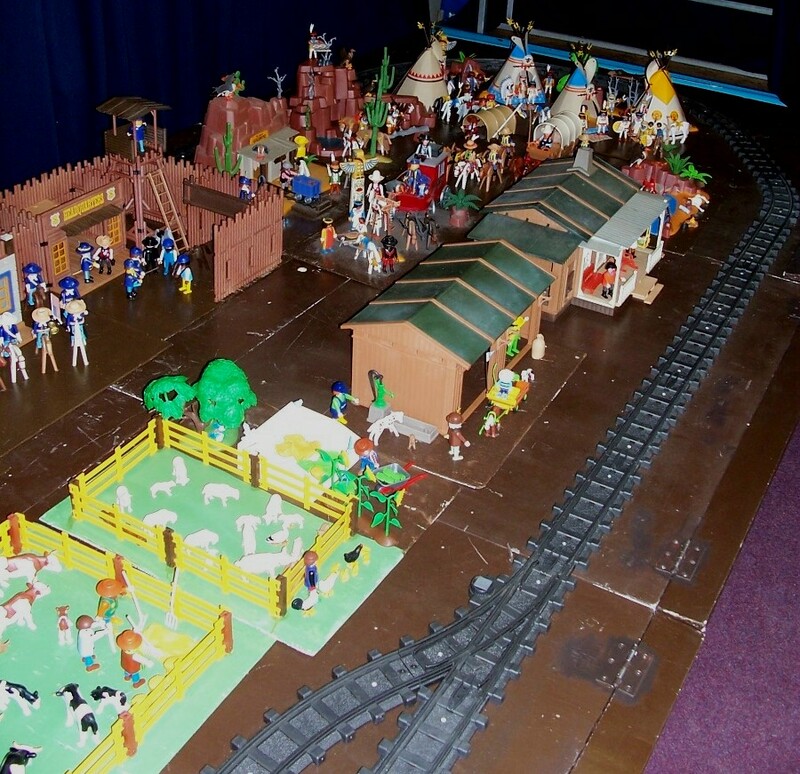 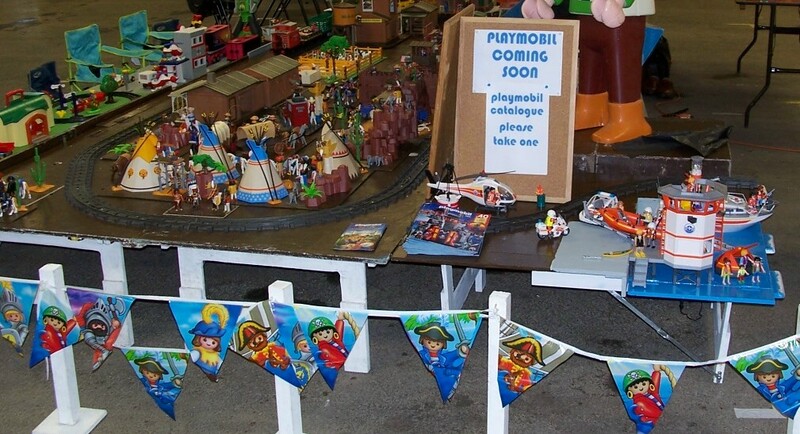 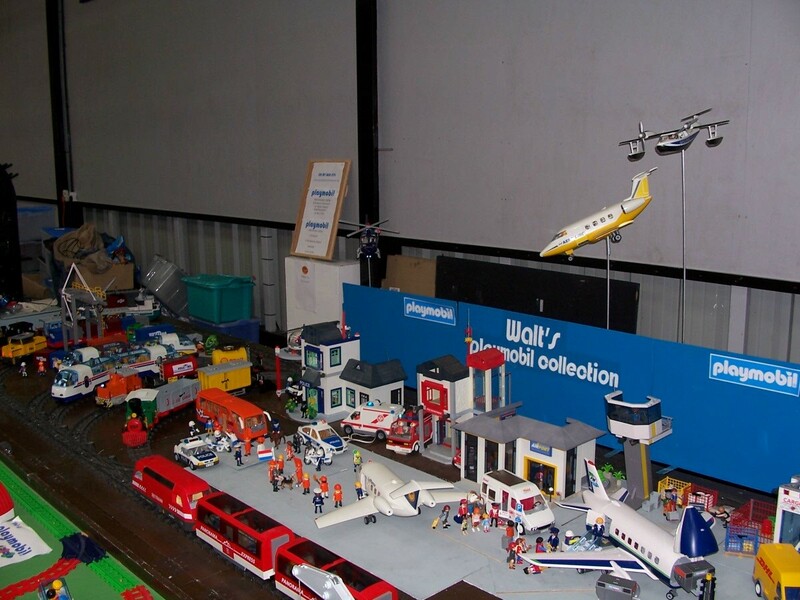 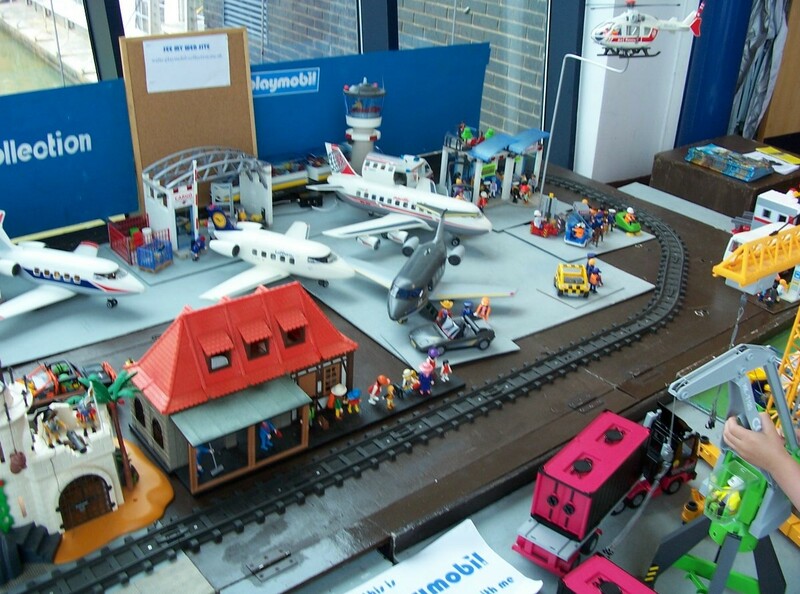 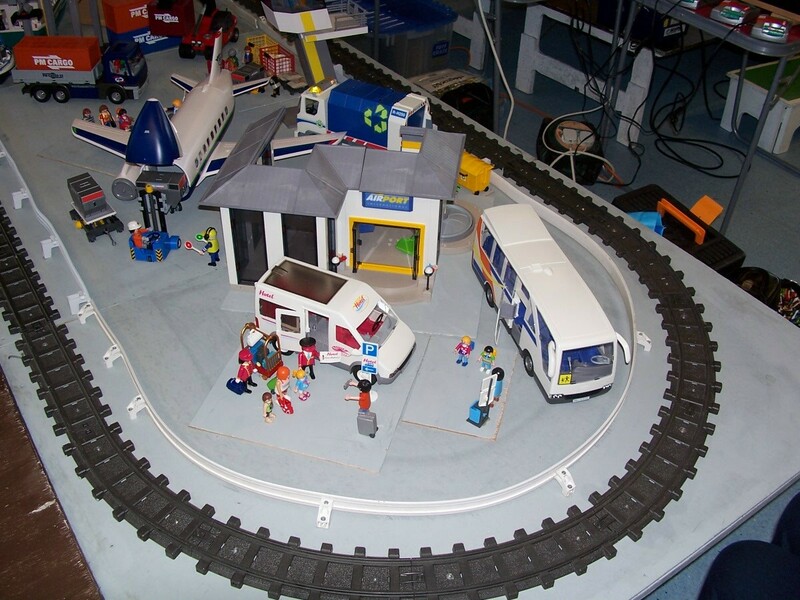 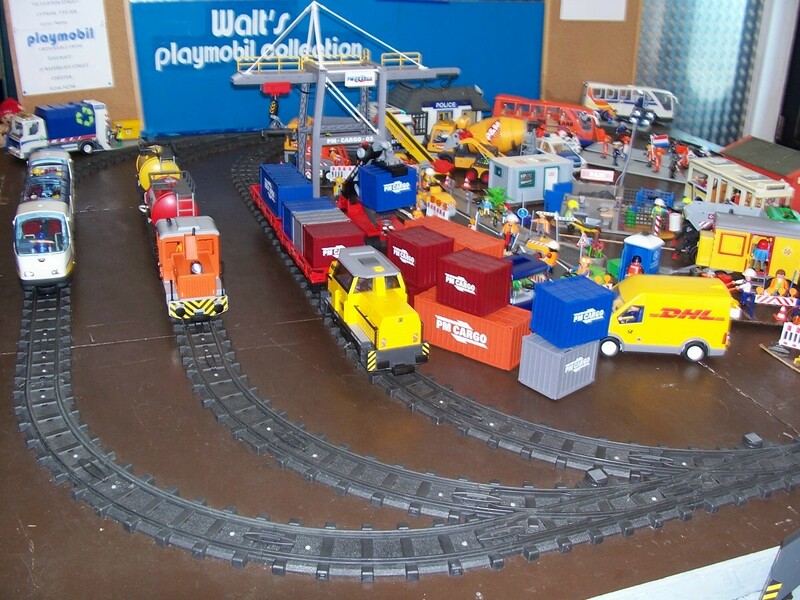 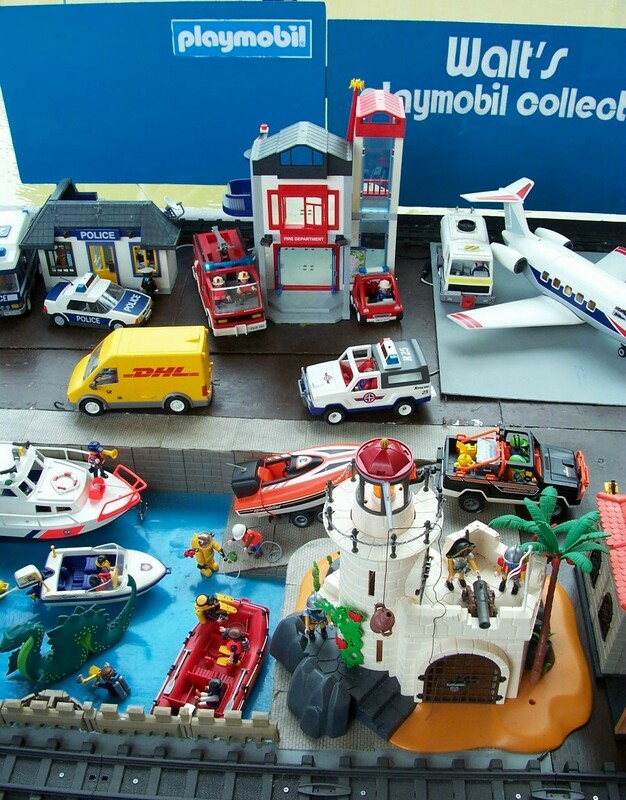 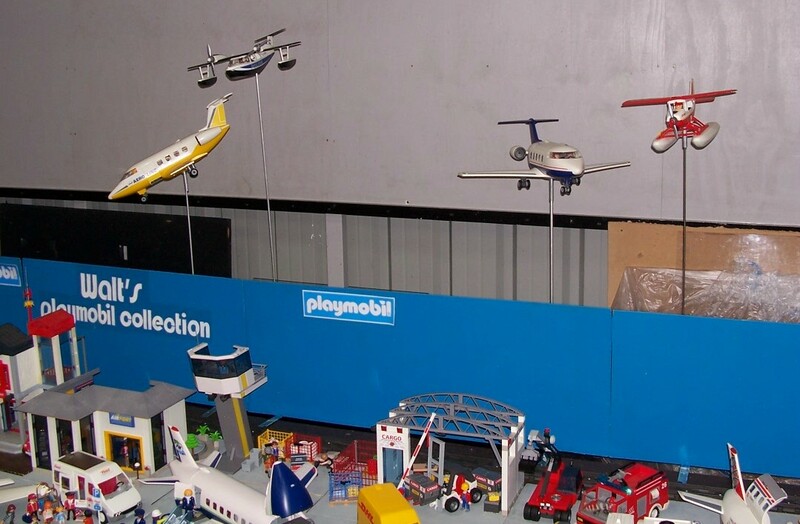 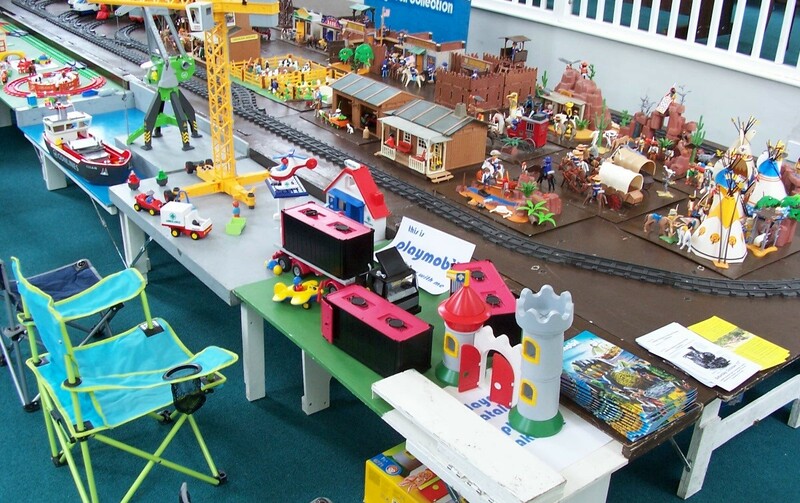 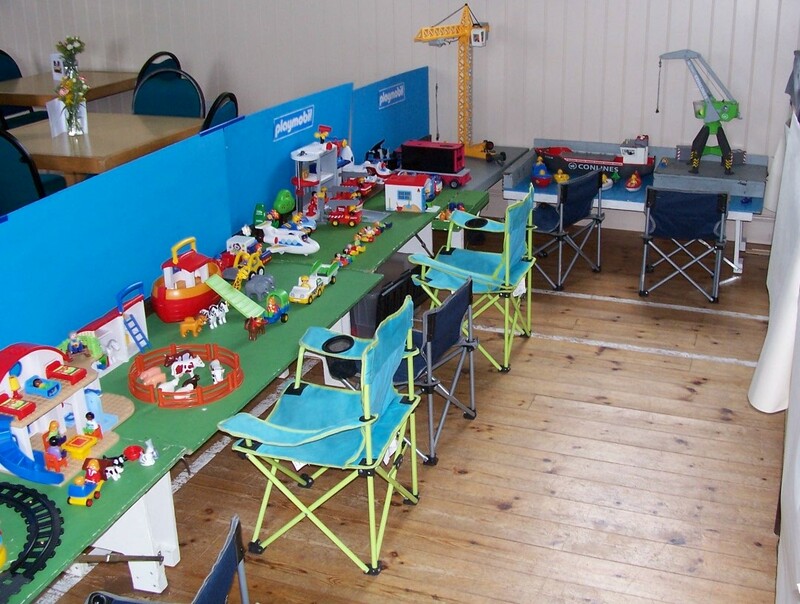 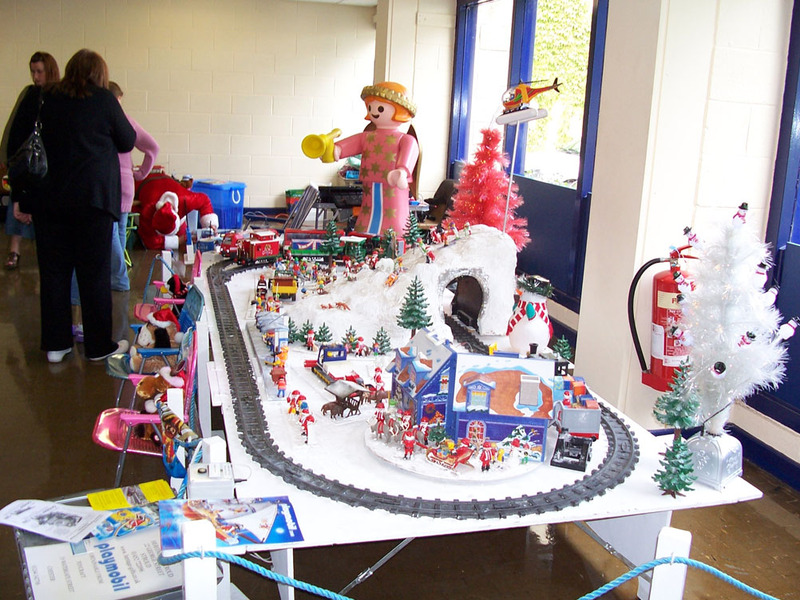 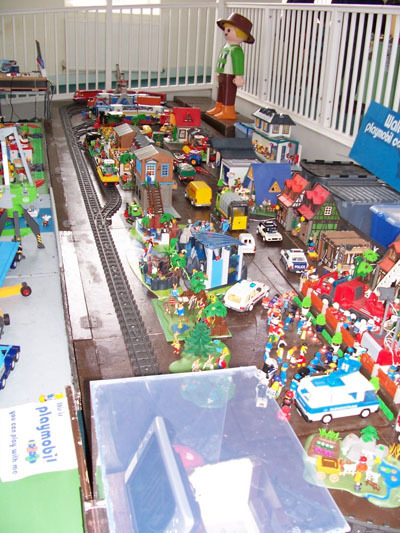 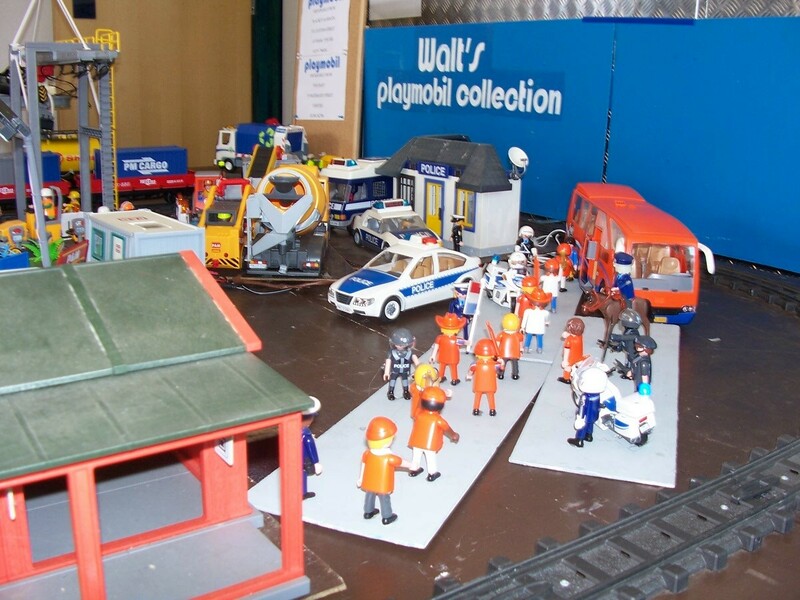 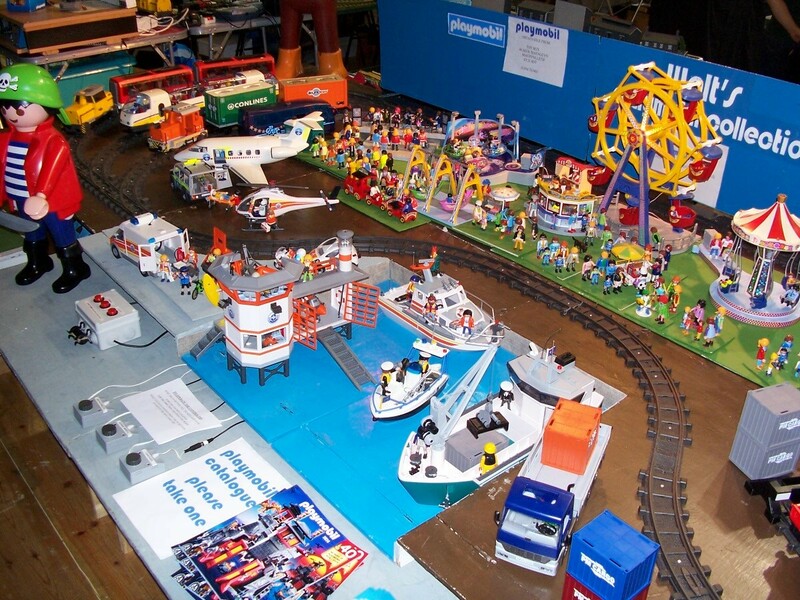 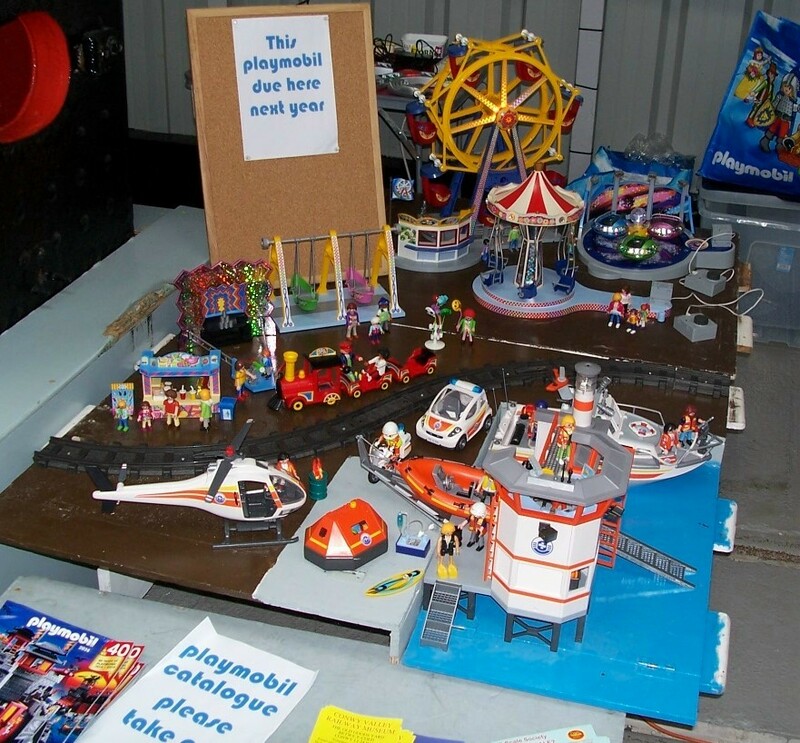 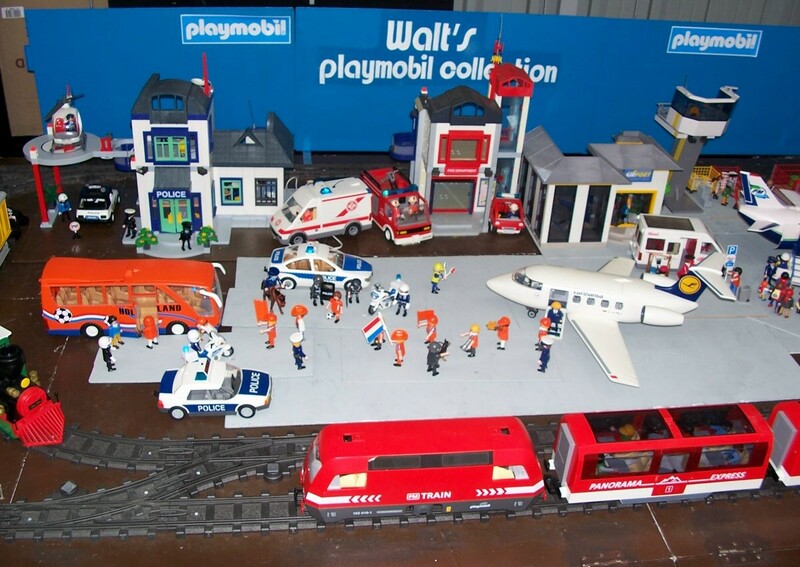 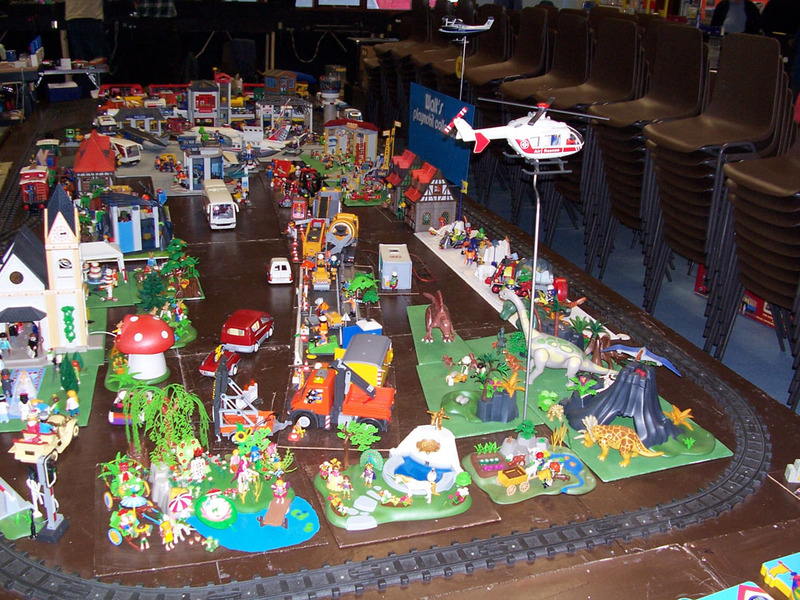 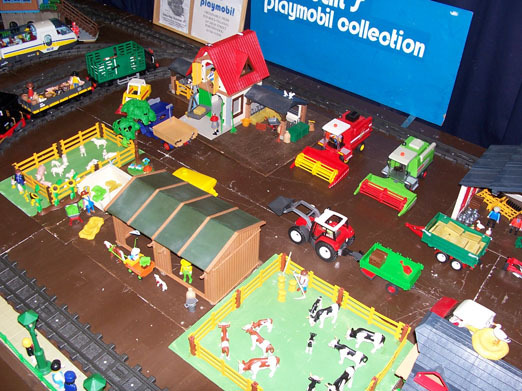 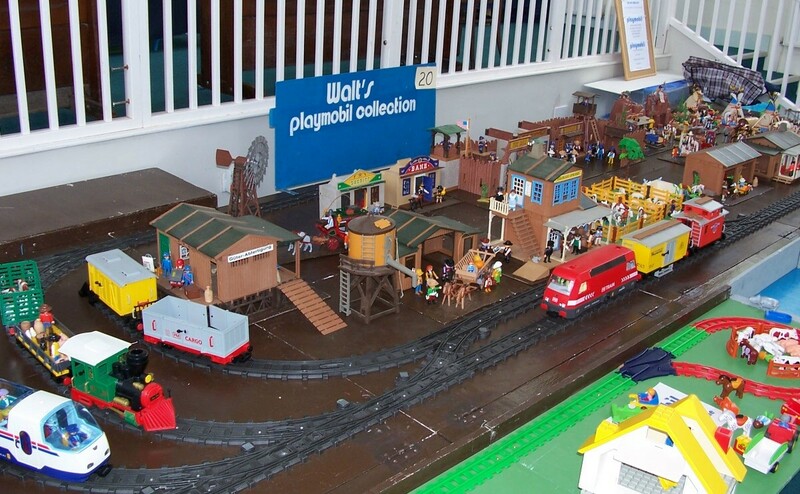 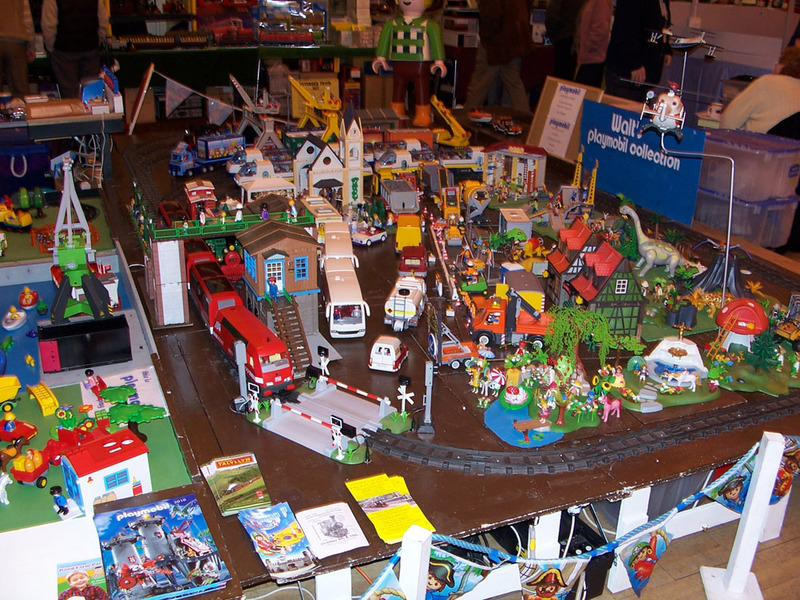 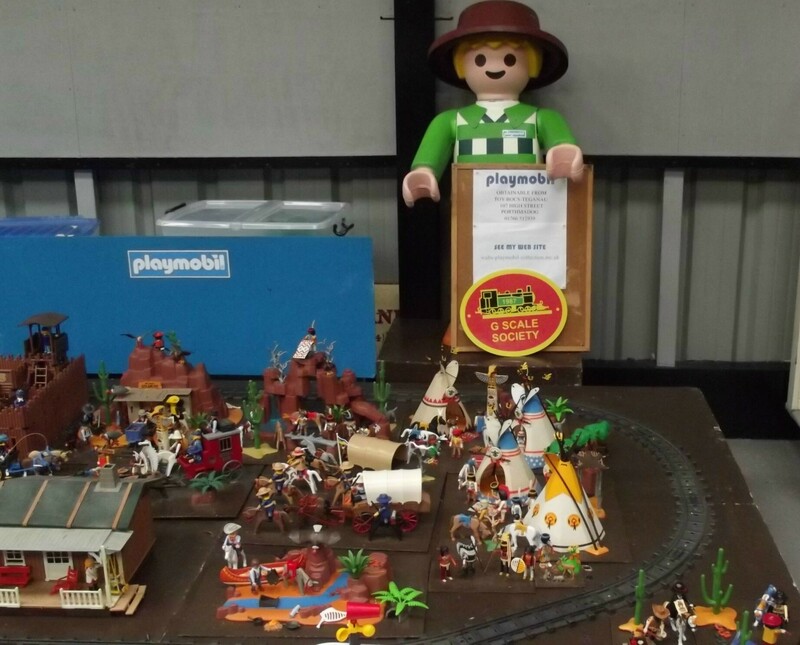 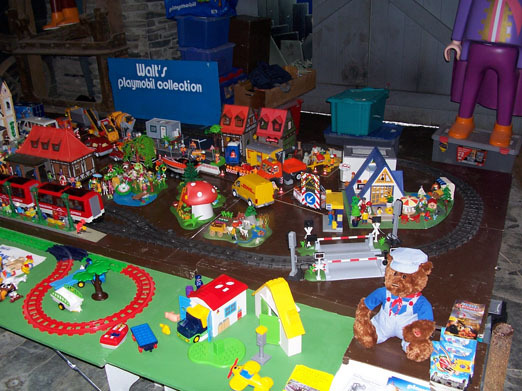 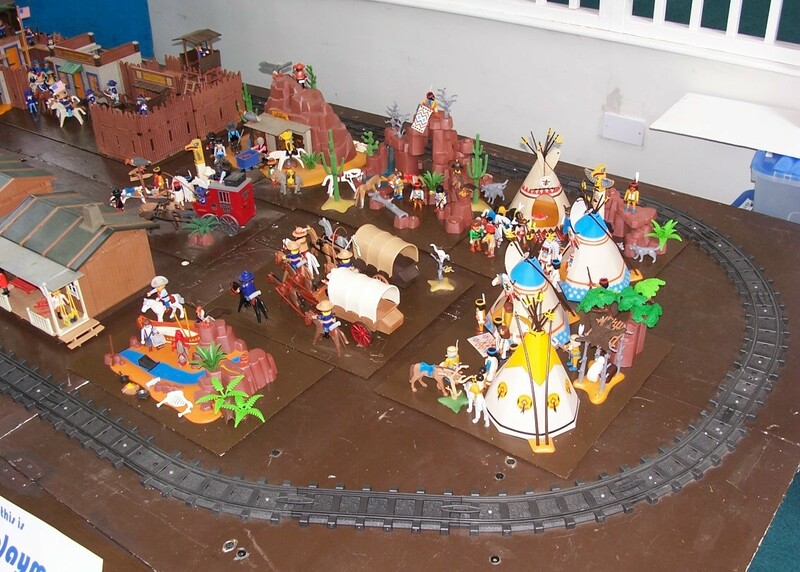 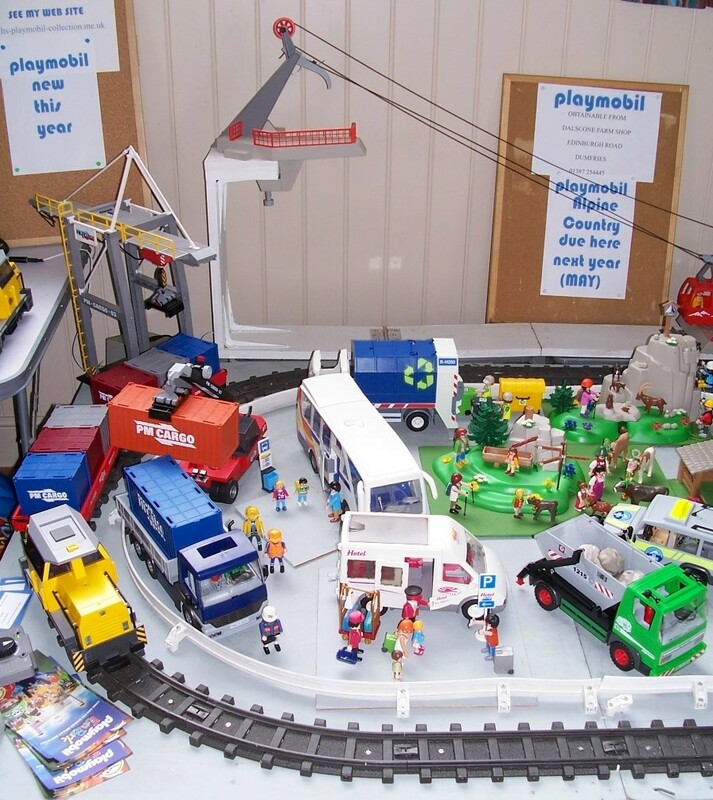 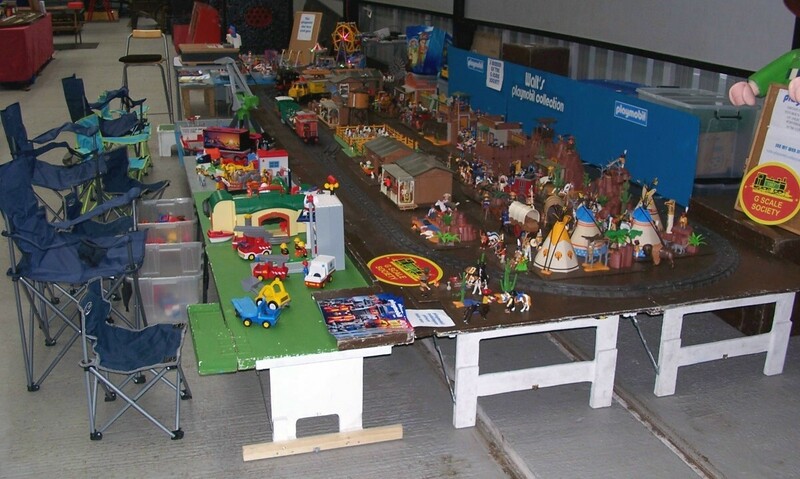 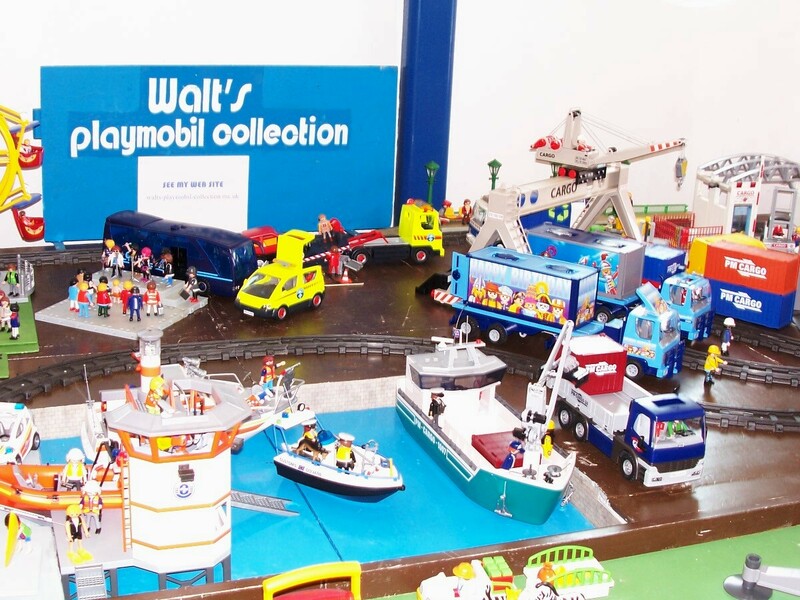 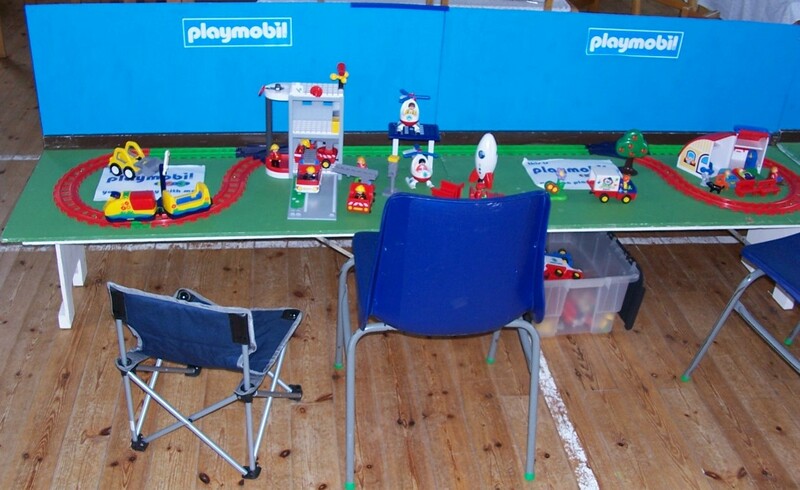 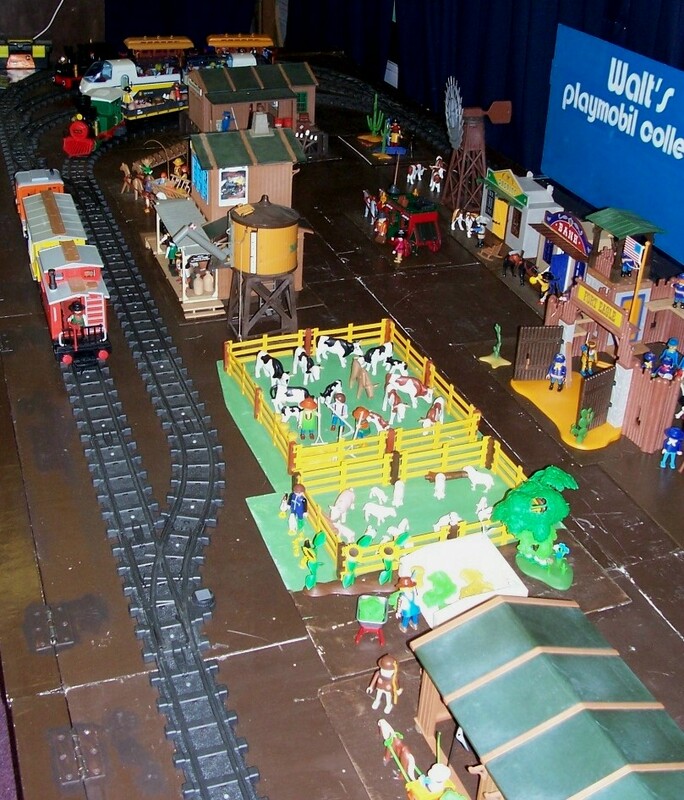 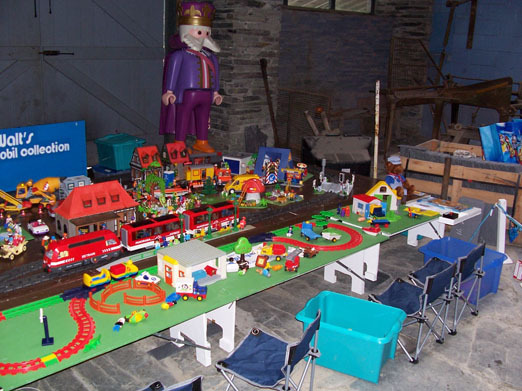 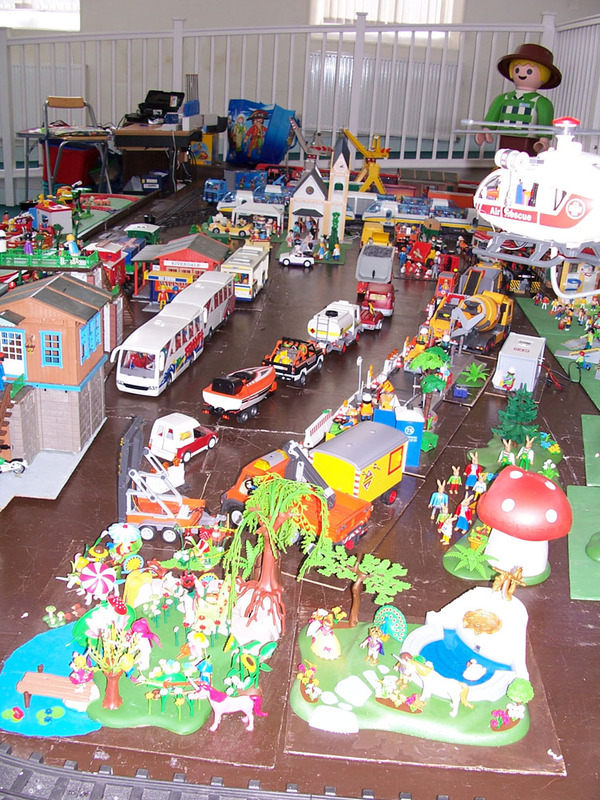 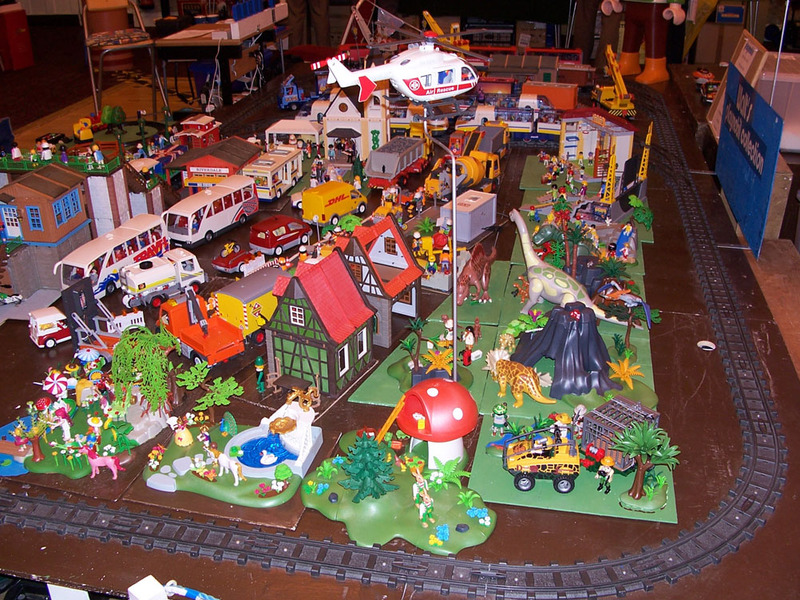 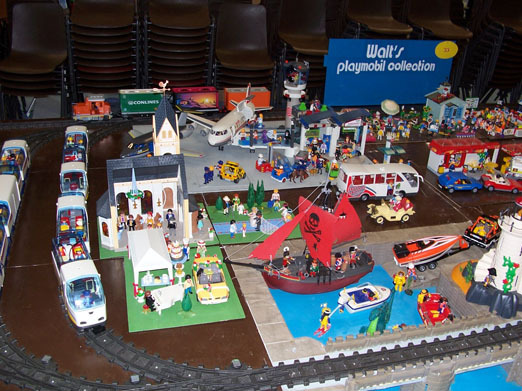 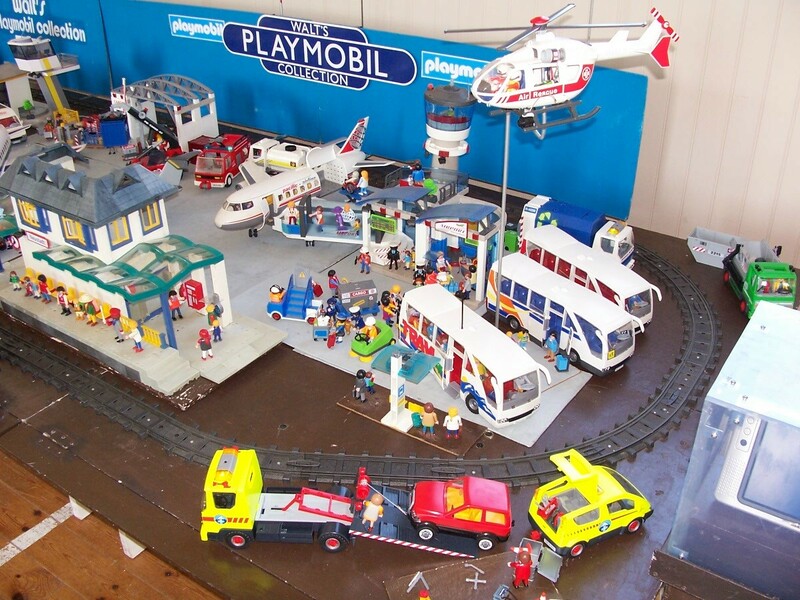 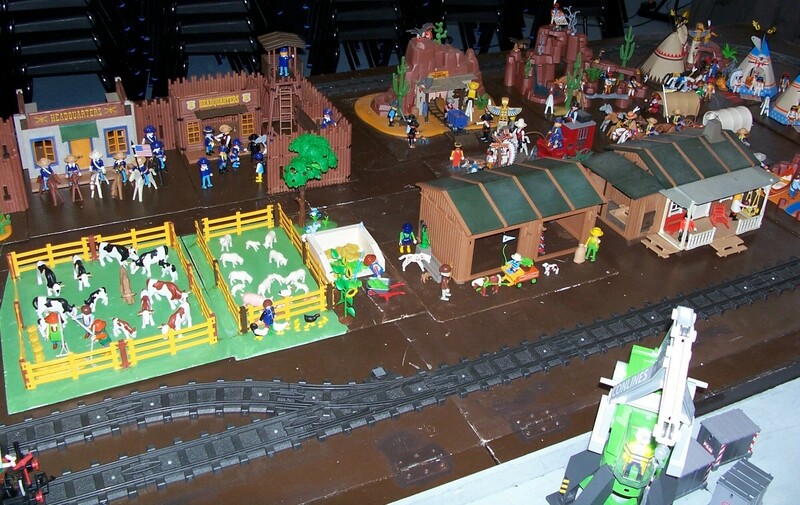 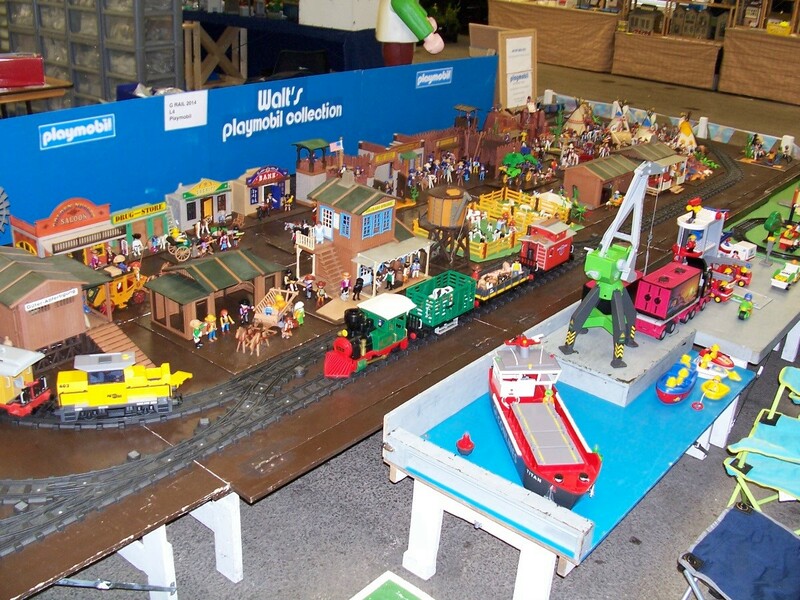 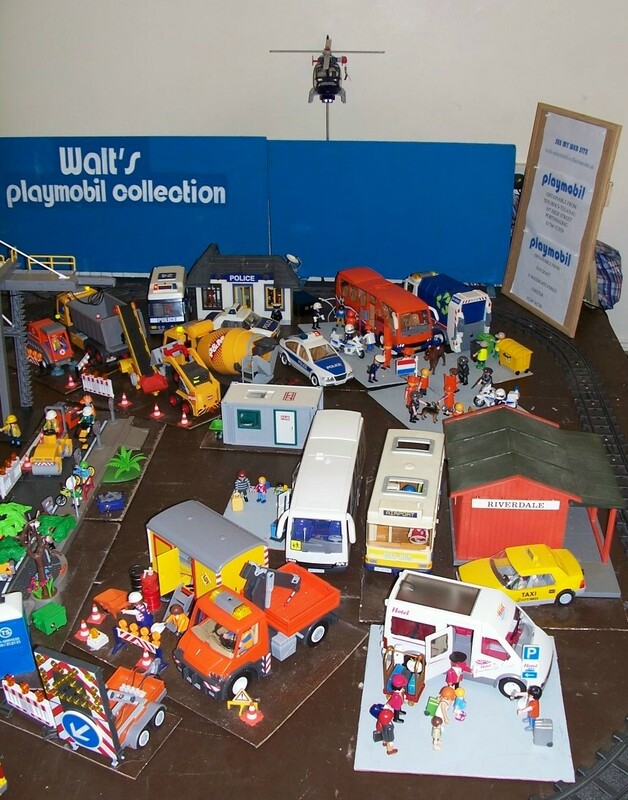 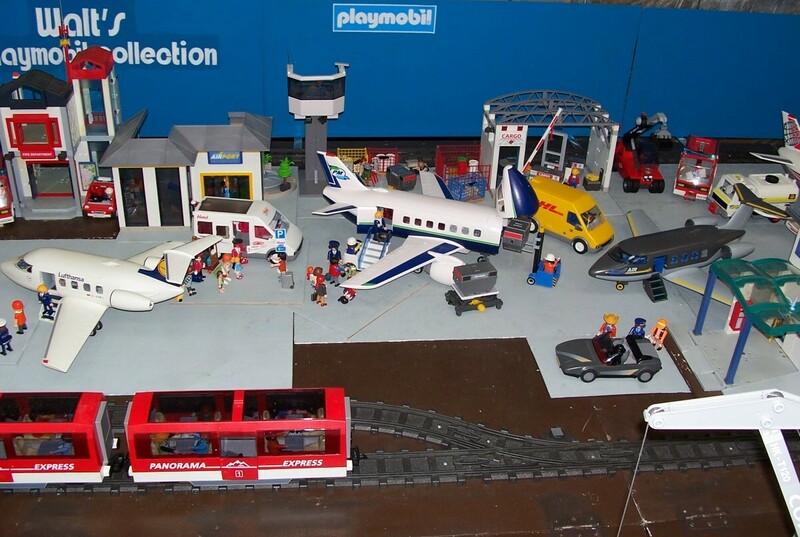 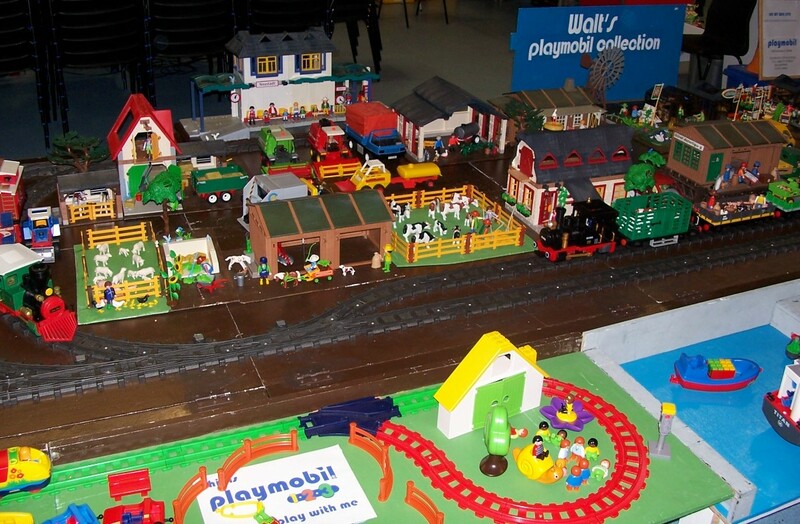 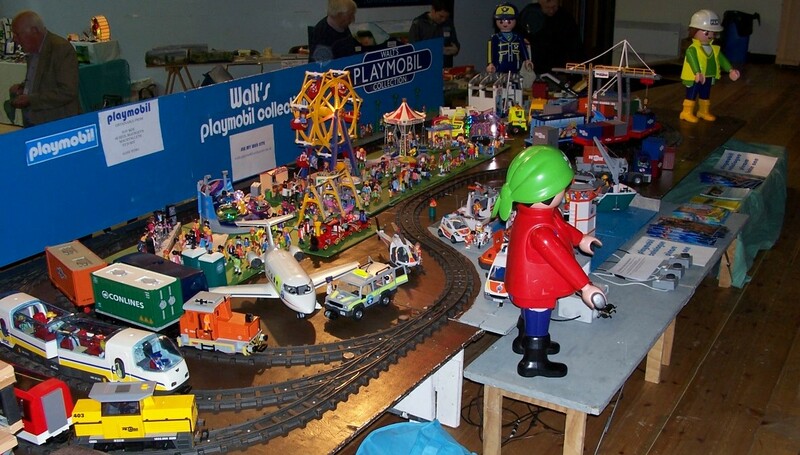 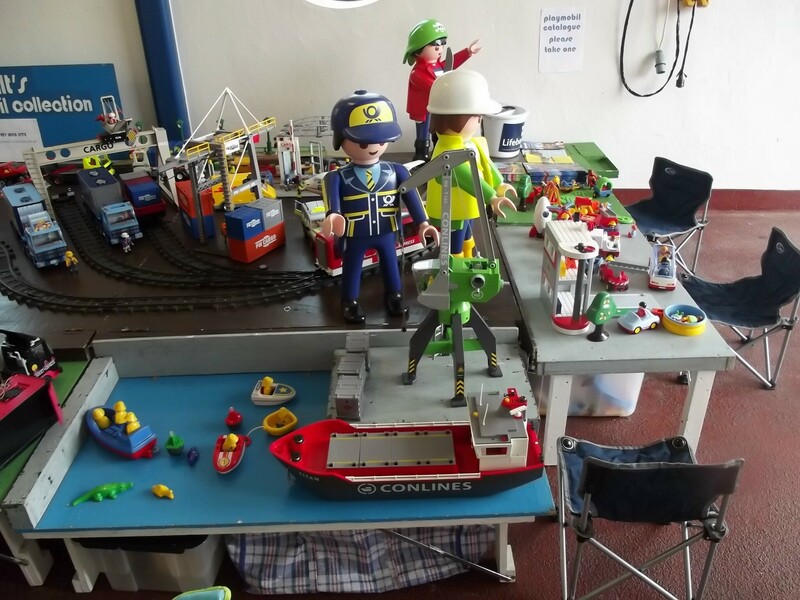 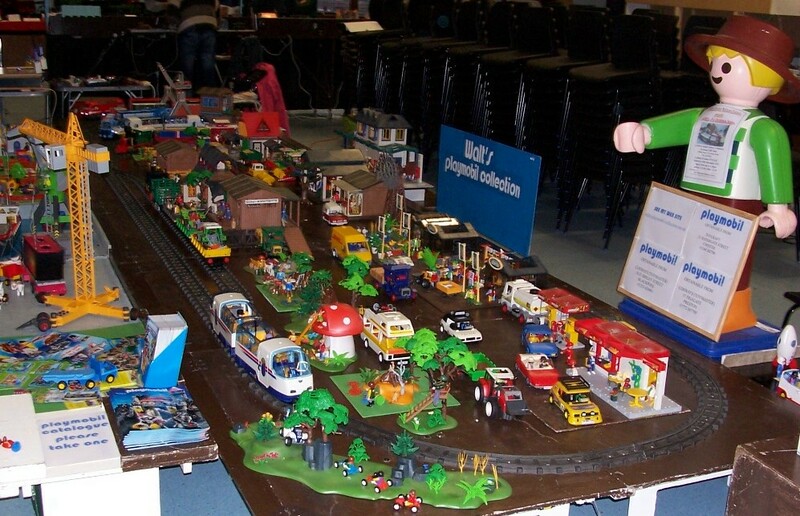 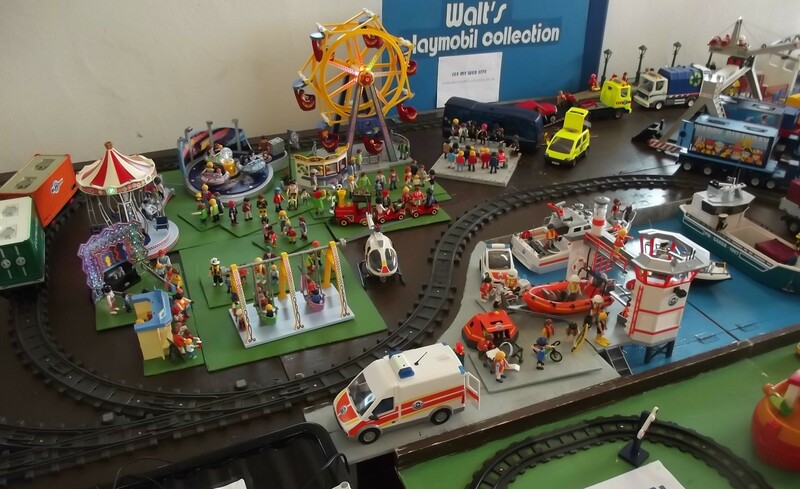 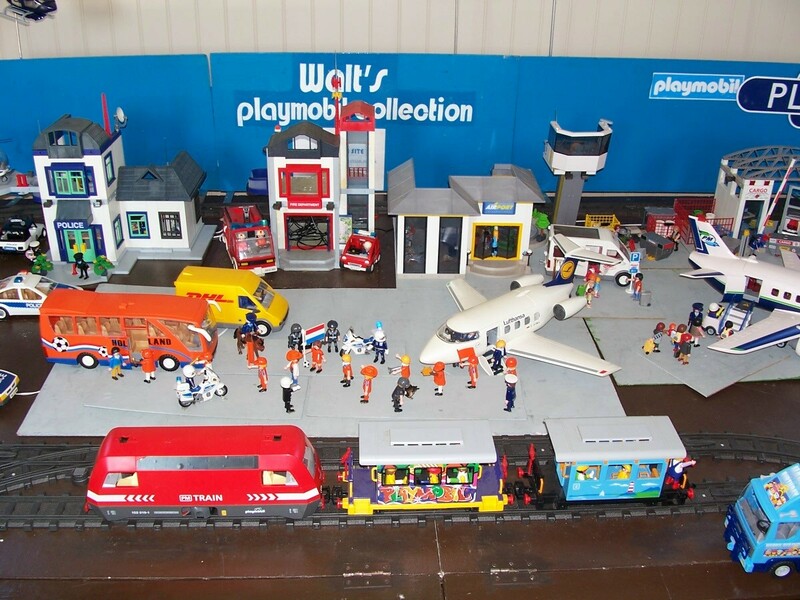 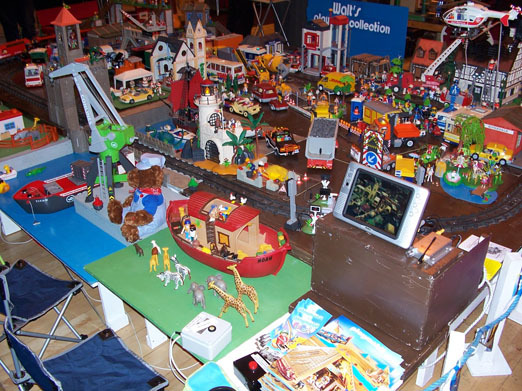 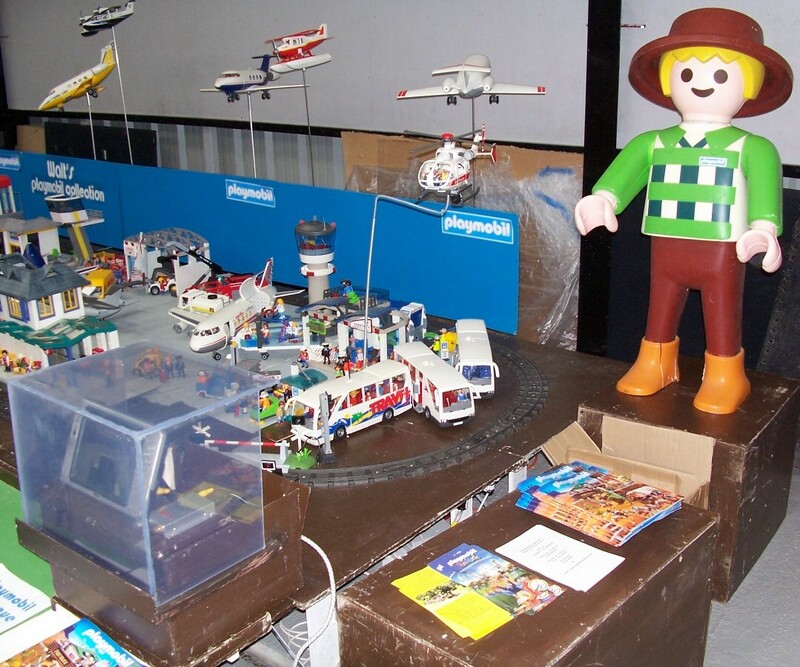 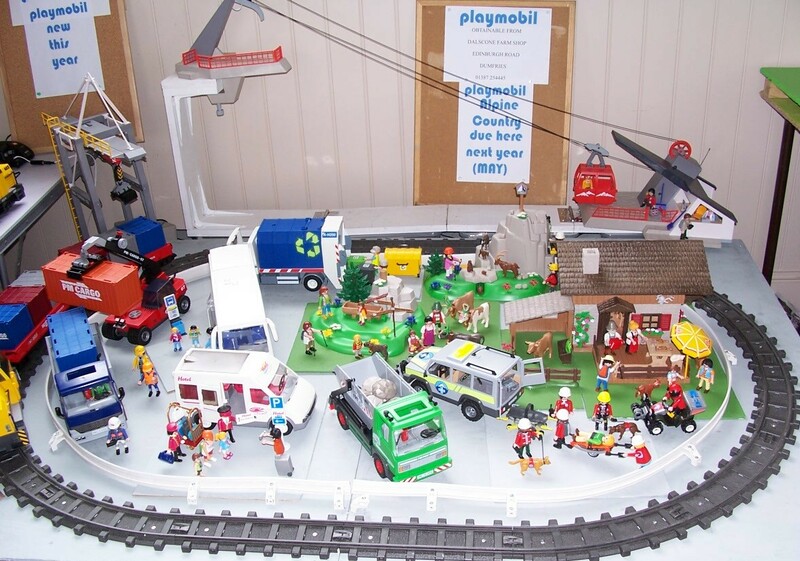 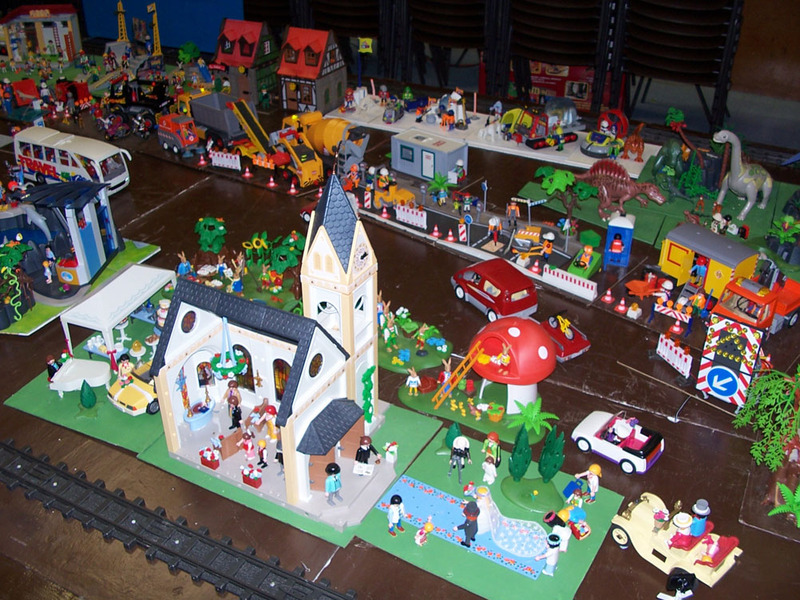 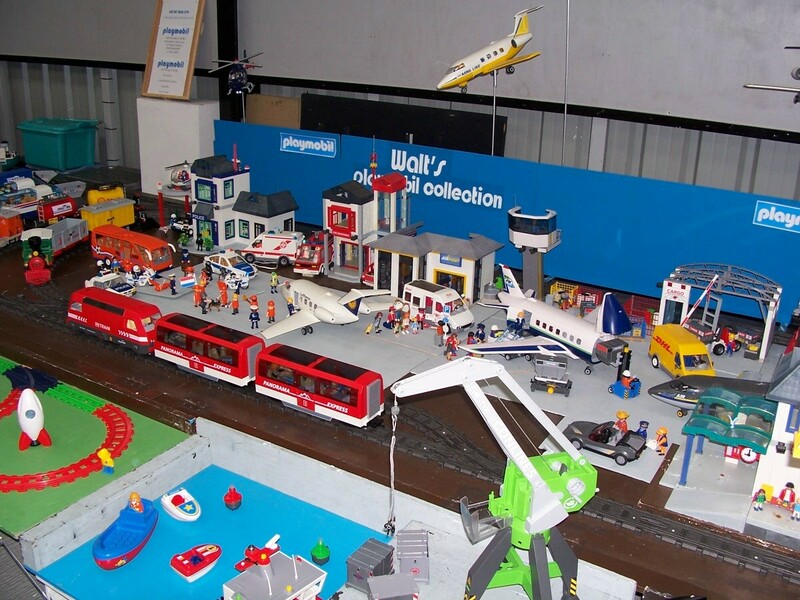 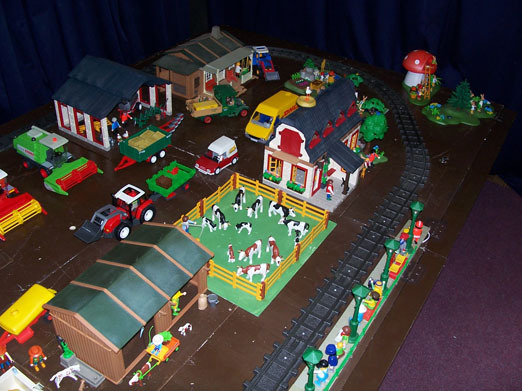 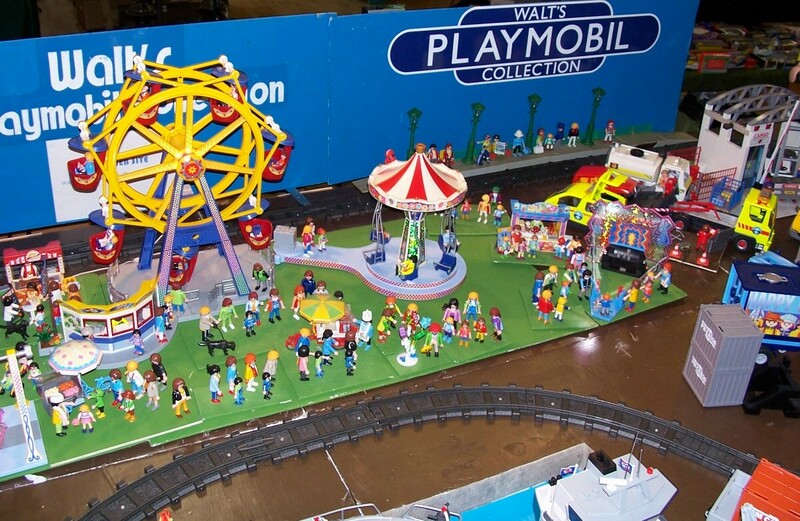 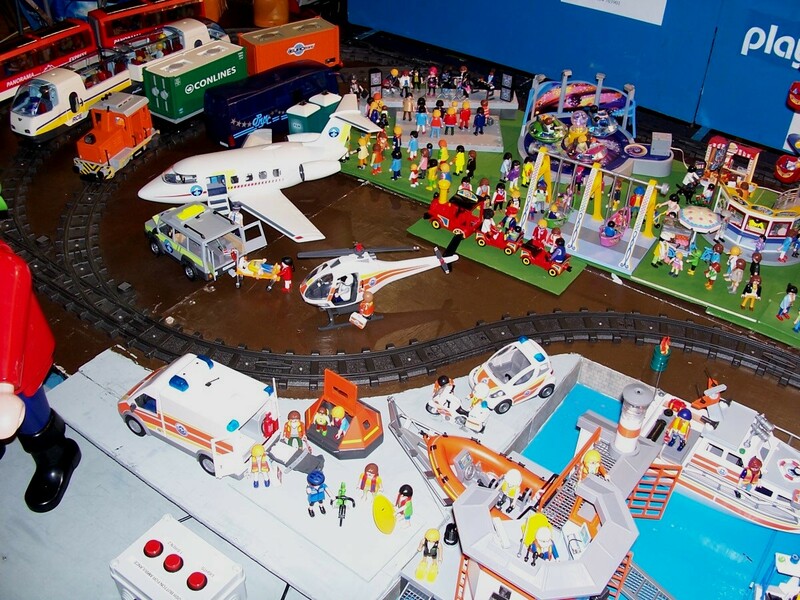 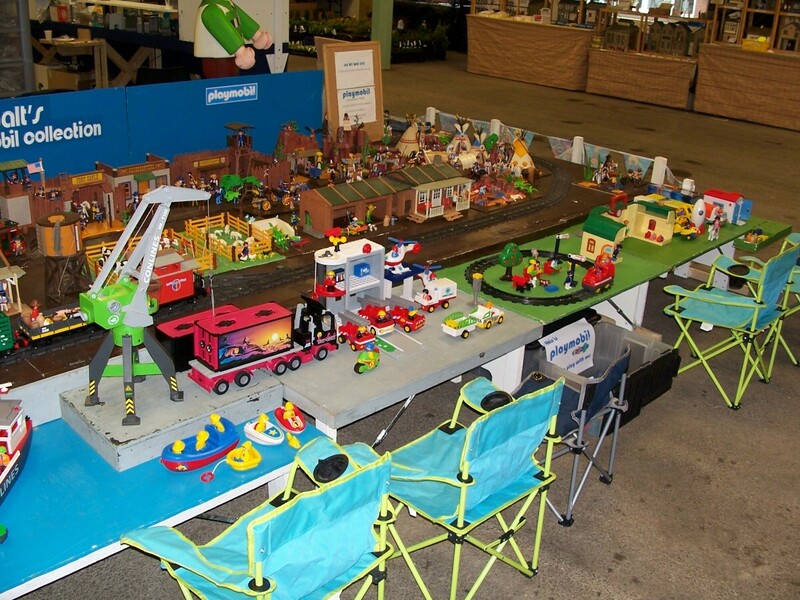 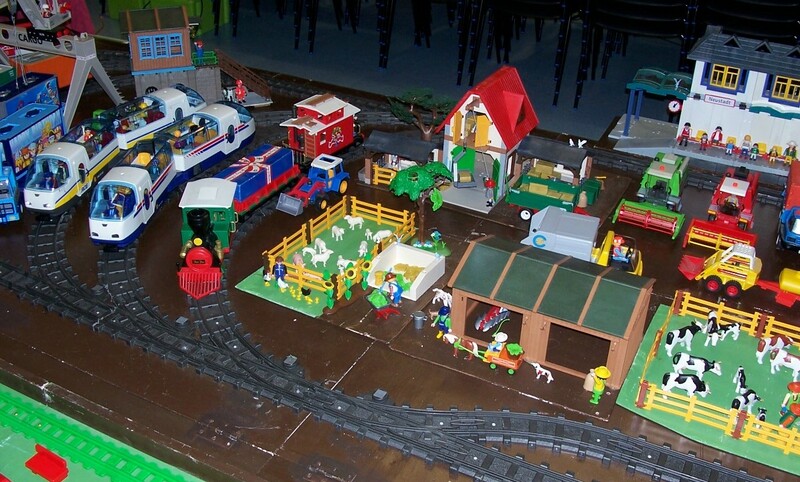 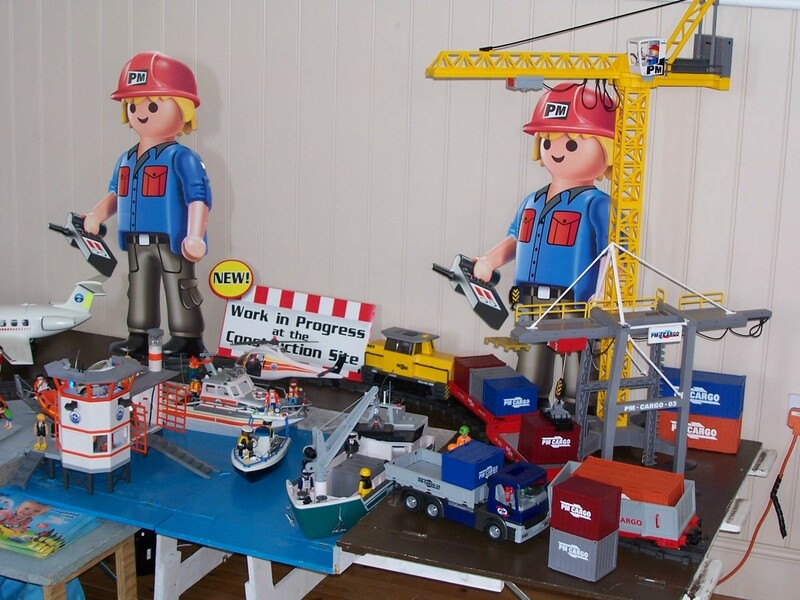 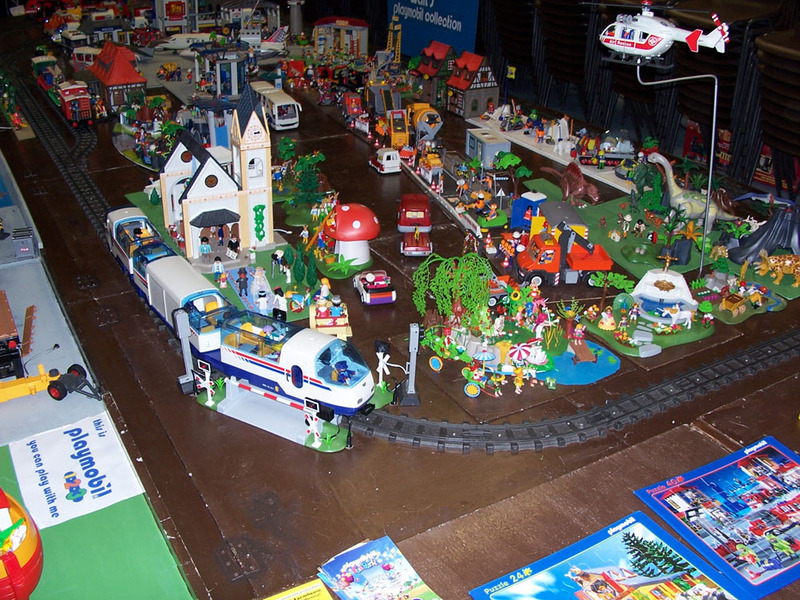 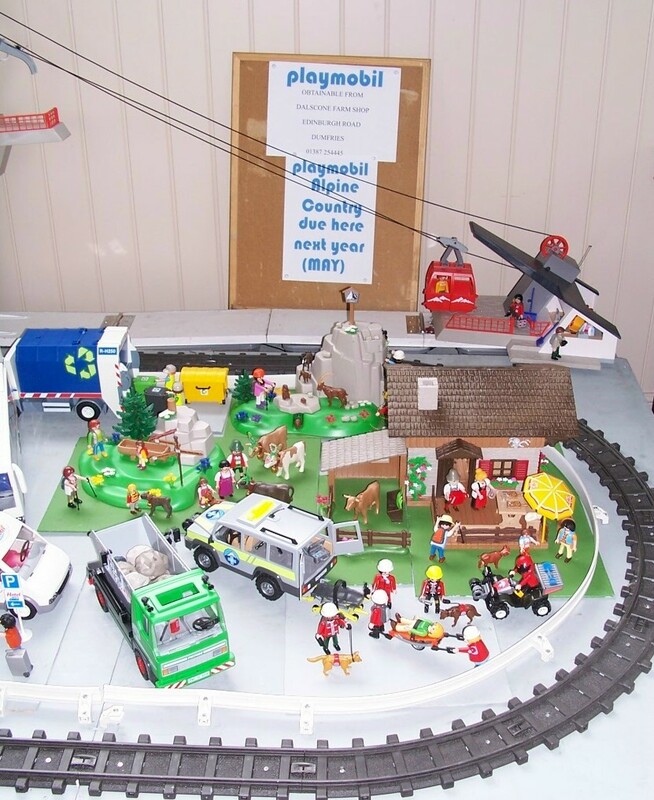 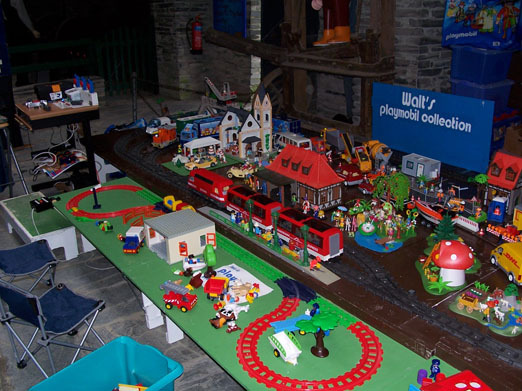 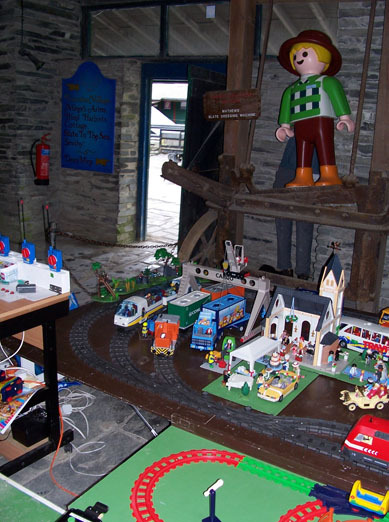 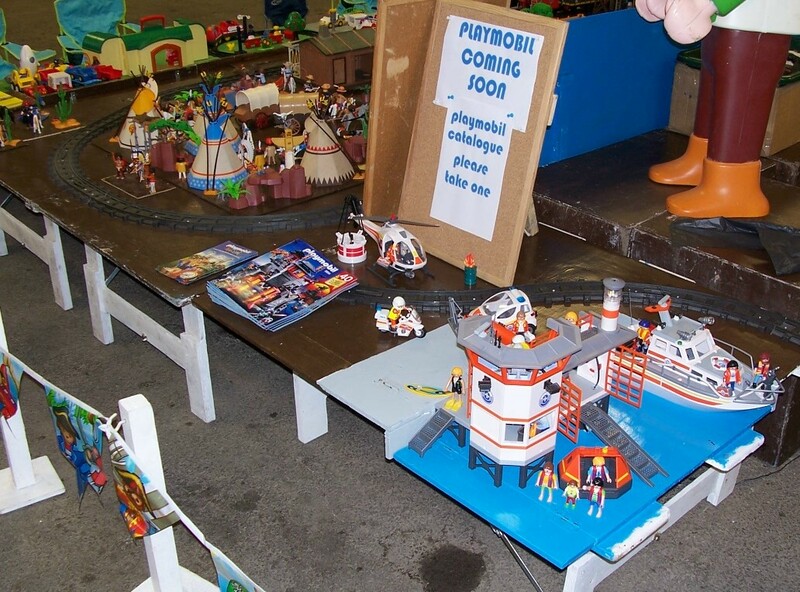 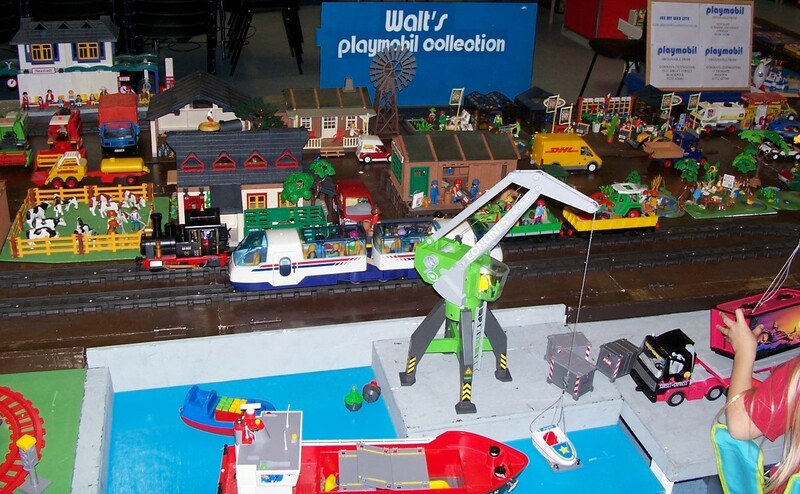 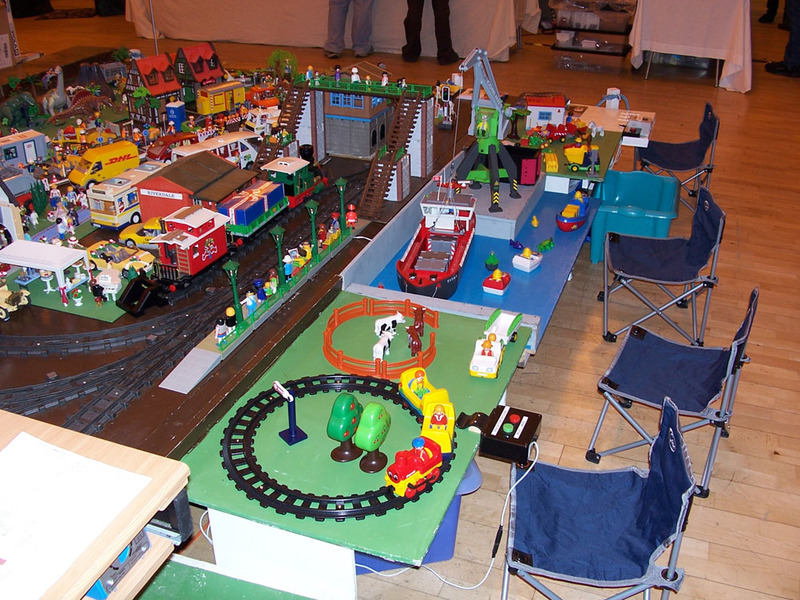 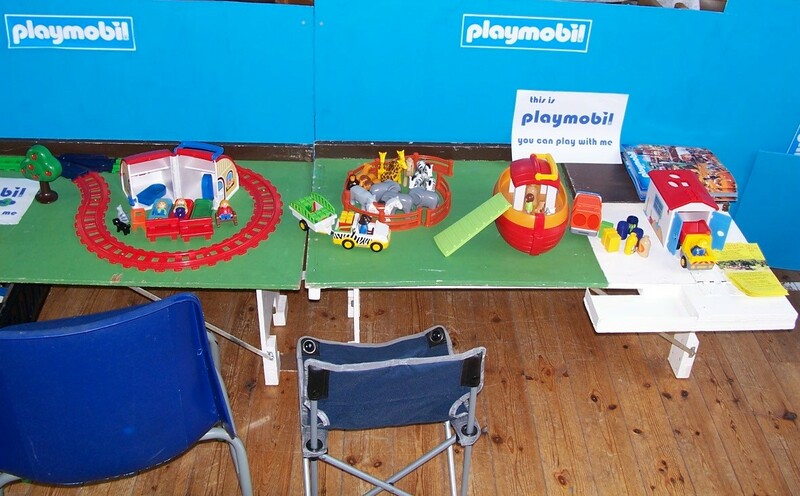 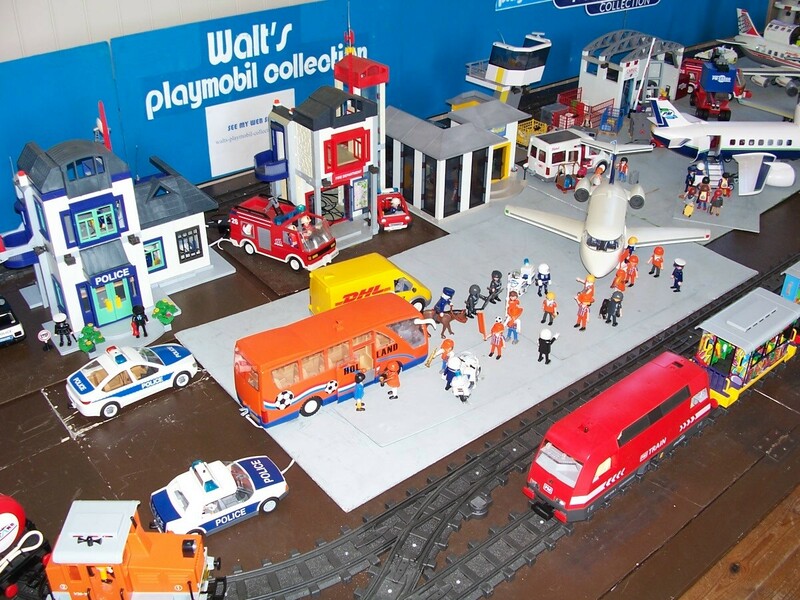 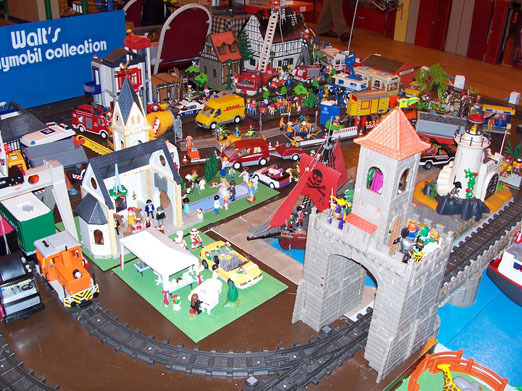 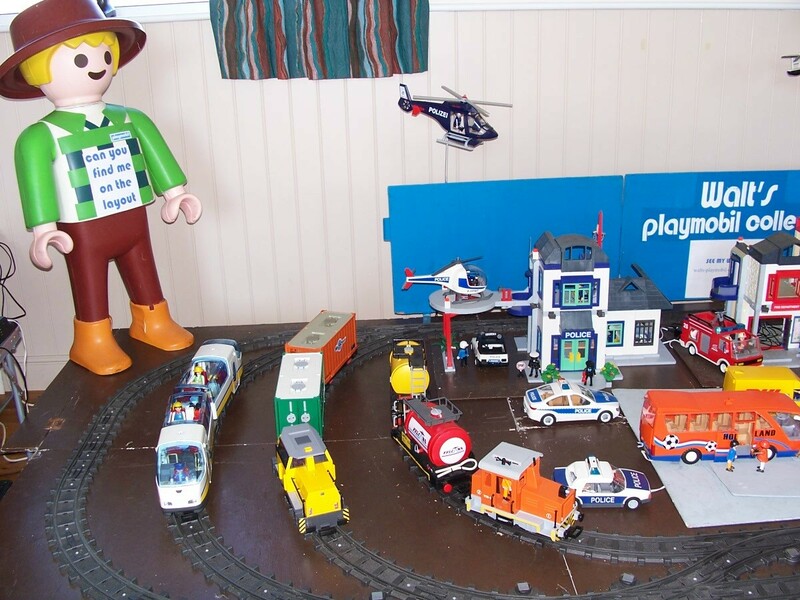 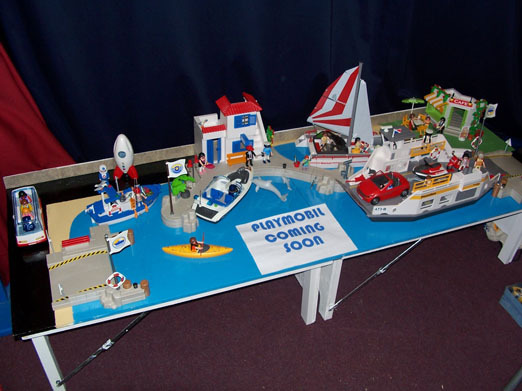 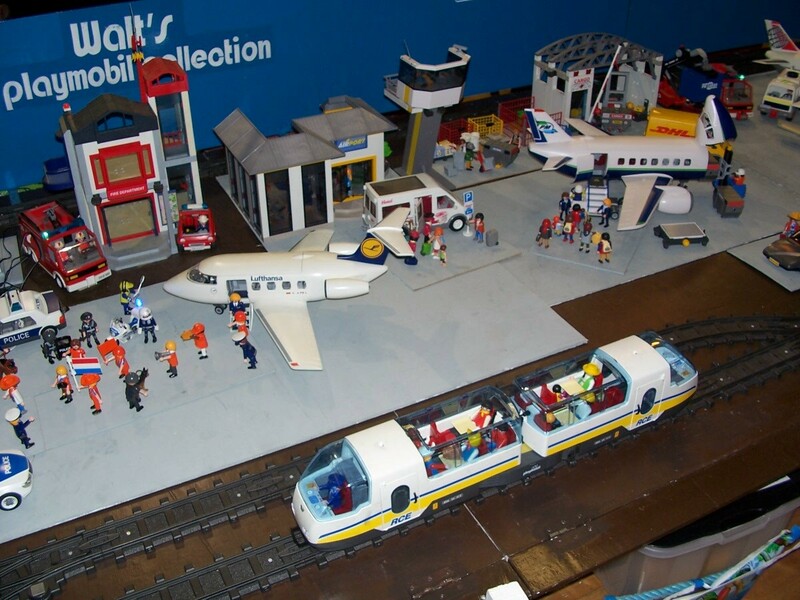 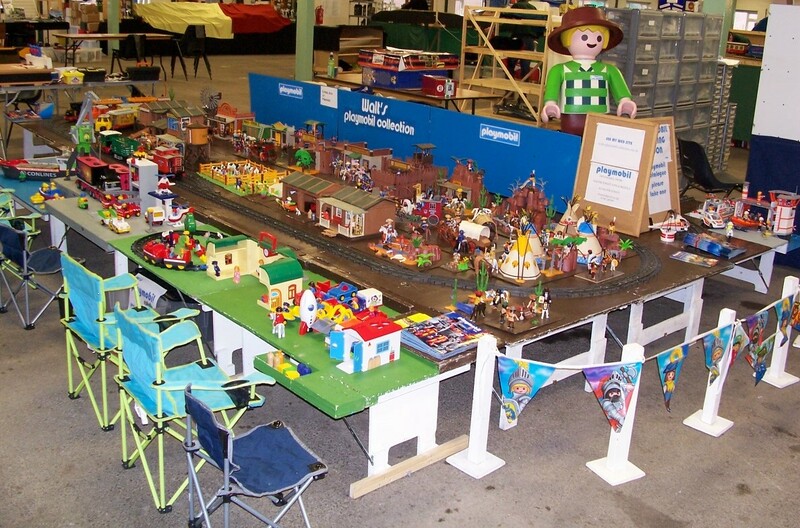 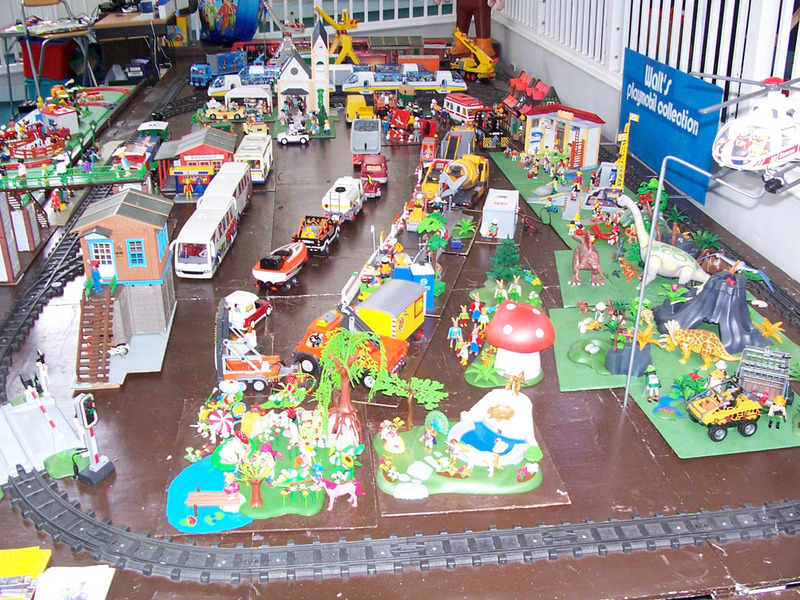 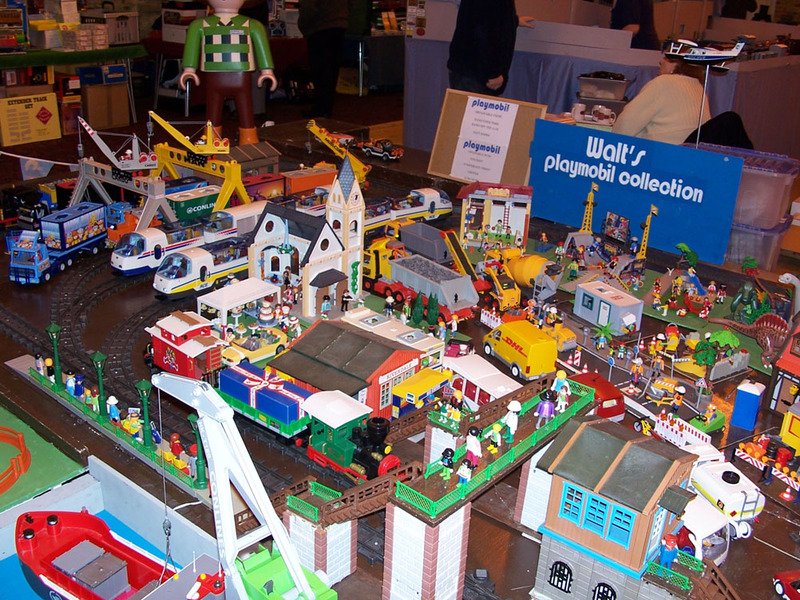 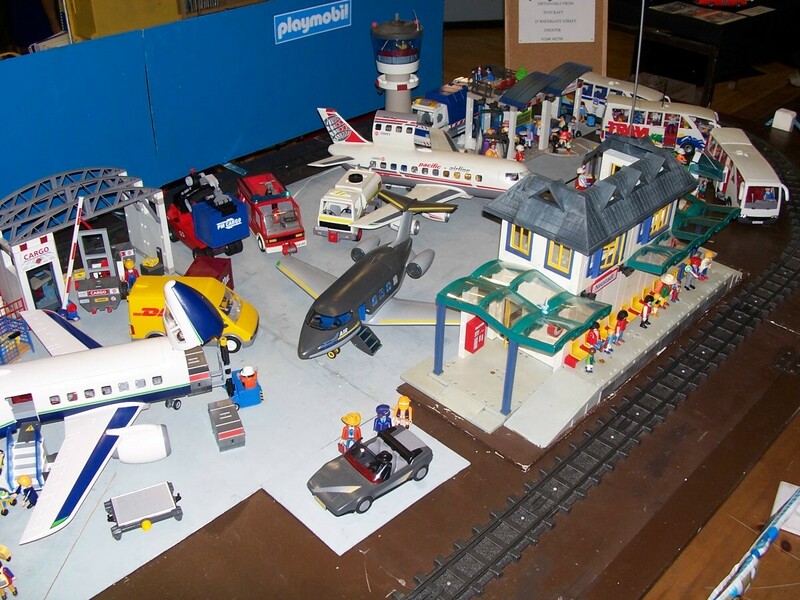 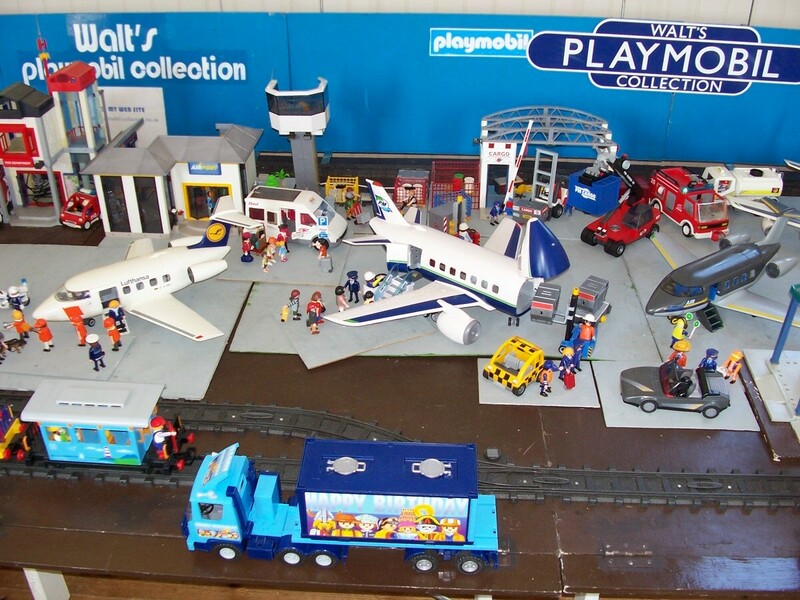 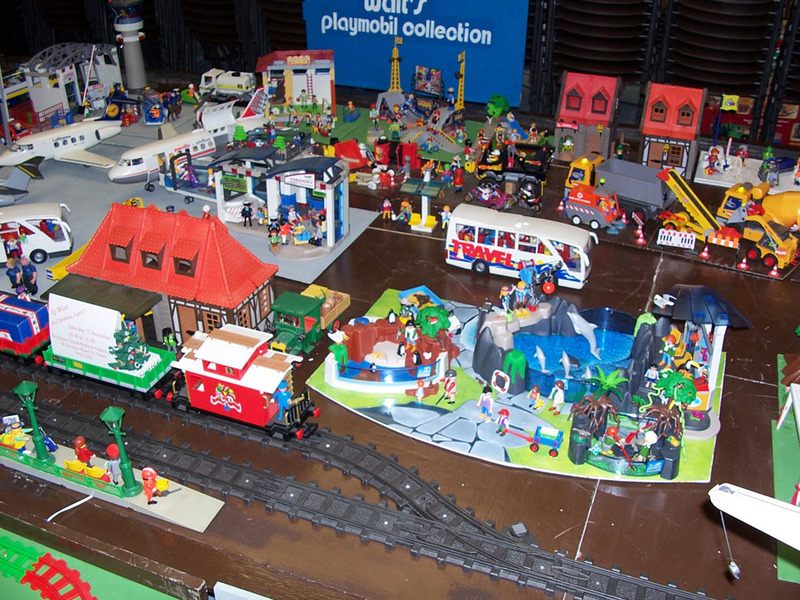 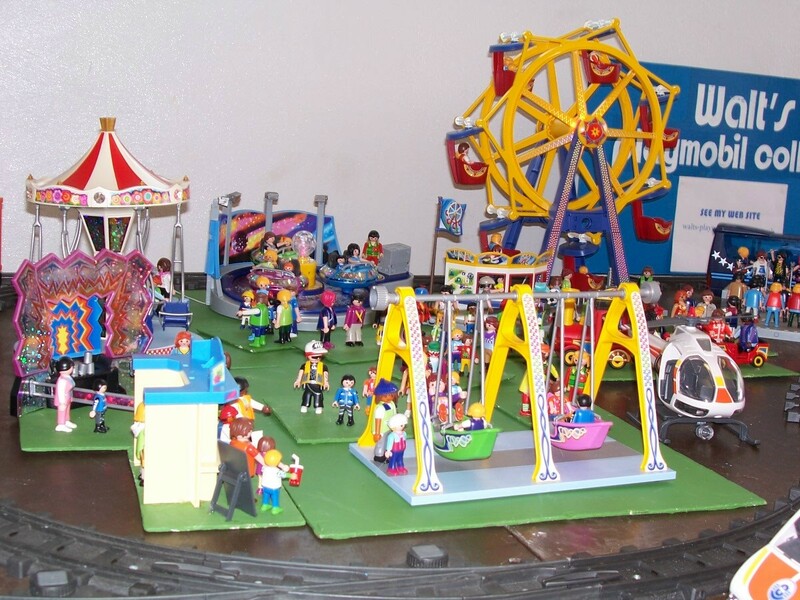 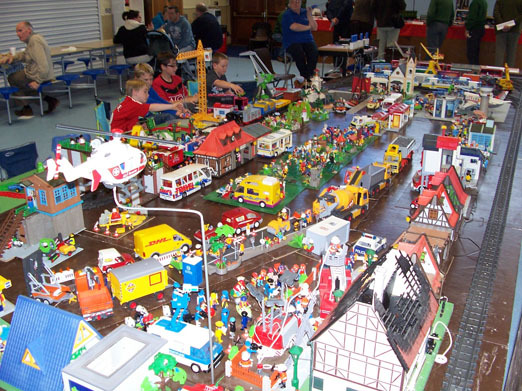 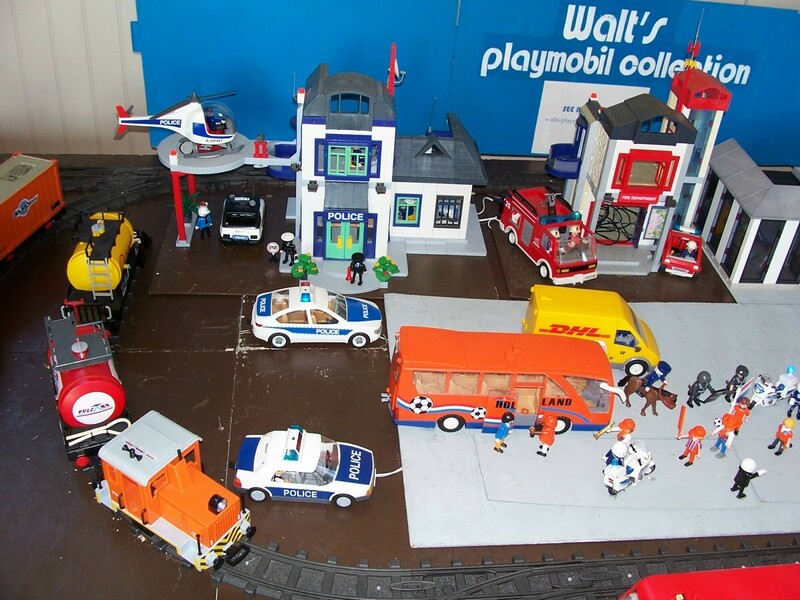 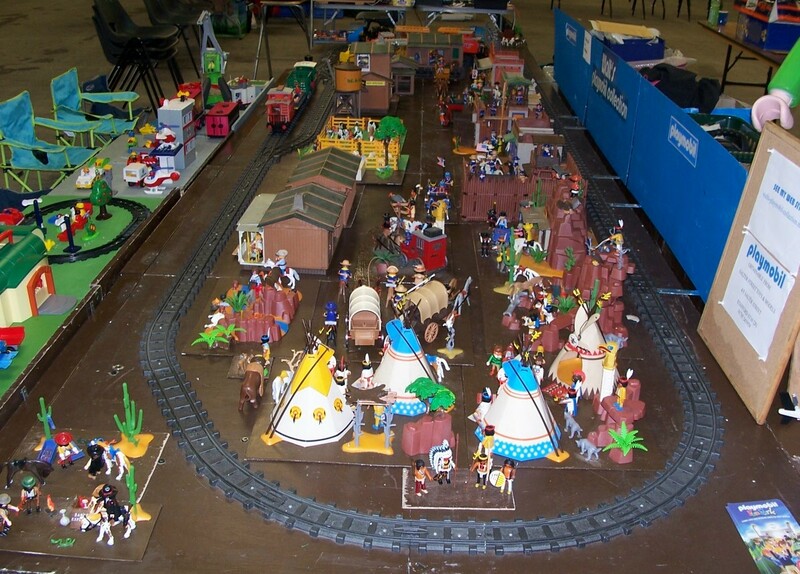 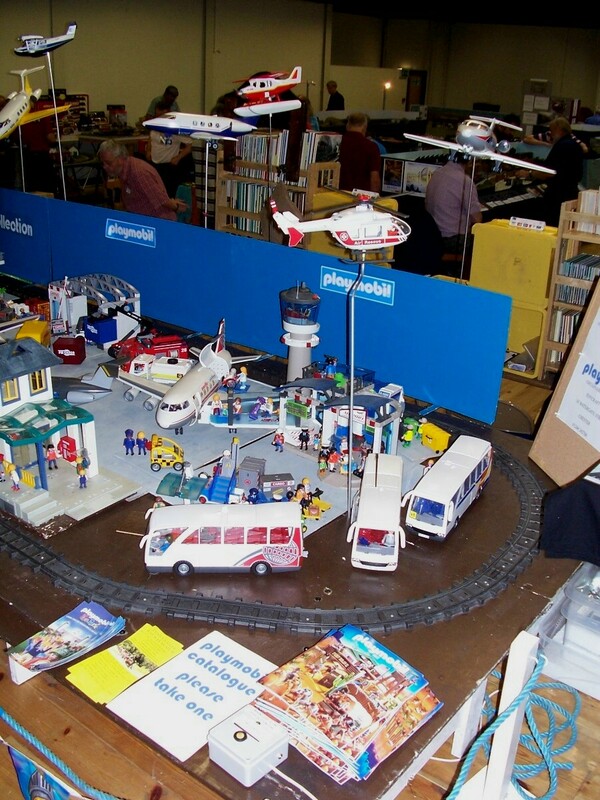 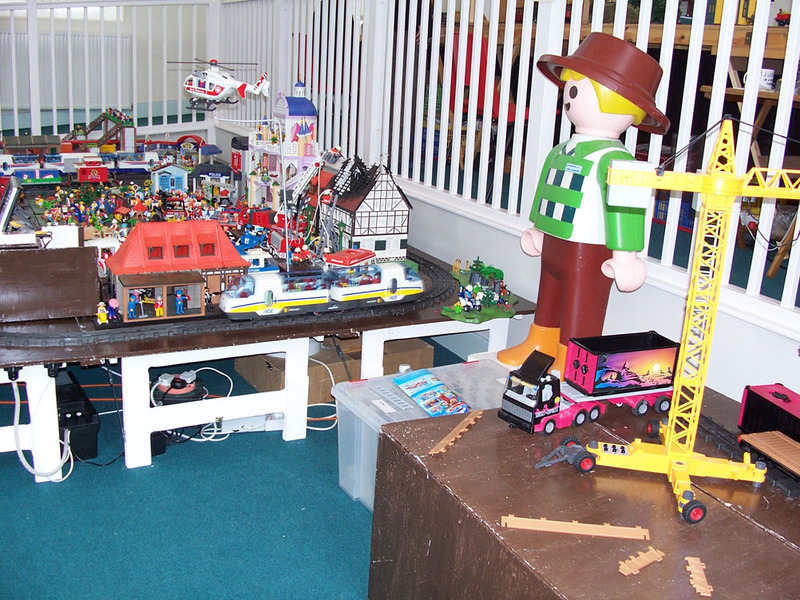 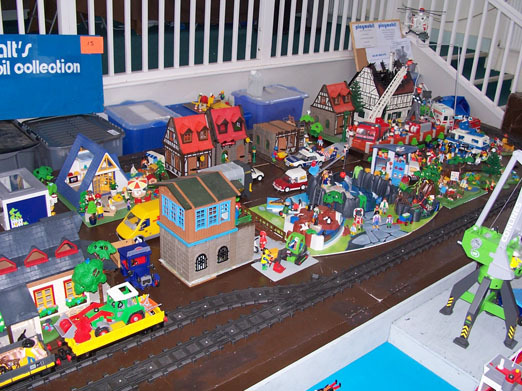 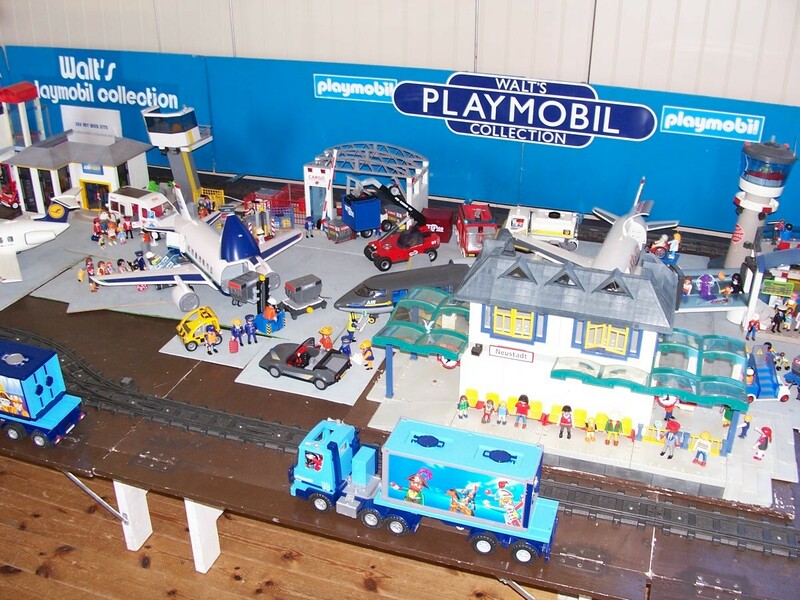 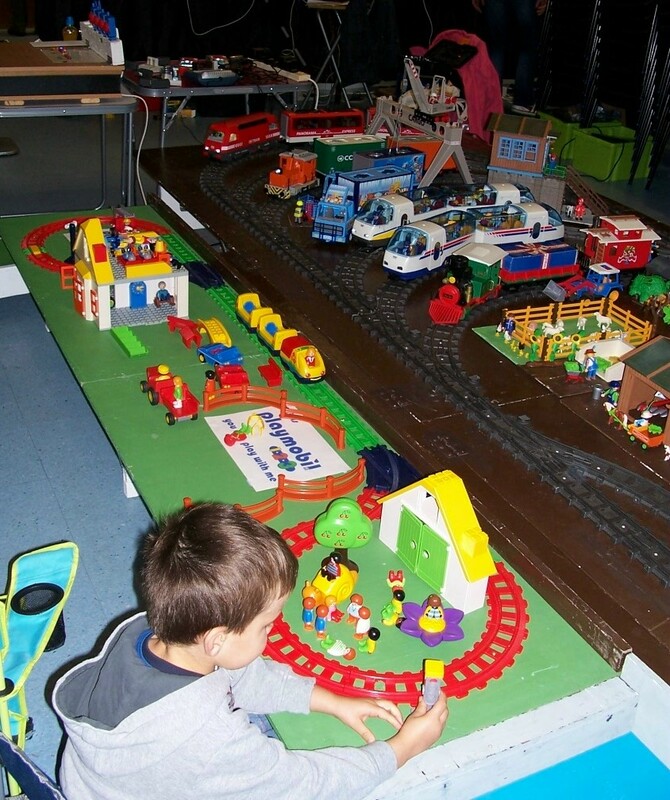 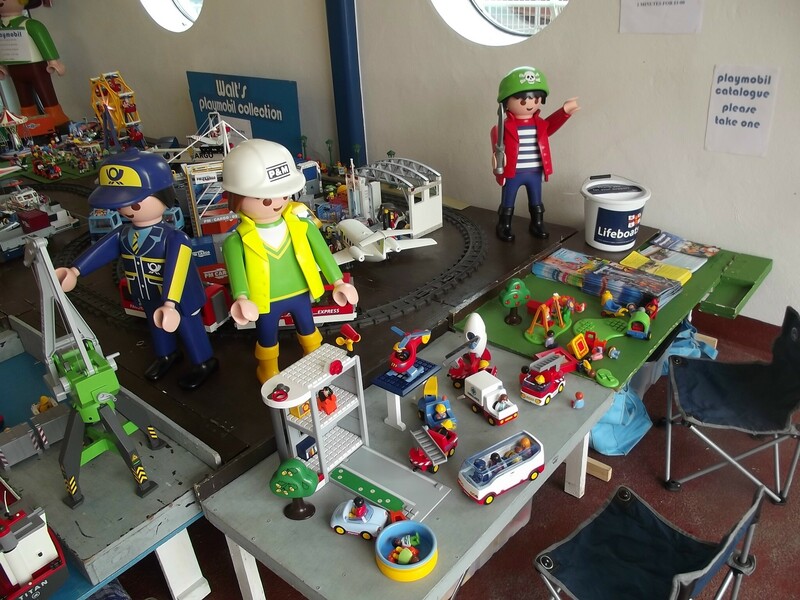 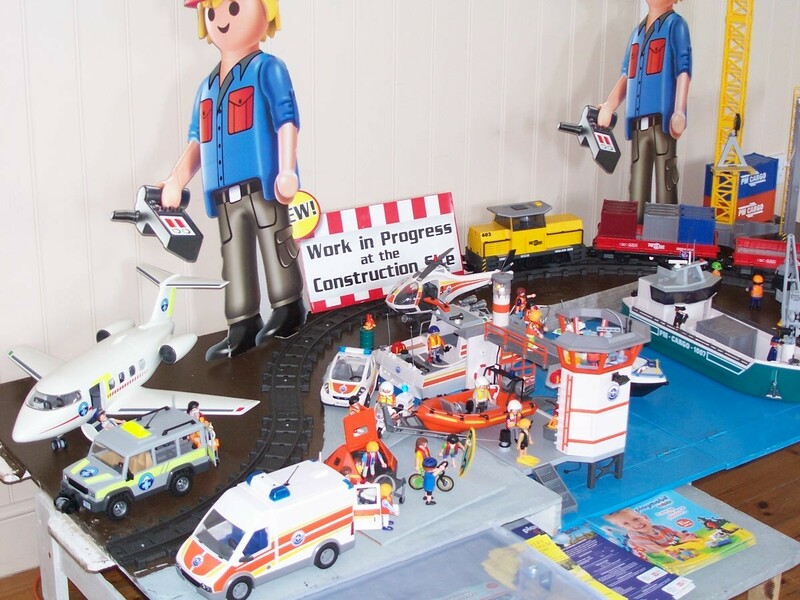 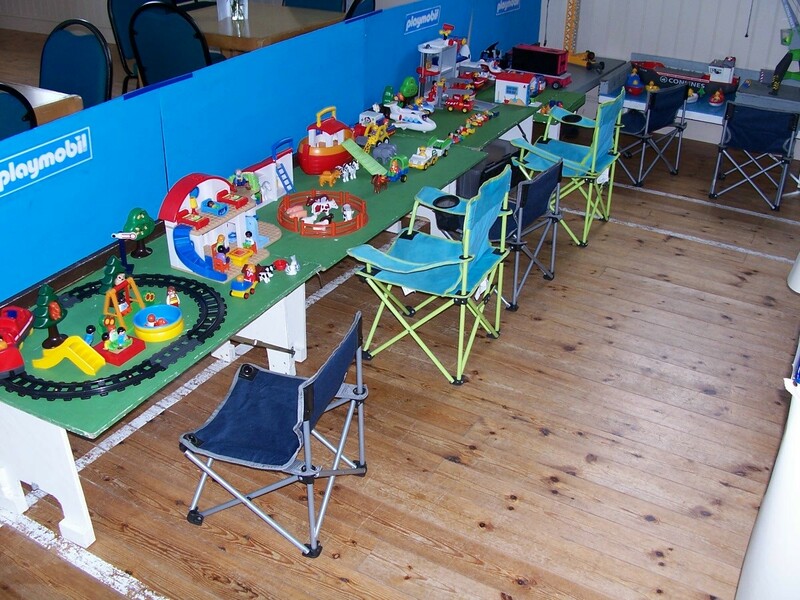 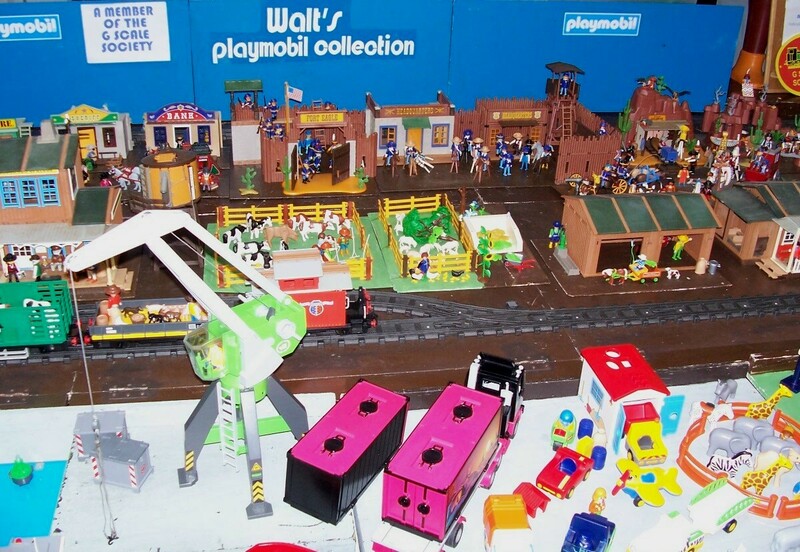 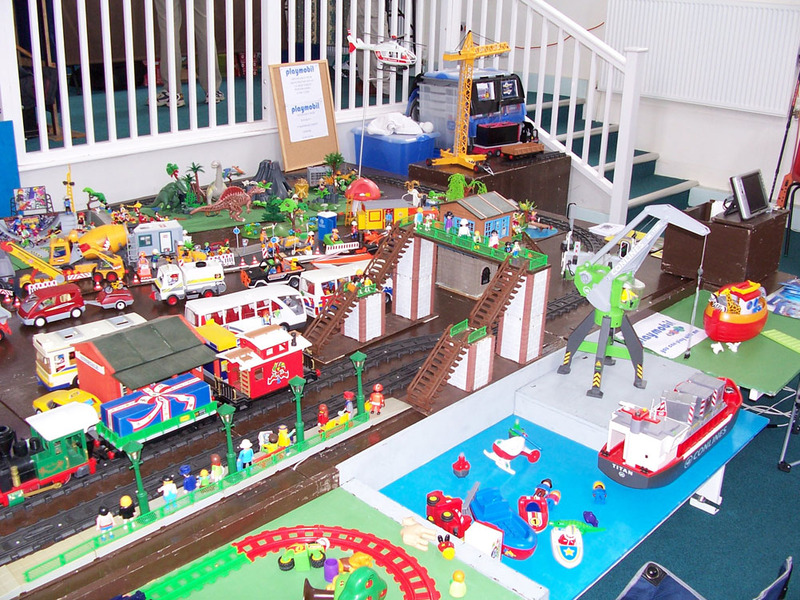 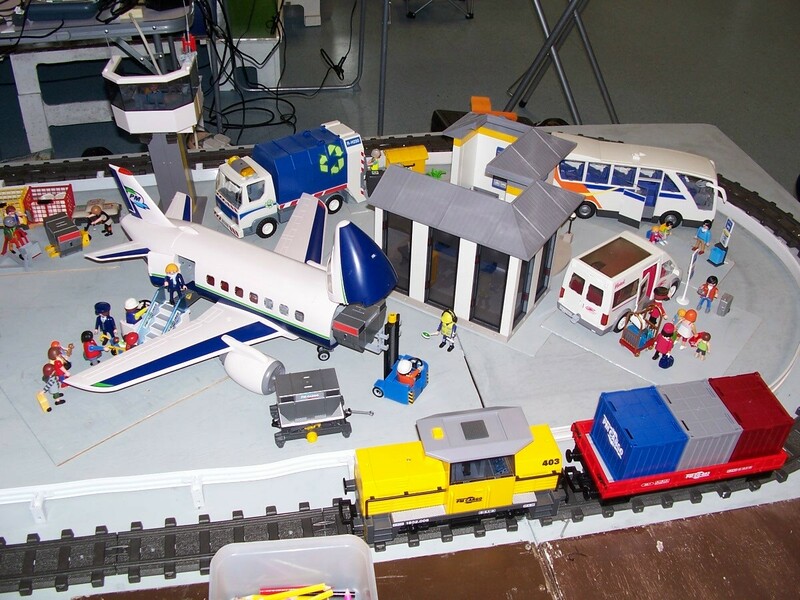 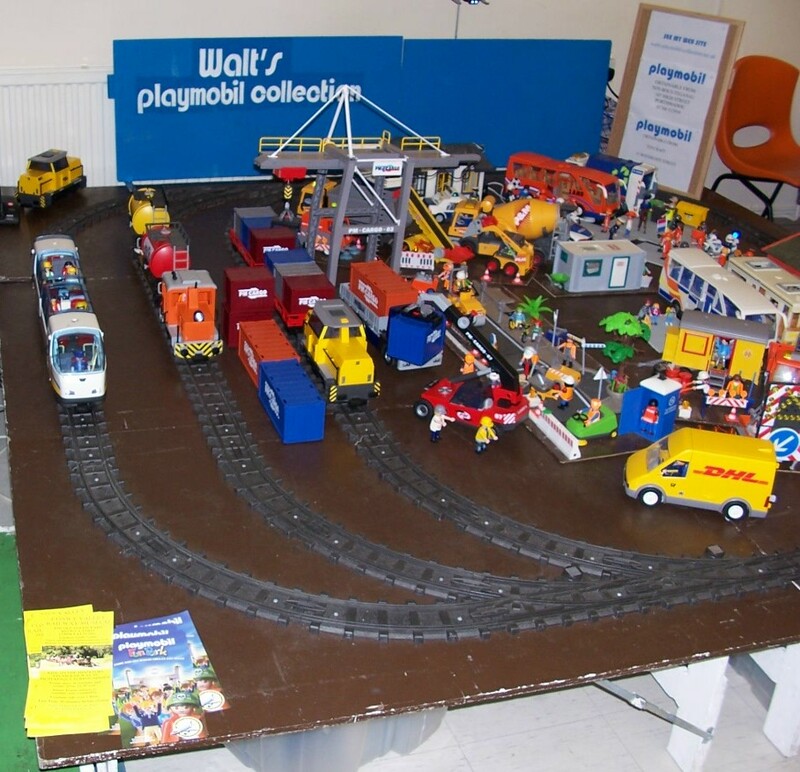 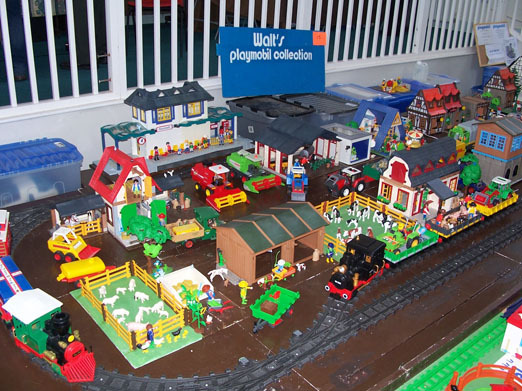 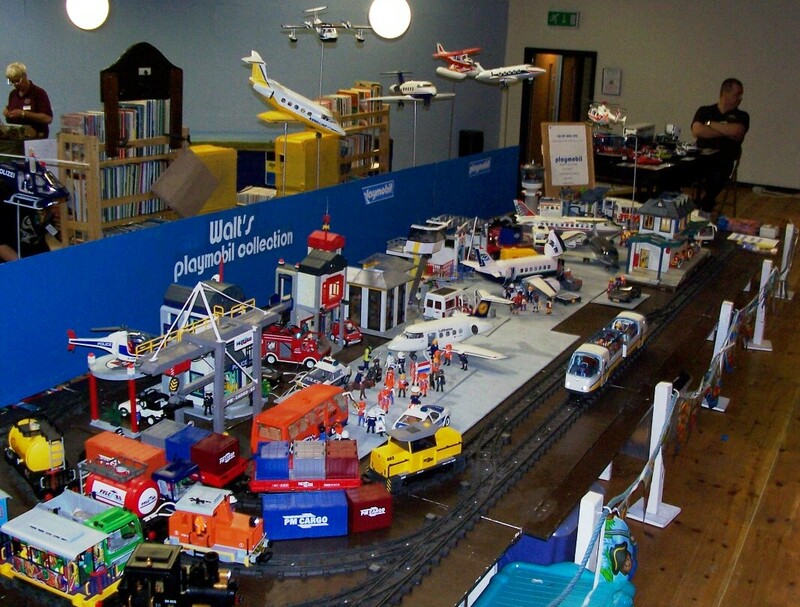 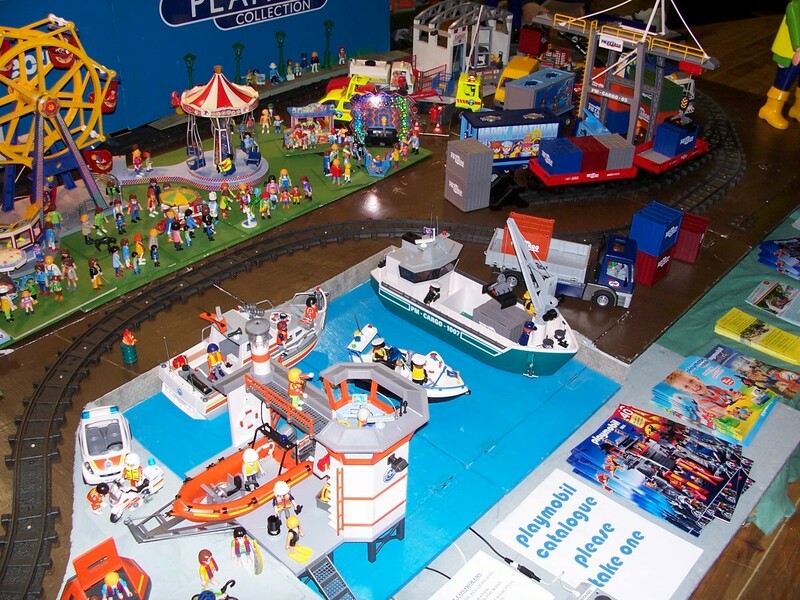 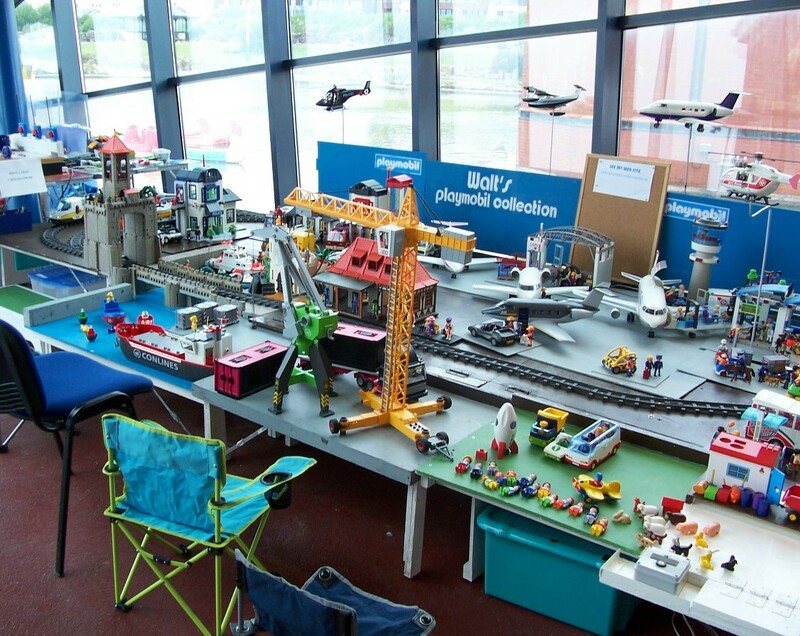 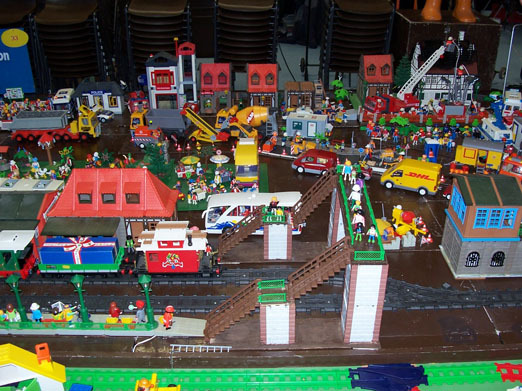 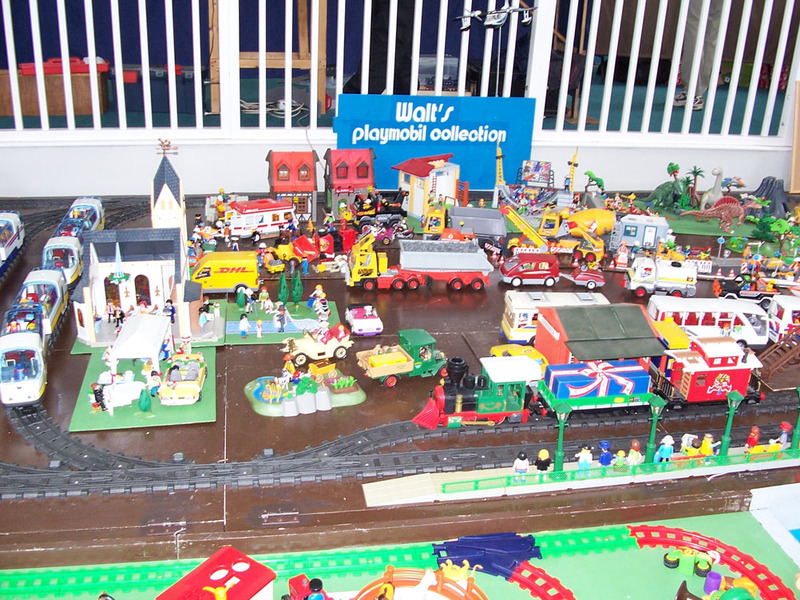 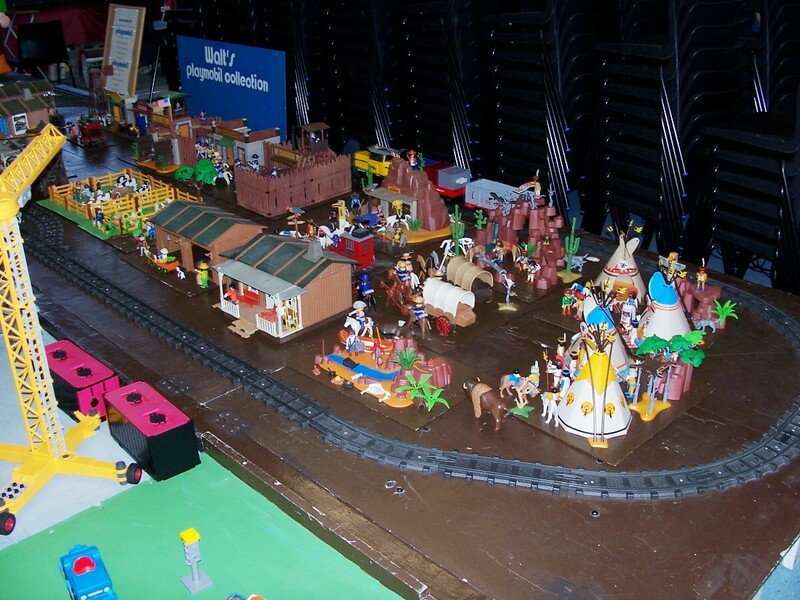 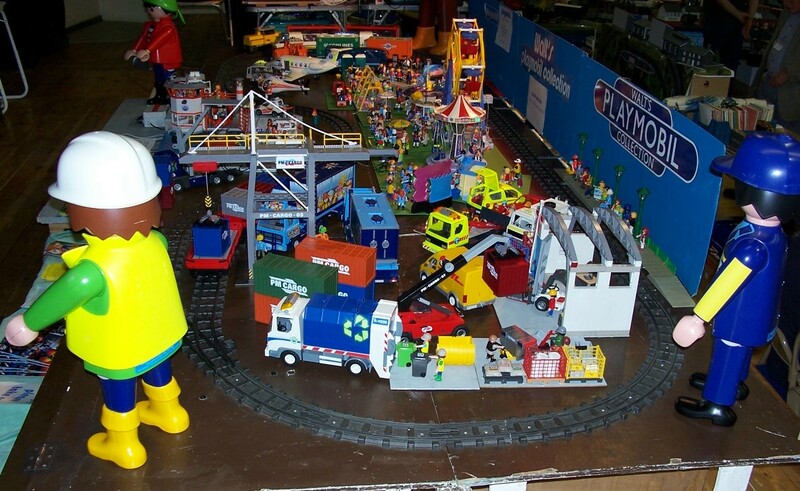 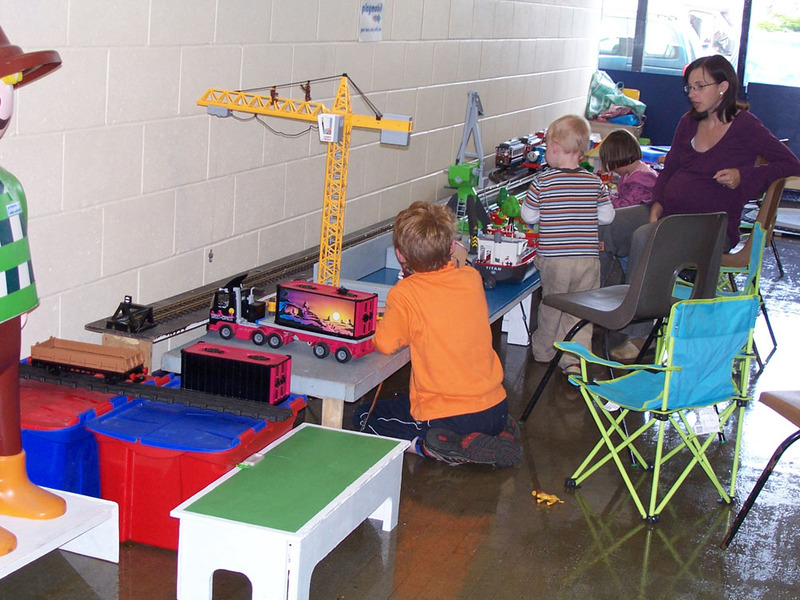 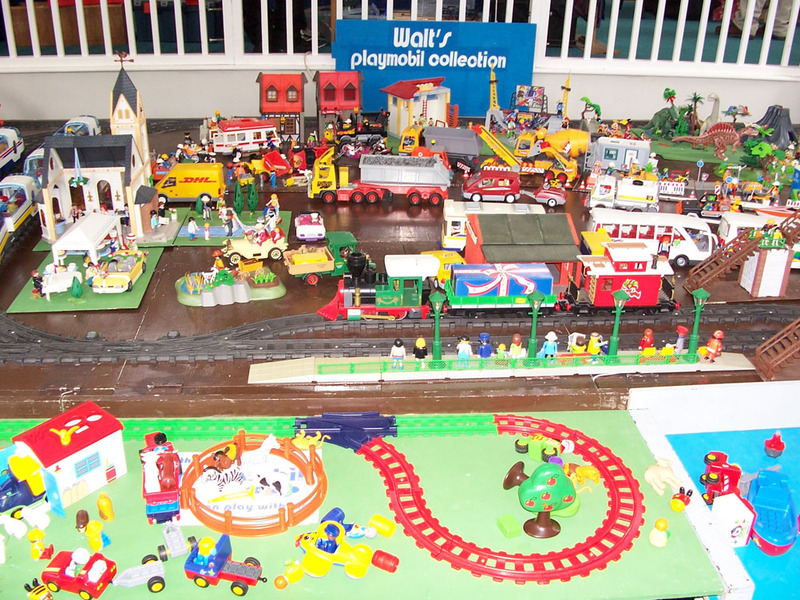 On the old layout I had a section placed on boxes for the children to play with various items of Playmobil. 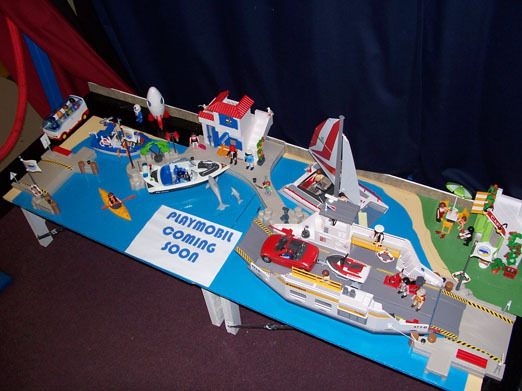 This has now had its own legs fitted so that they can be put on the remainder of the front. 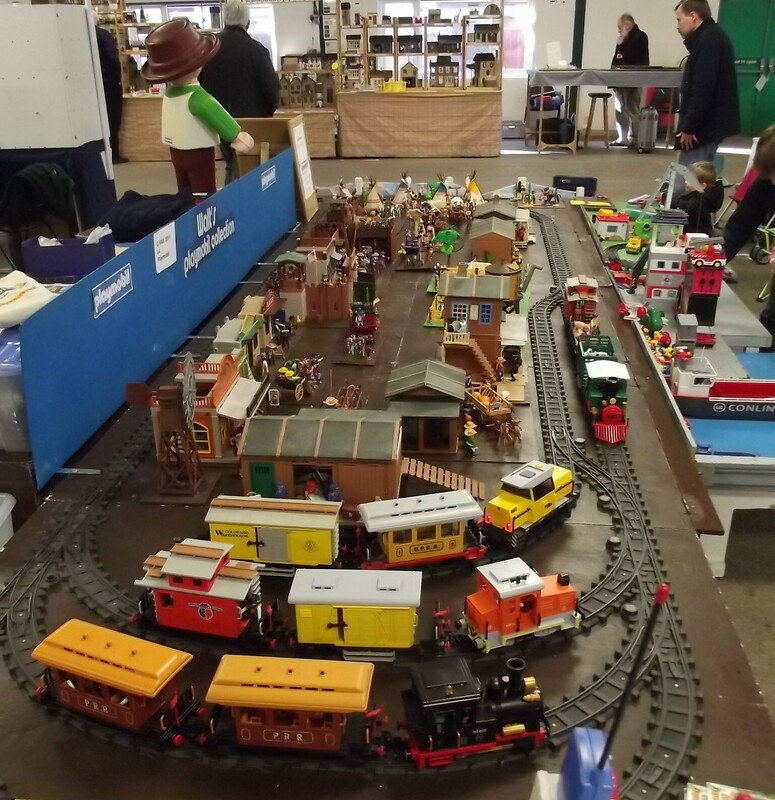 These sections can be adjusted to fit across the length of the layout. 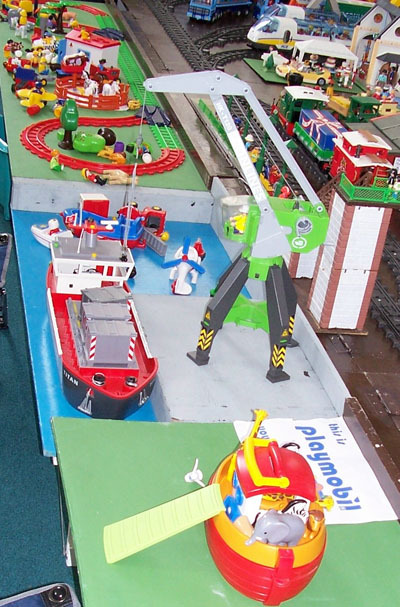 Section X shown in blue on the plan is the crossover section 4feet 6½inches (142cm) can only be used when the layout is the full death. 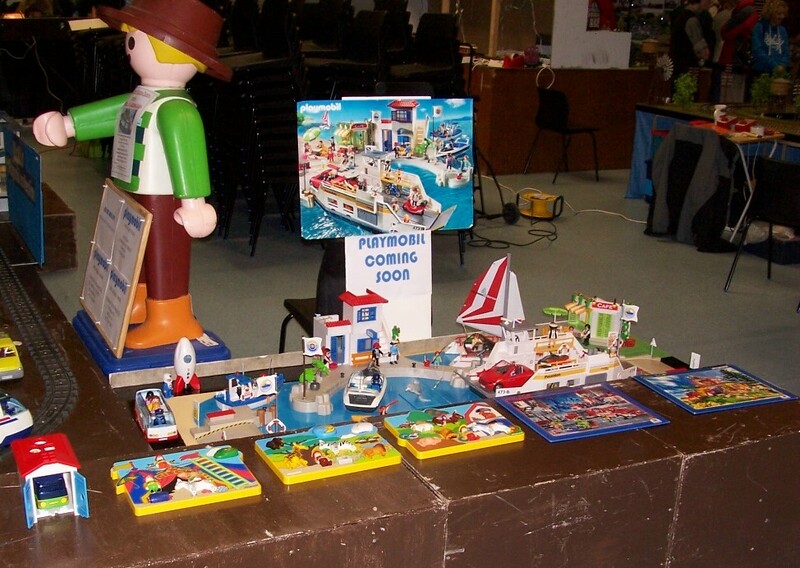 Board F3 is the harbour and apart from the four corner boards most of the other boards can be used in any combination. 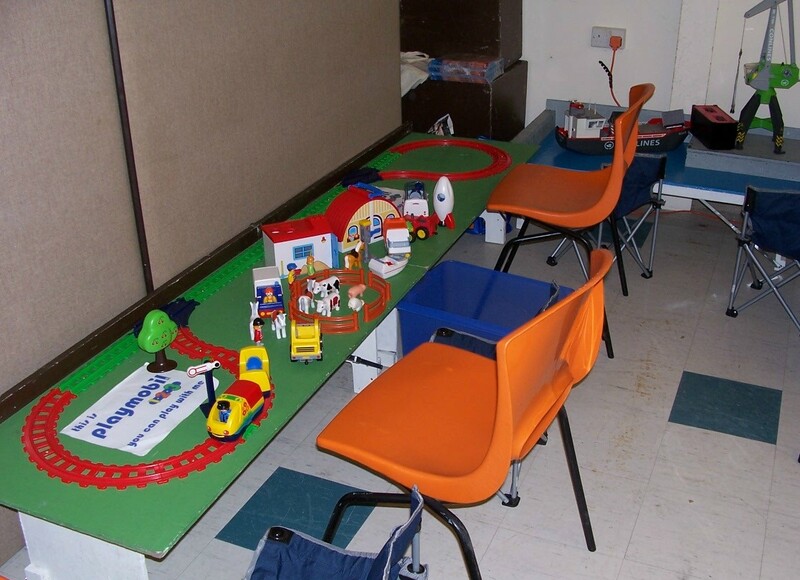 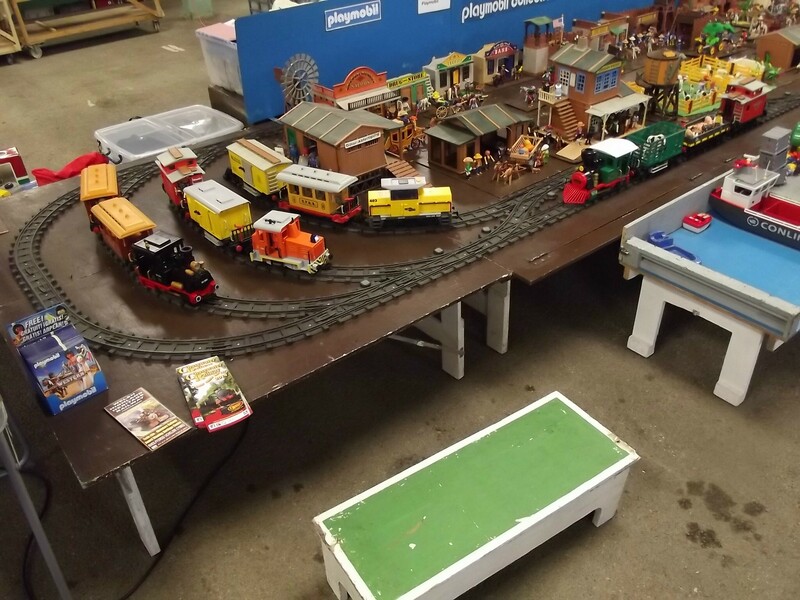 Due to sometimes the layout is used with the back to a wall the boards are made from 12mm plywood so that it can be walked on should a train come off the track at the back. 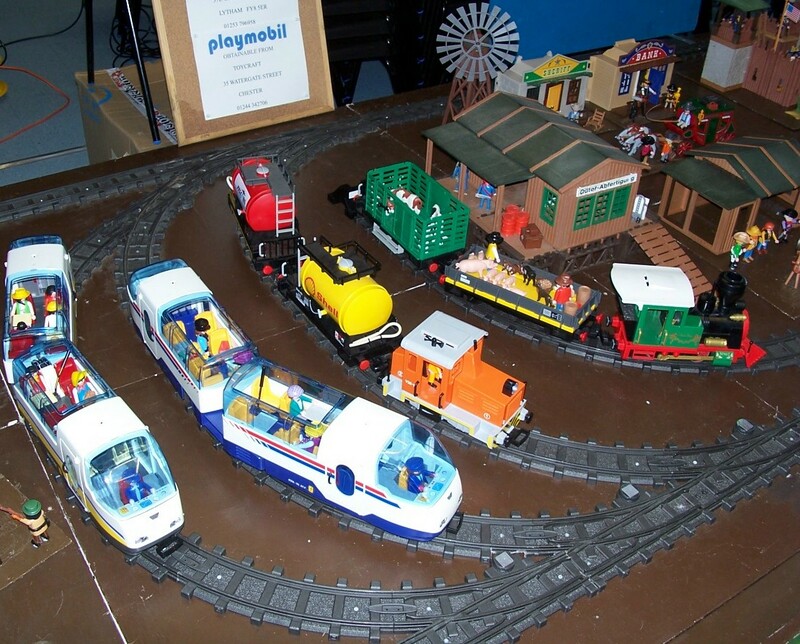 Wanting a cheap and easy way to fit the boards together, a development of the method used on the original layout was used. 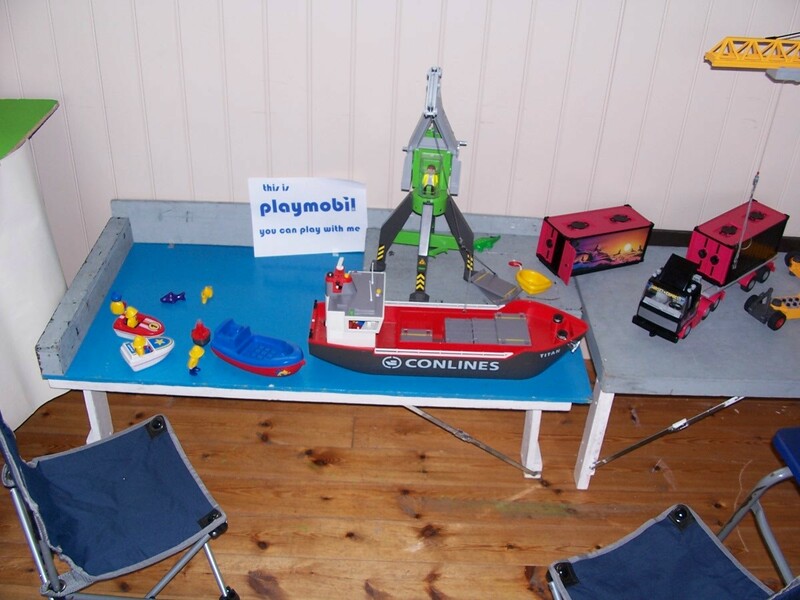 The basic principal is to have short pieces of wood sticking out from under the boards where they join; so that the pieces of wood interlock when the boards are place together. 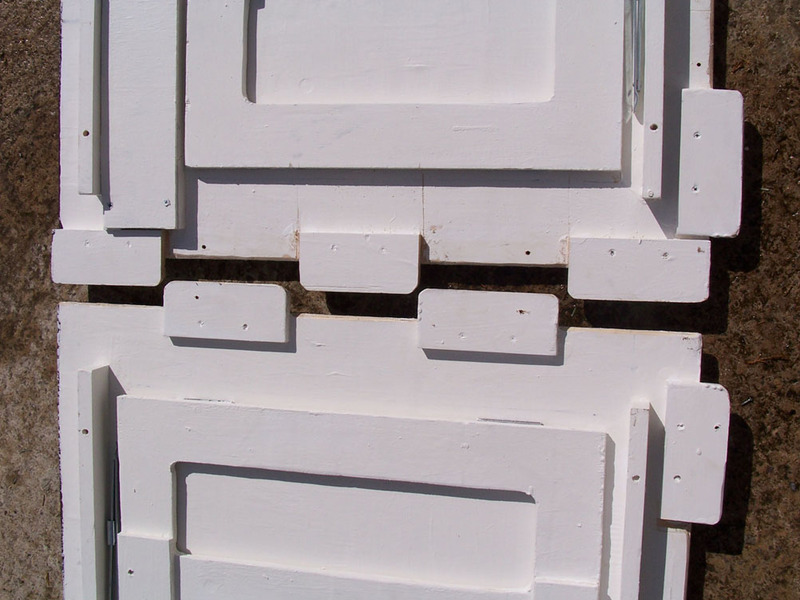 When the boards are in line small holes are drilled through the boards into two of the locking pieces of wood. 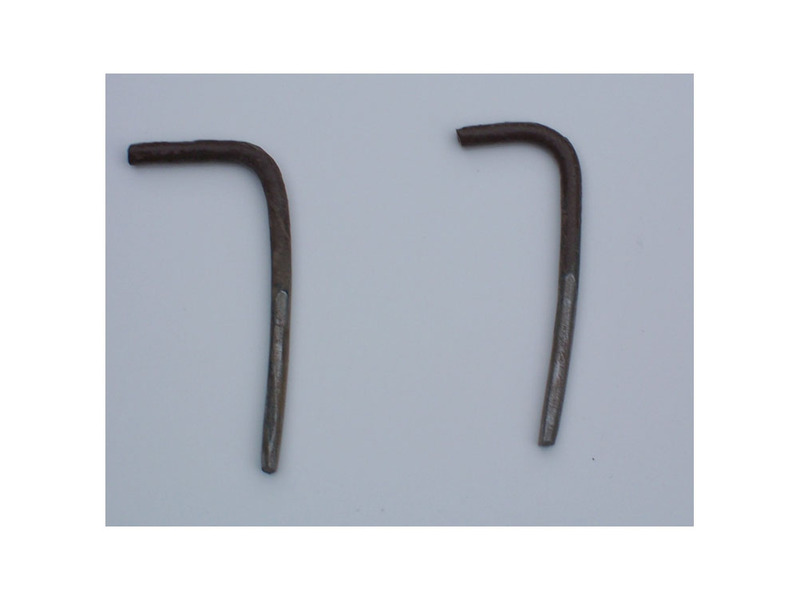 Two pins can then be inserted through the holes which will hold the boards together. 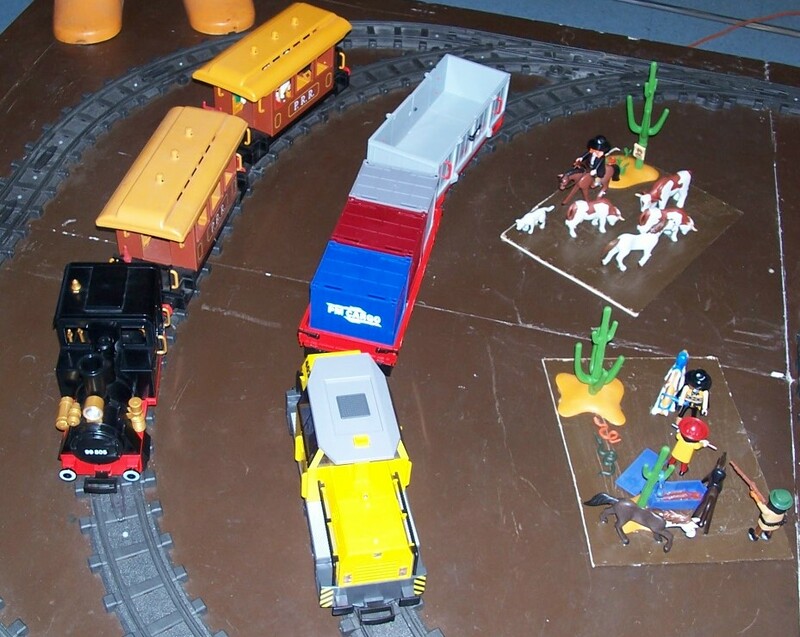 Try to arrange it so that the wood sticking out is near were the track crosses the joint. 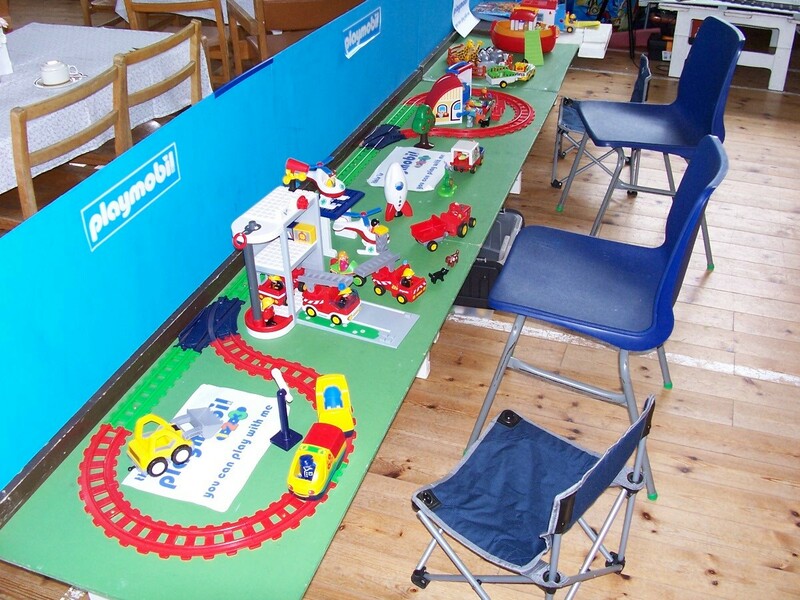 This also protects the track ends when the board is put on end. 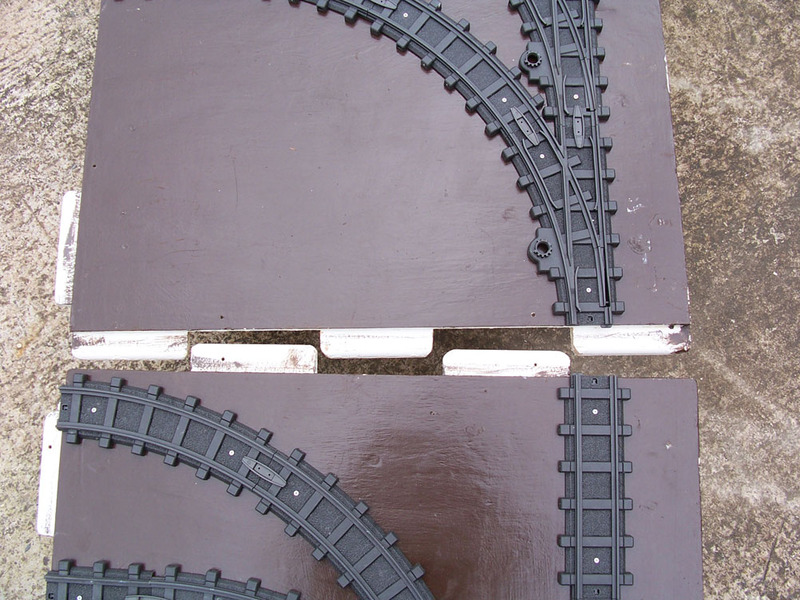 To help in putting the boards together the ends of the pieces are rounded. 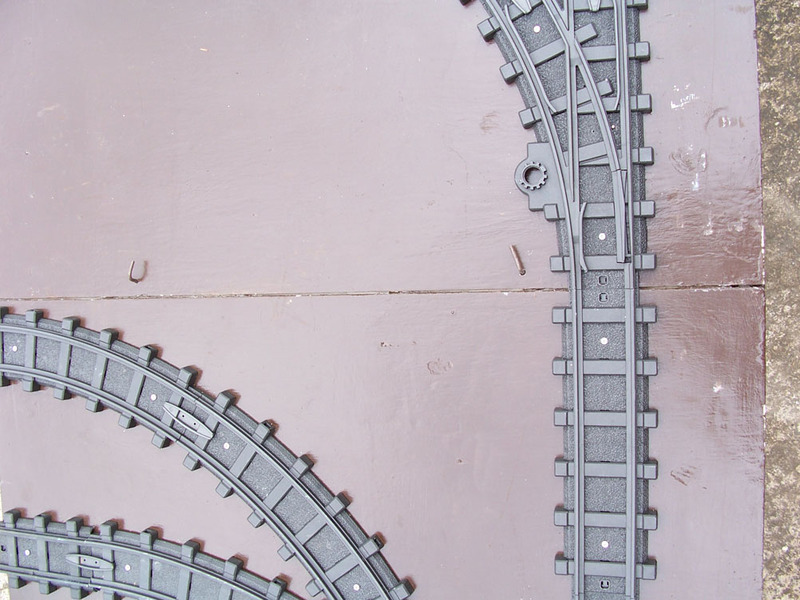 The top edges are also rounded where they go under the opposite boards, and underside of the boards also being rounded where the pieces slide under. 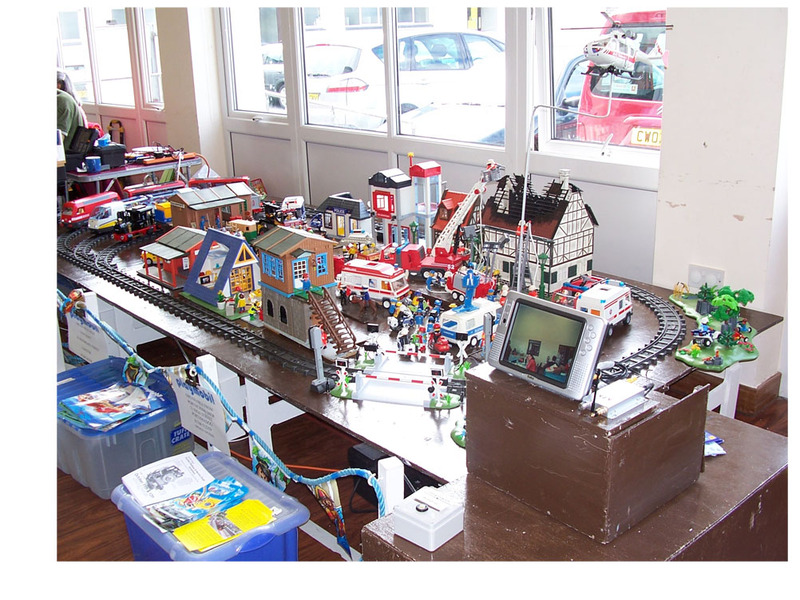 A small gap is left at the sides of the pieces to allow a small amount of movement when the boards are pushed together. 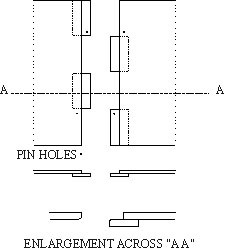 Inserting the pins will bring the boards into line. 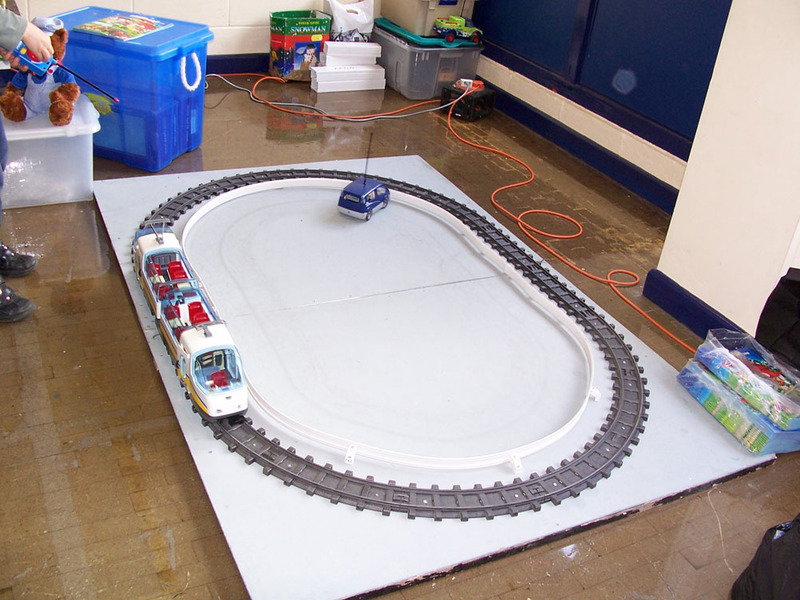 Putting a silicone furniture polish on the sliding surfaces will help when they are pushed together. 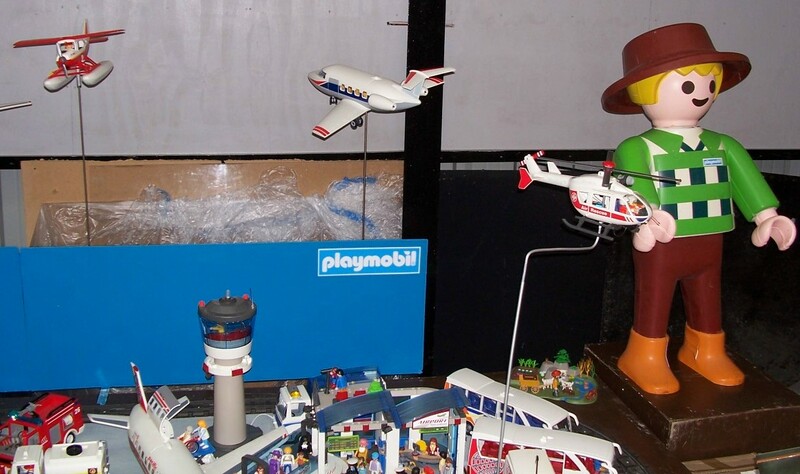 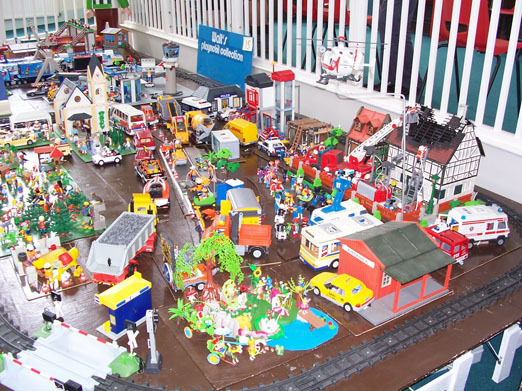 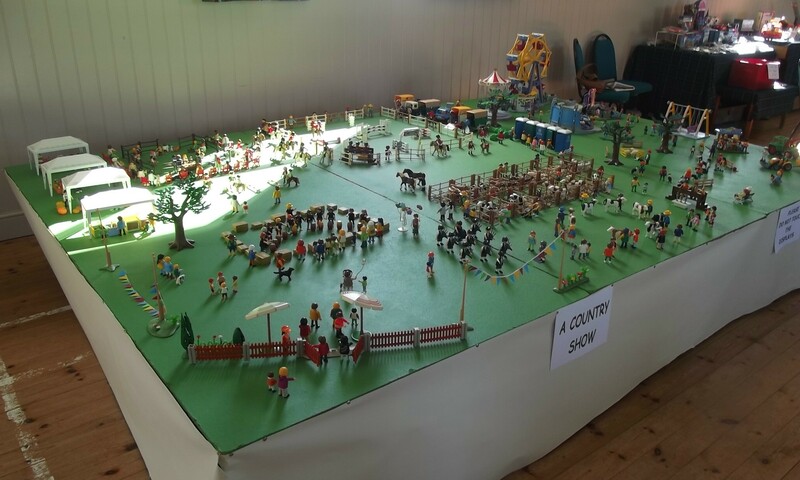 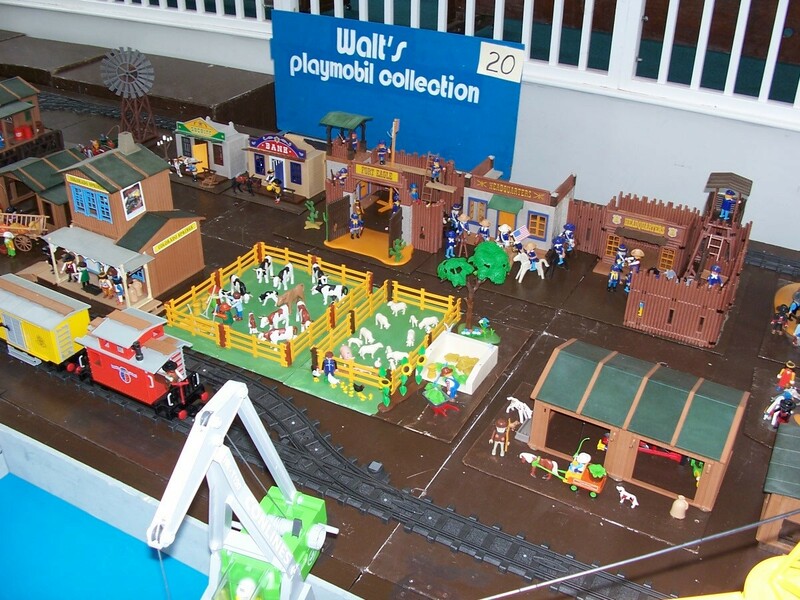 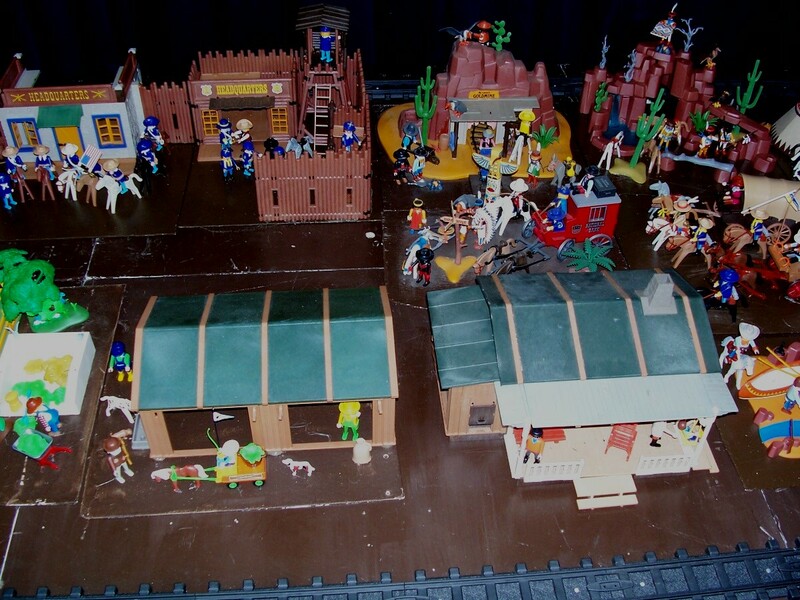 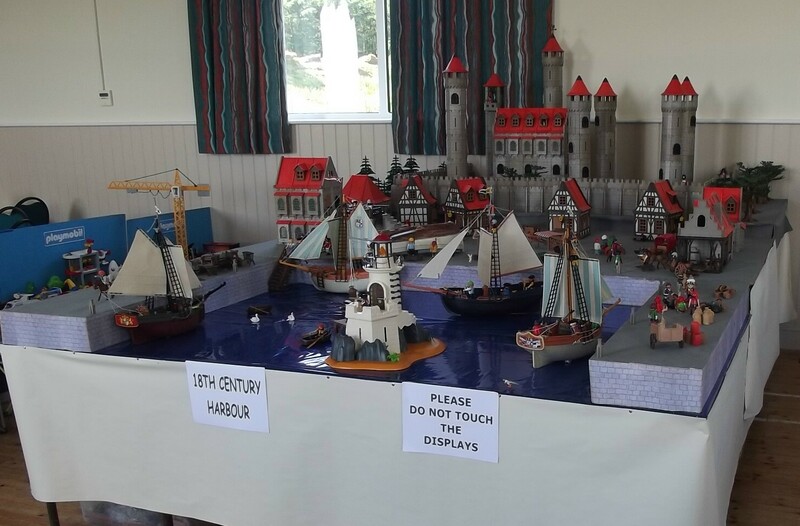 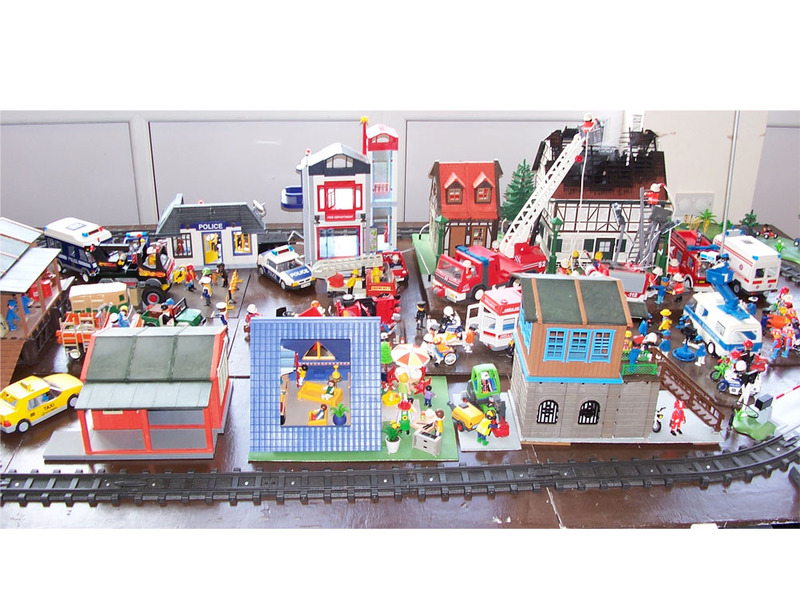 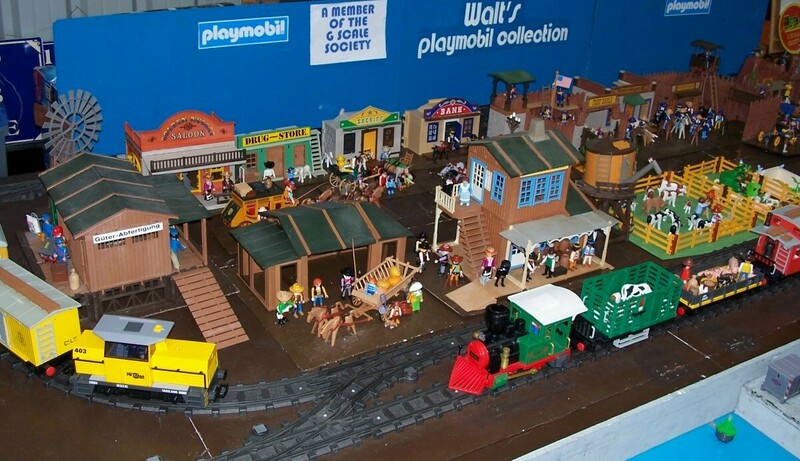 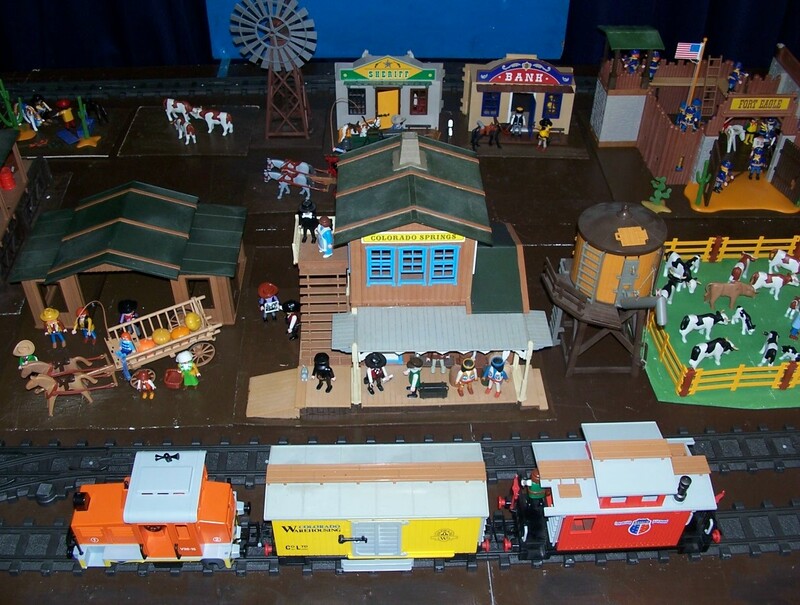 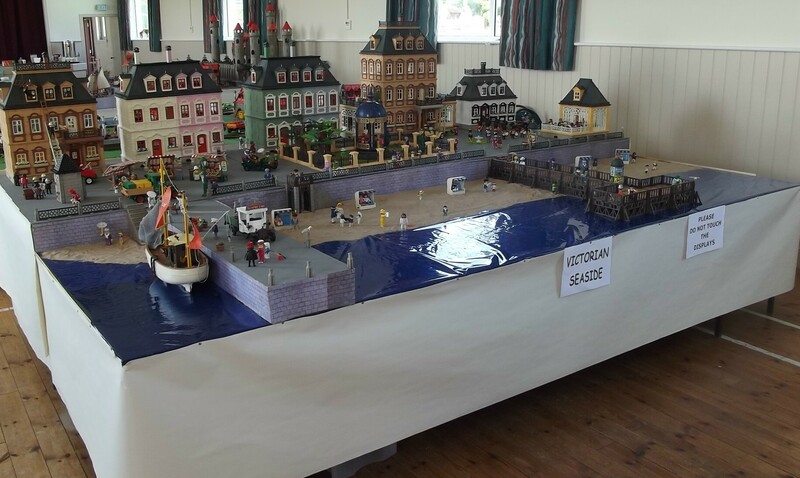 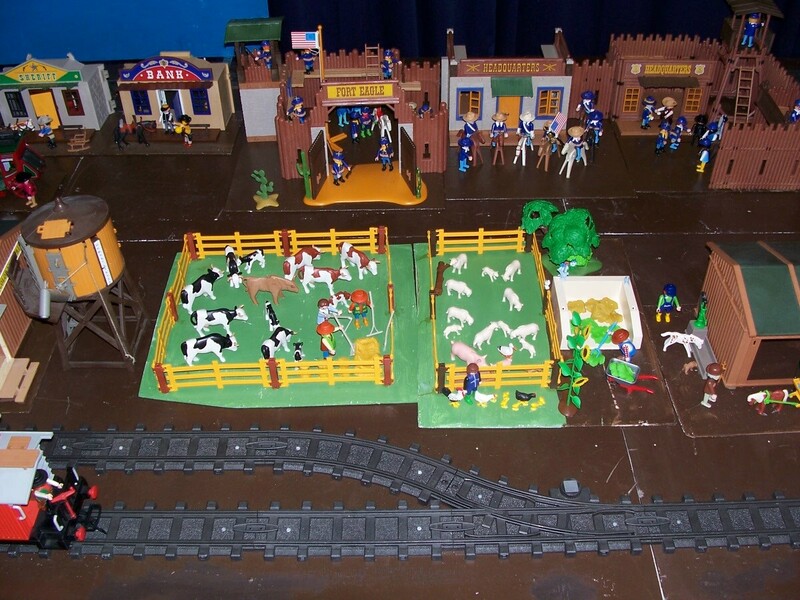 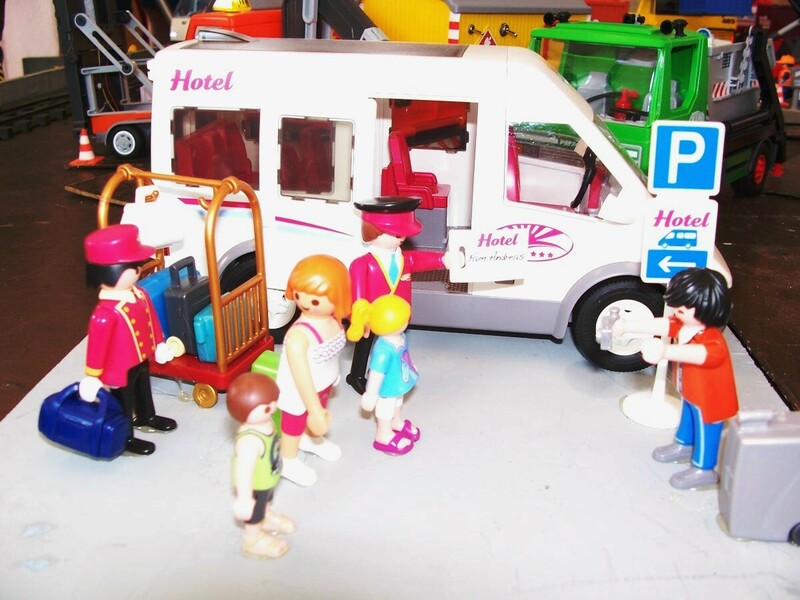 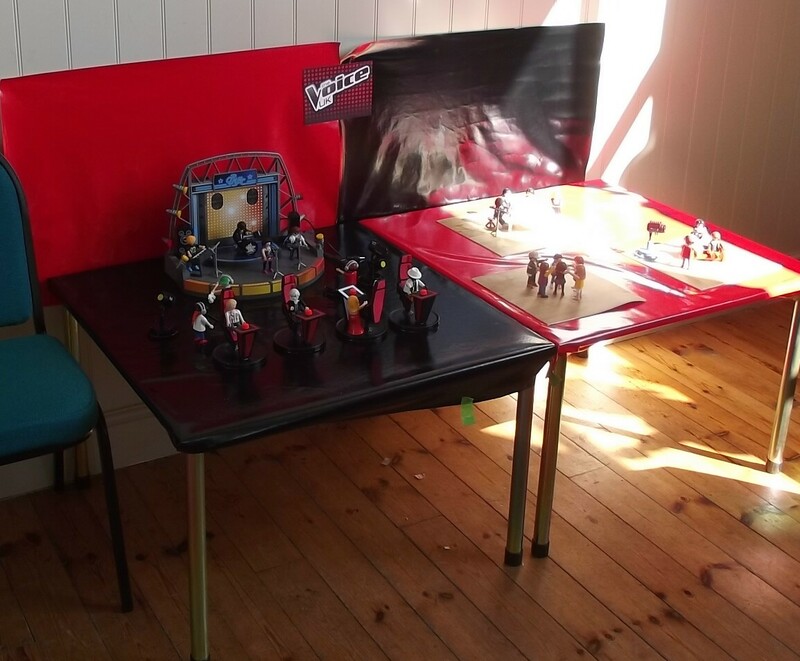 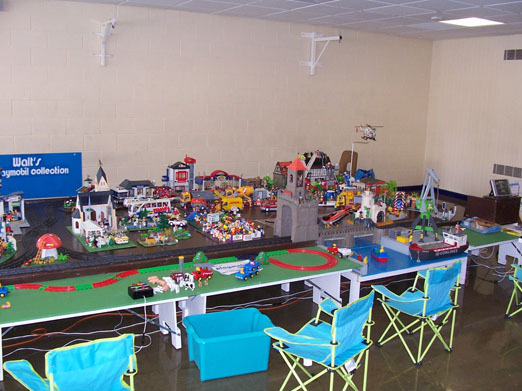 The dioramas from the original layout can be used, whereas they were mostly on boards 18" x 18" or 12" x 12" other sizes are also used to accommodate the Playmobil sets. 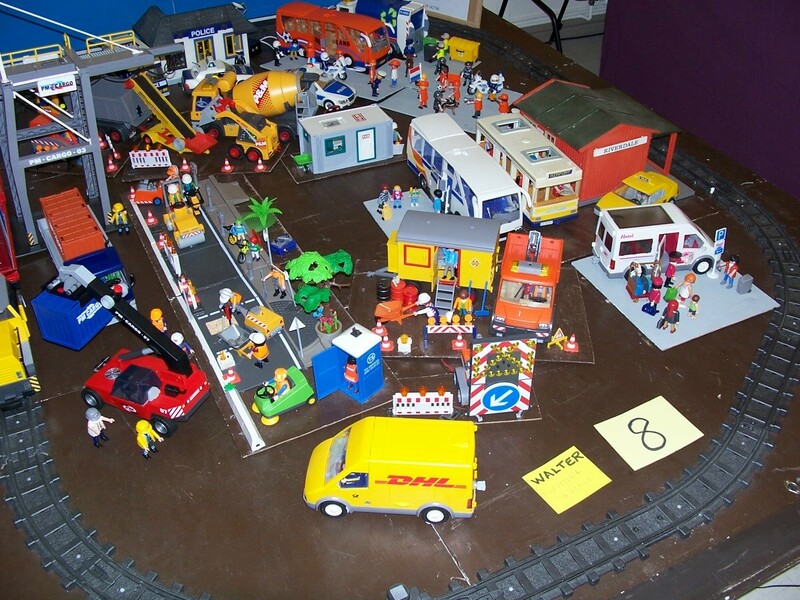 Also some of the vehicles are now placed loosely on the boards, but this is kept to a minimum to reduce set up time. 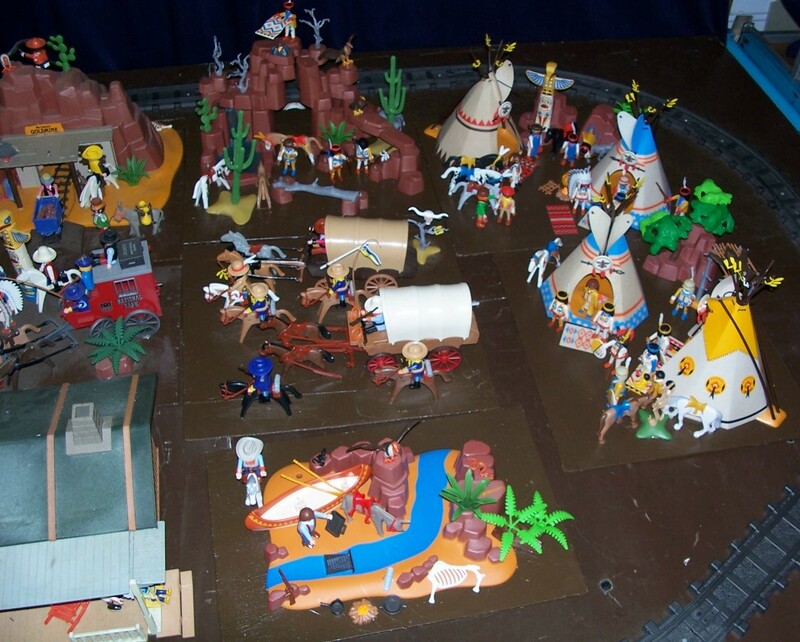 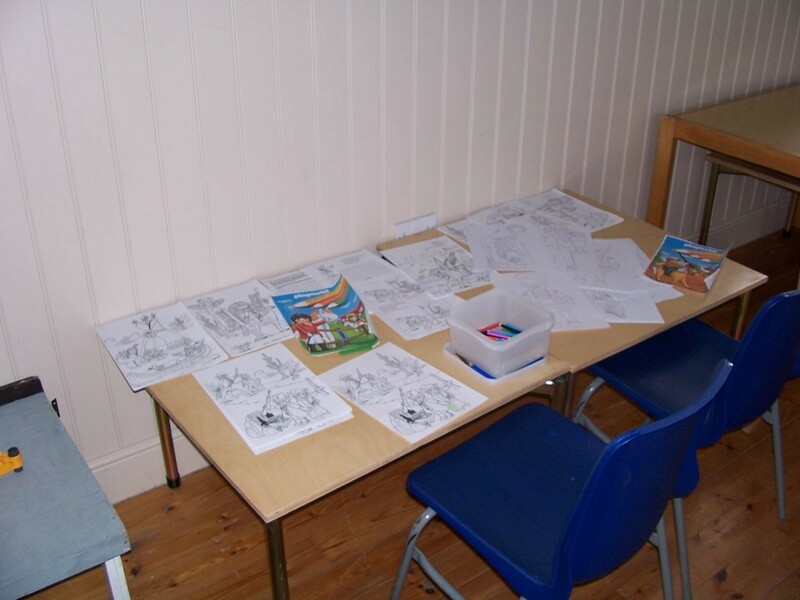 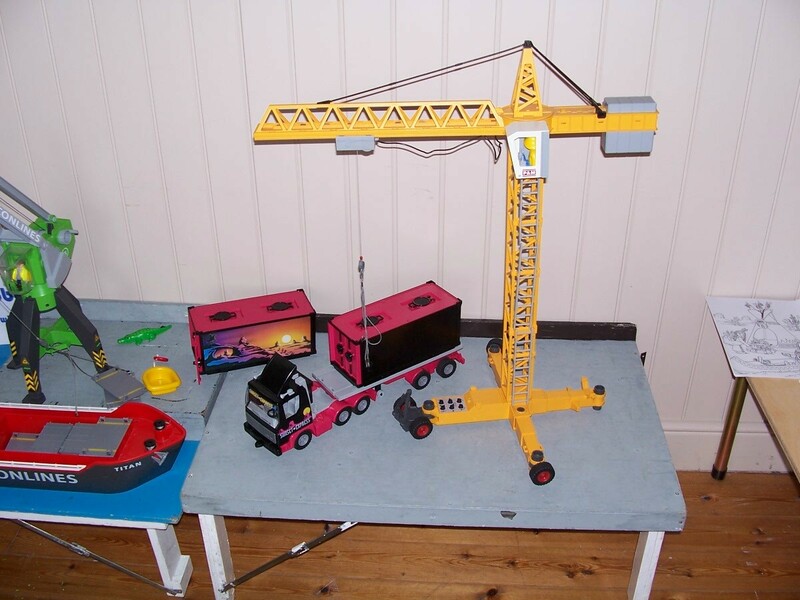 Therefore the dioramas can be used in different combinations that may be required. 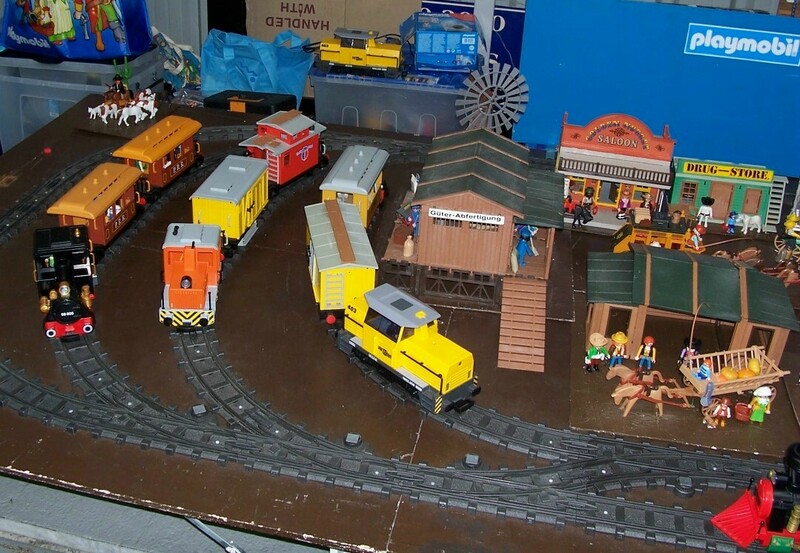 Below are photographs of the new layout and show some of the various configurations that are possible.